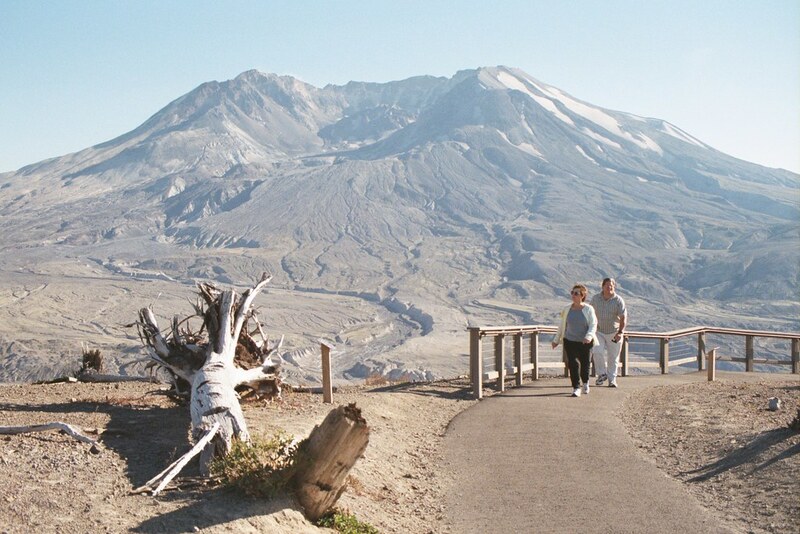 While this trip marked the second time I'd been to Washington, it was my first real visit through much of the northwest U.S. We started, however with a stop to visit family in southern California. 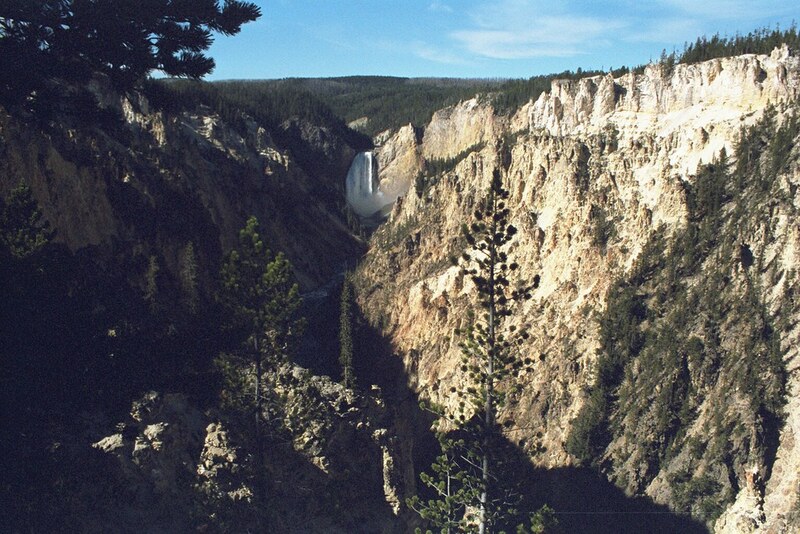 With the exception of about three images I used from a CD I purchased, all my photos in this set are PictureCD digitizations of the 35mm film I shot, which was the last vacation I used film. 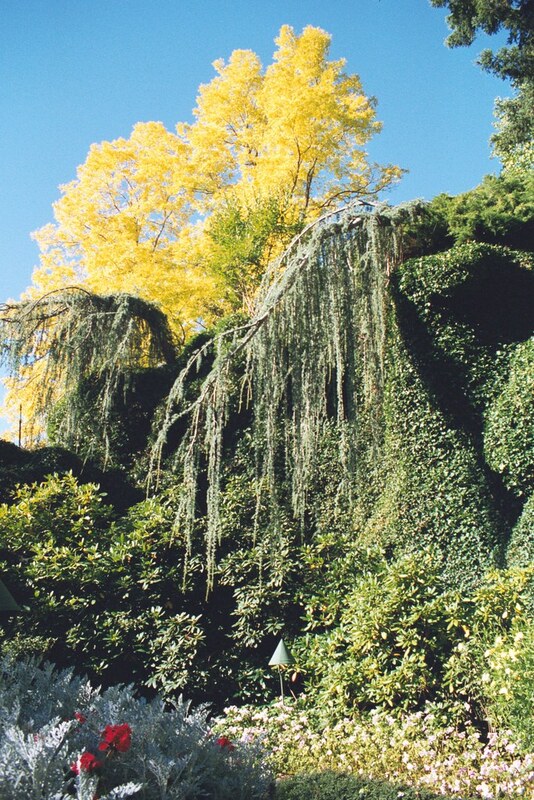 Everything that has come since has benefitted from the possession of digital cameras. 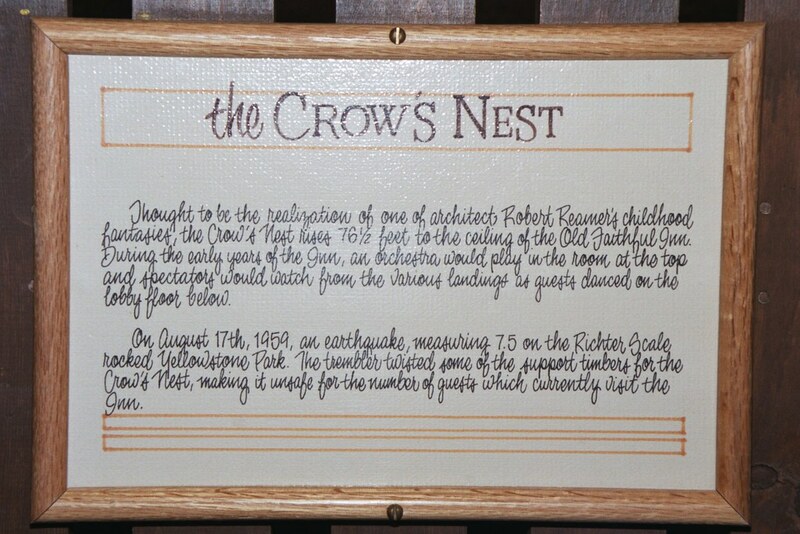 Our trip actually began in southern California. We hung out with my aunt, uncle, and cousins. 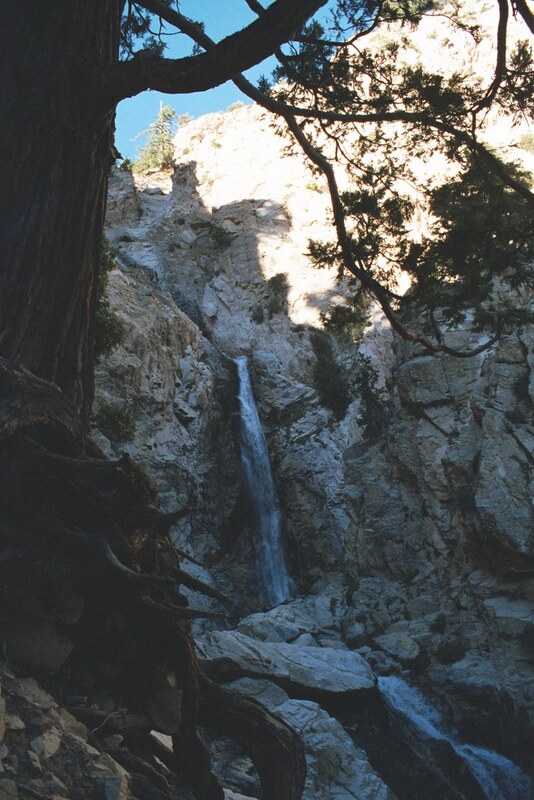 Saturday afternoon, we took a trip to the San Bernardino mountains for a picnic and a short hike to the waterfall. 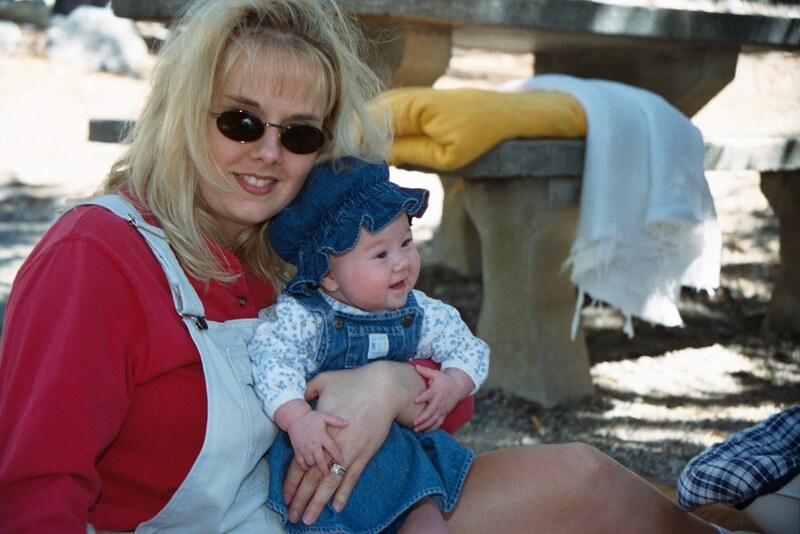 Ashlyn Rose Reiswig (held by her mom and my cousin, LuCinda), born February 13, 1999. 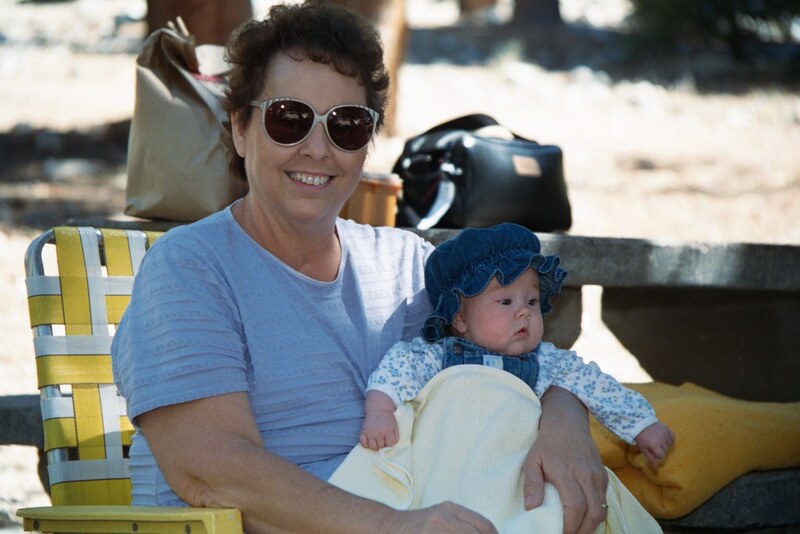 She was three months premature, and weighed only 2 pounds, 10 ounces at birth. As you can see, she was doing very very well, and there were absolutely no side effects of the premature birth. And, of course, she got passed around a lot! Everyone had to have their turn to hold her. This is Ashlyn with my mom. 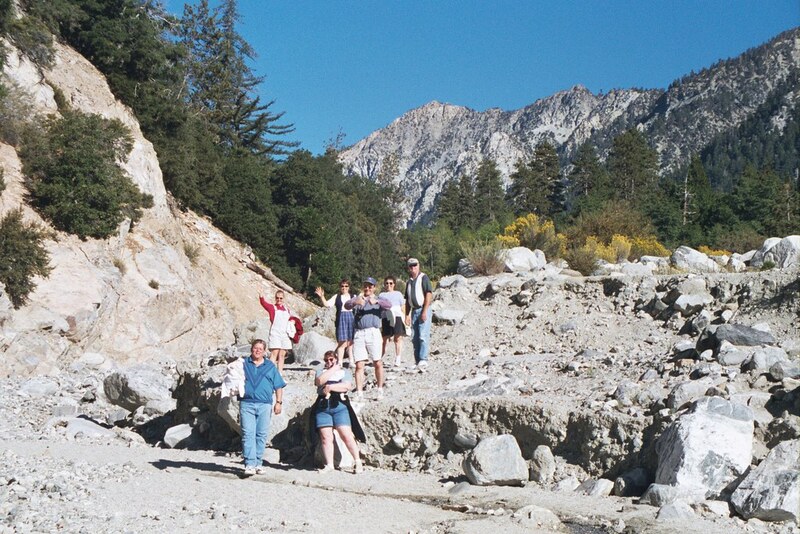 Here's the gang truckin' down the nearly dry riverbed, headed towards the waterfall. 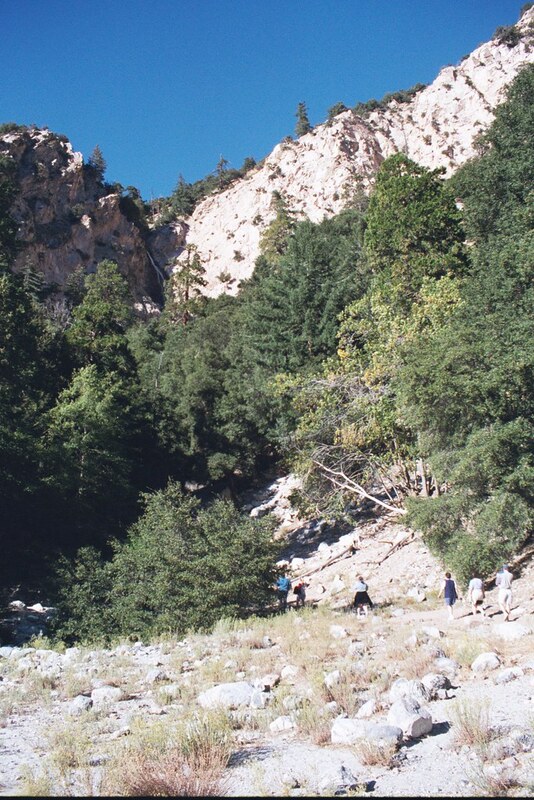 Still headed for the waterfall. 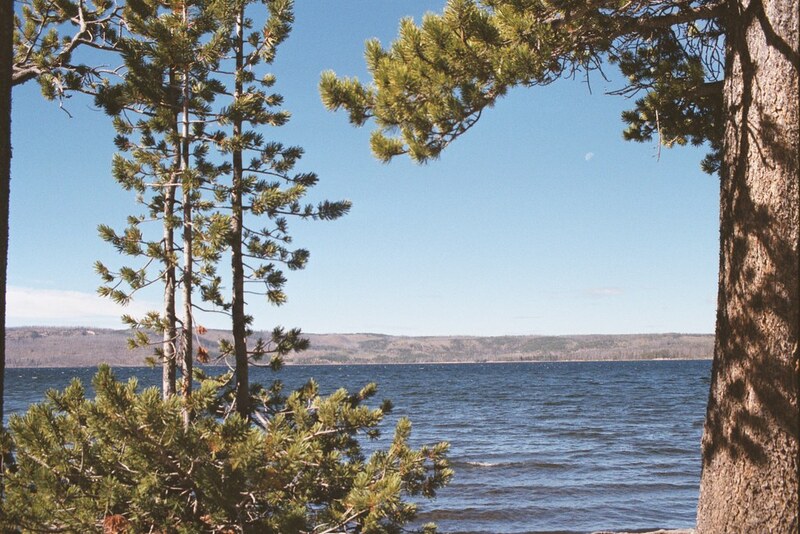 Pretty scenery. 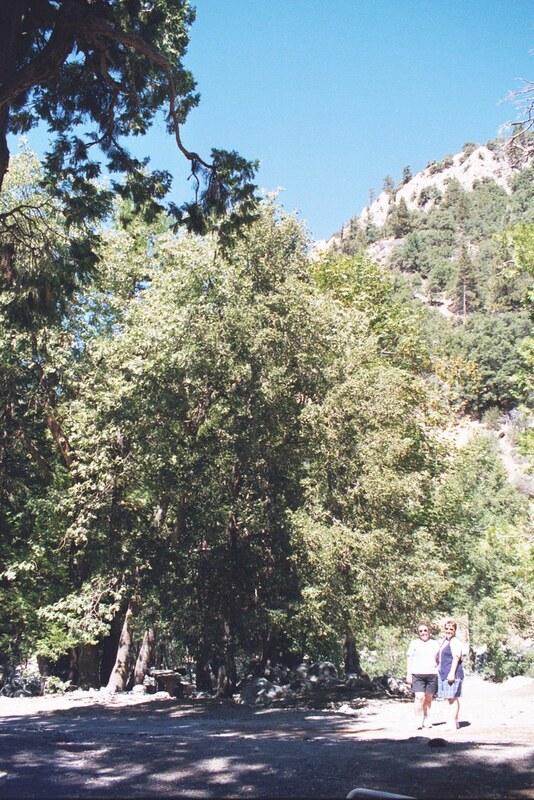 Never figured out if the others were really not up to hiking up the hill to where we could get a good view of the waterfall, or if they just wanted to play with Ashlyn (whom LuCinda wasn't about to haul up the hill). 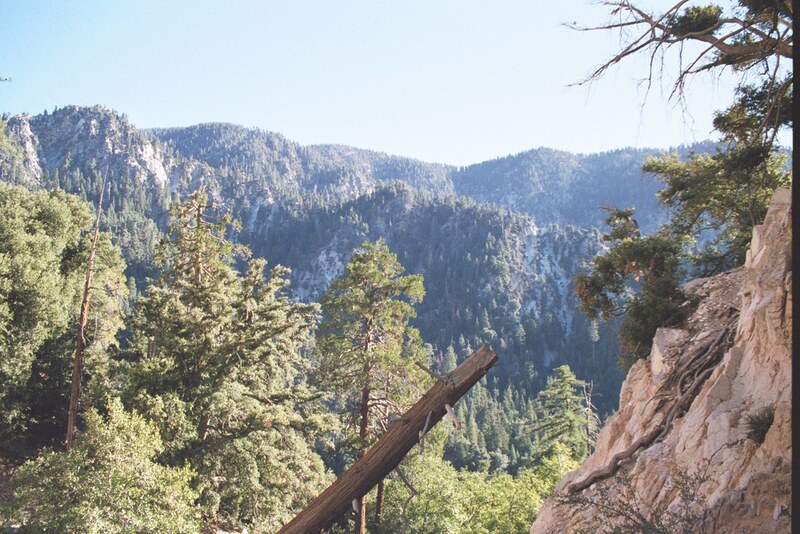 Whichever the case, only four of us went all the way. 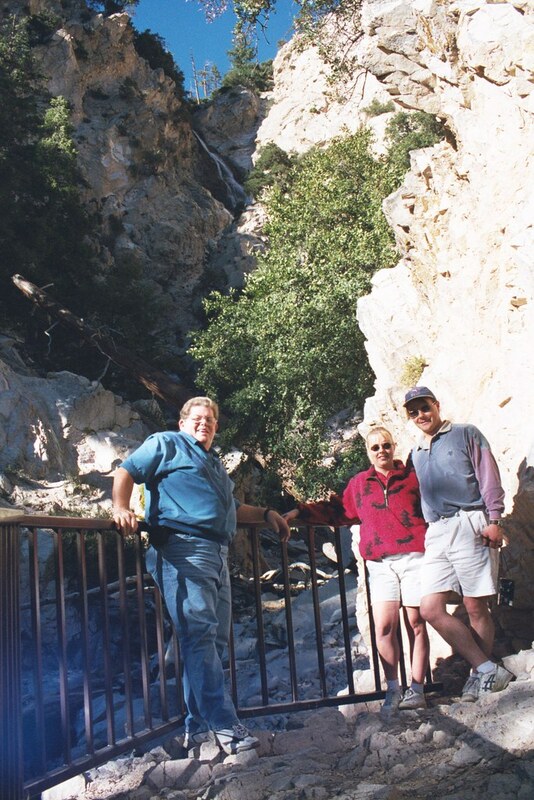 This is my dad, LuCinda, and her husband, Kent. A look back as we climbed to the waterfall area afforded a really nice view of the valley we drove into to access the park where we had our picnic. 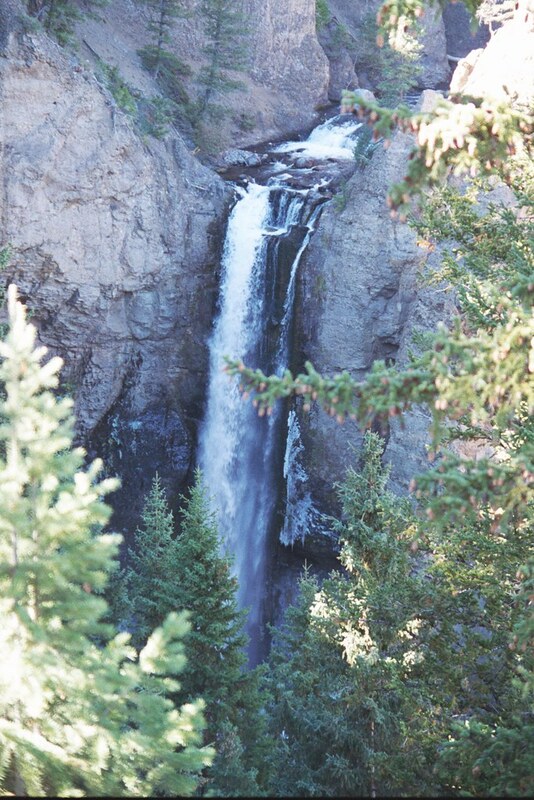 And, at last, we reached the waterfall. 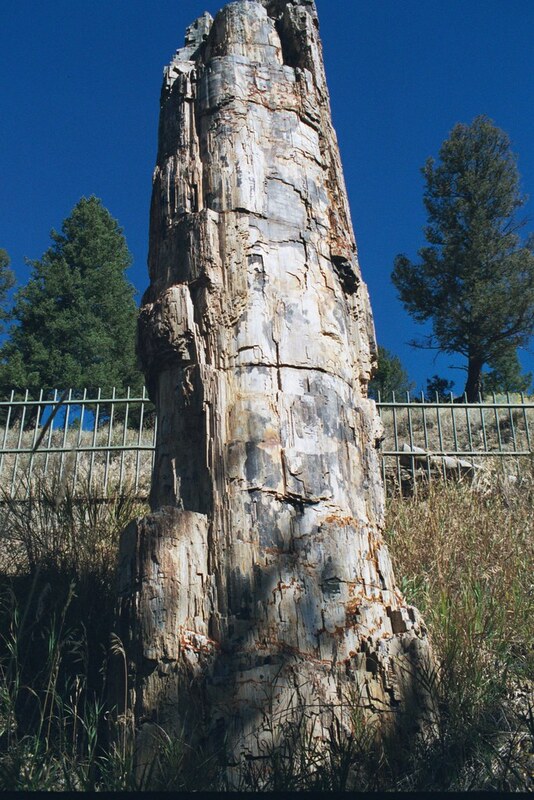 Yeah, okay, I know it doesn't look like much. It was better than the picture would have you believe! 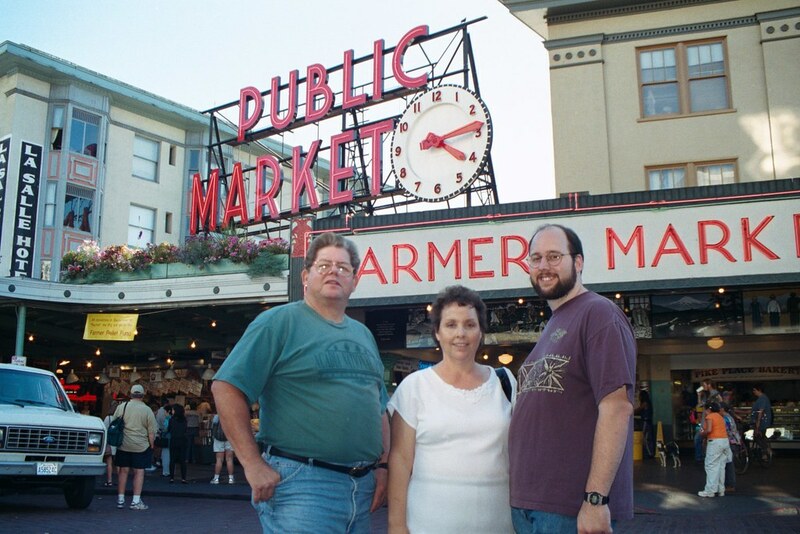 So, after a few days in California, my parents and I flew up to Washington and stayed at my brother's house on the west side of Puget Sound, across from Seattle. 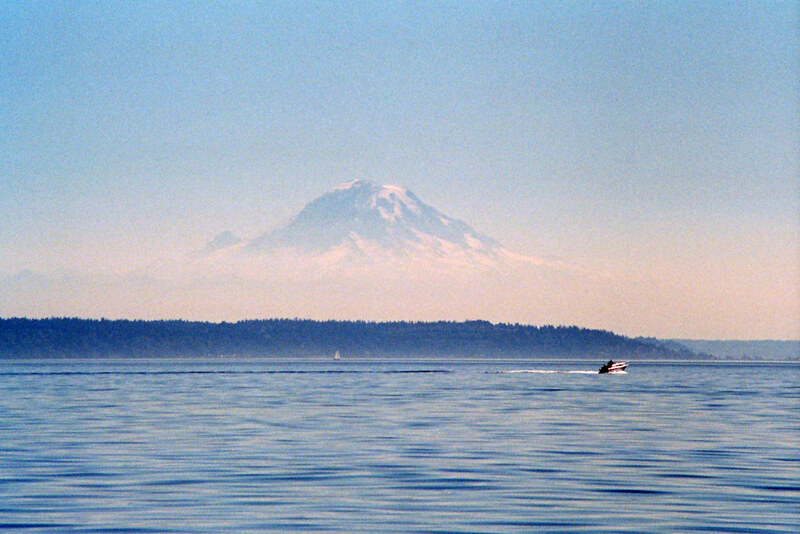 The following day, we took a trip to downtown Seattle by way of the ferry. 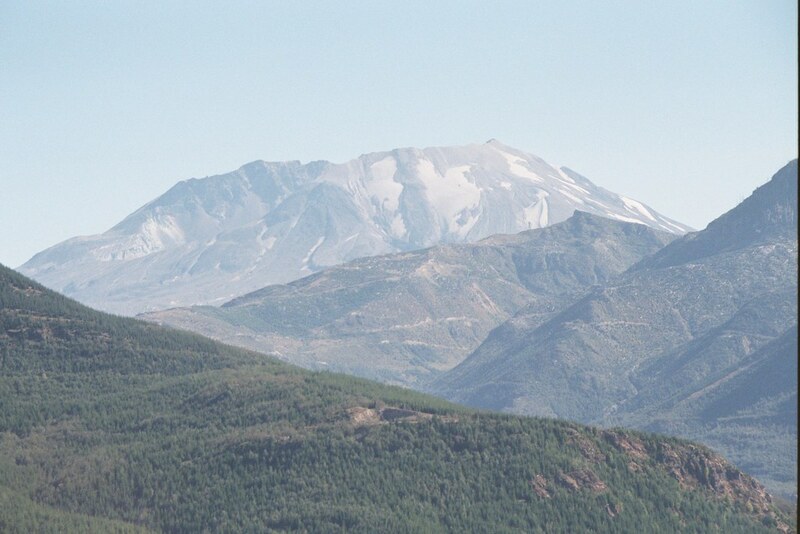 On the trip, I snagged a quick photo of Mount Rainier. 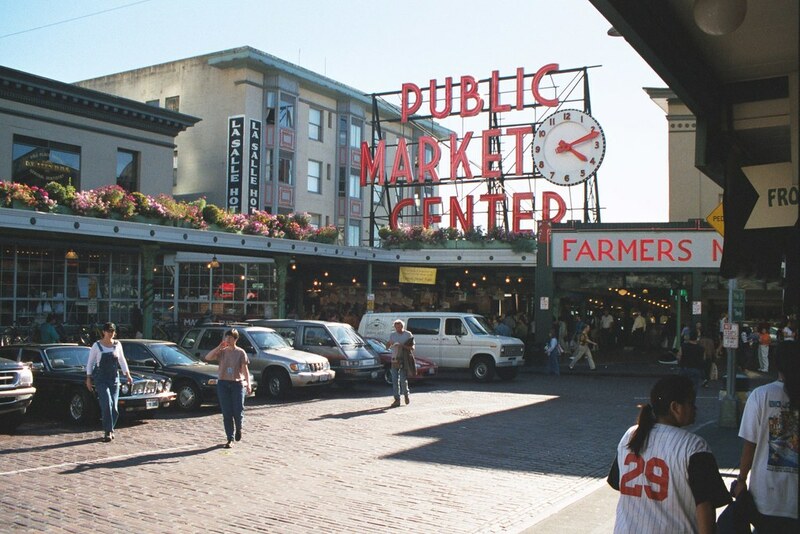 We didn't plan to do a lot in Seattle…just mill through the Pike Place Market. 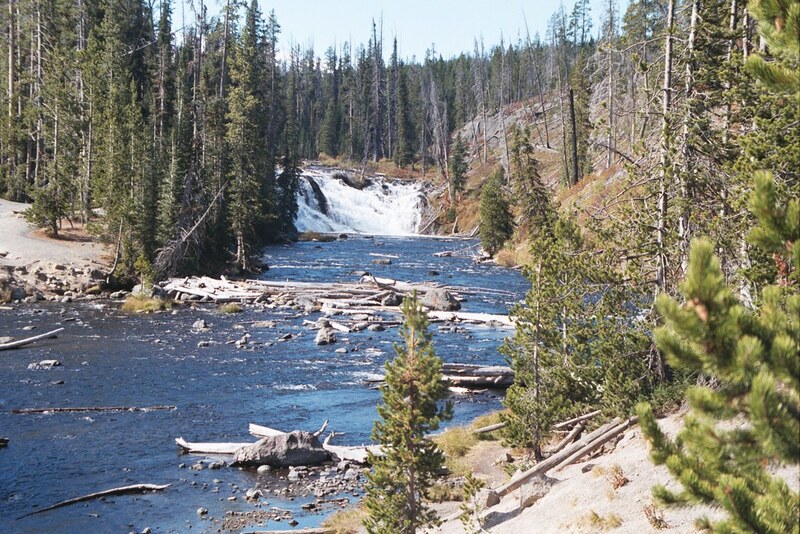 This is a totally radical place. Oh yeah, obligatory group photo. 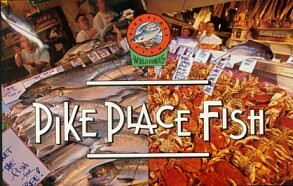 All right, I DID take two pictures of the fish being hurled at the Pike Place Fish market. 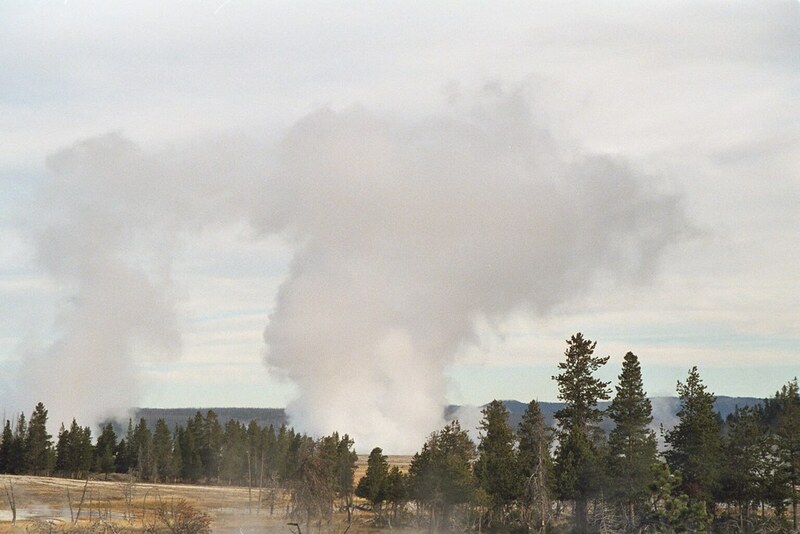 Somehow, these two photos got exposed in the same location on my film, creating an unusable double image—seen in the next photo. 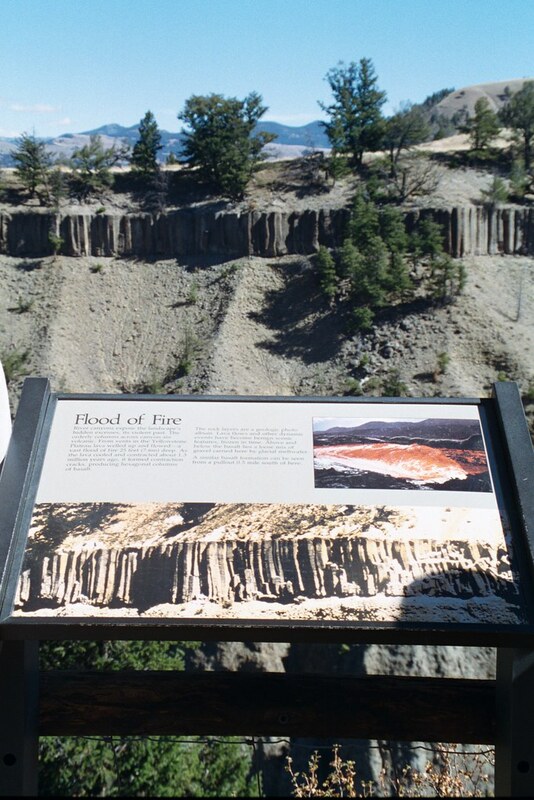 Hence, my original album just had this digital post card instead. Oh well. It was still fun and amusing to watch. I'd first seen this spectacle one day while flipping channels on the tube. Stopped on MTV to find out why they were showing images of fish being thrown around. Turns out, it was an episode of The Real World: Seattle. Some of the cast were lending (or attempting to lend) a hand with the work. 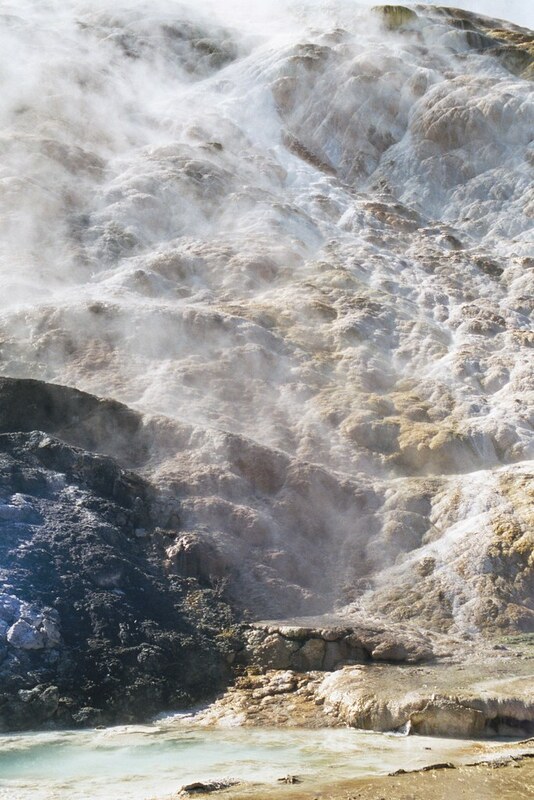 It was very cool to find this same location I'd seen on MTV. Here's what happens: customers inspect the fish and other seafood in ice-packed cases on the lower, front section. Workers are down there to help. When you make a selection to purchase, the worker picks up whatever you chose, engages in no small amount of hollering in some Asian language which results in an equally unintelligible, albeit loud, reply. Your merchandise is then hurled by the worker from the lower level to the people on the upper deck who catch the seafood and box it up for you to take with you. 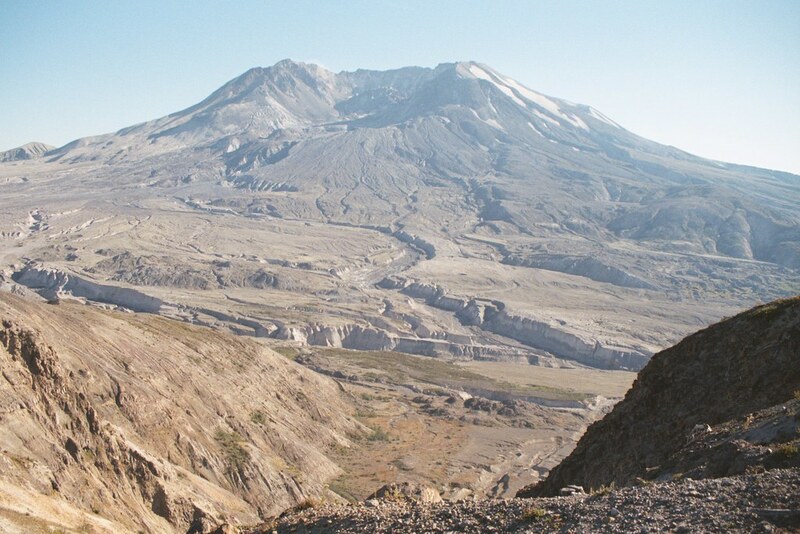 It's worth the trip to Seattle just to see this! 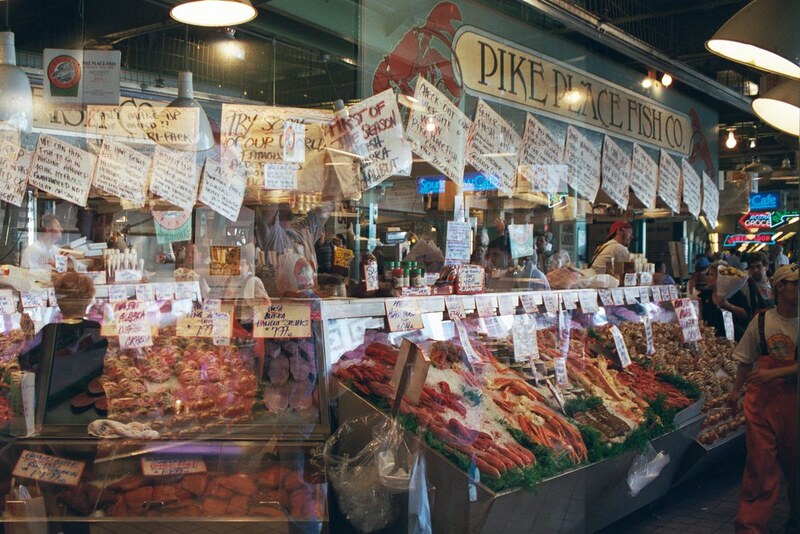 My double-exposed shot of Pike Place Fish, as described in the previous photo's caption. 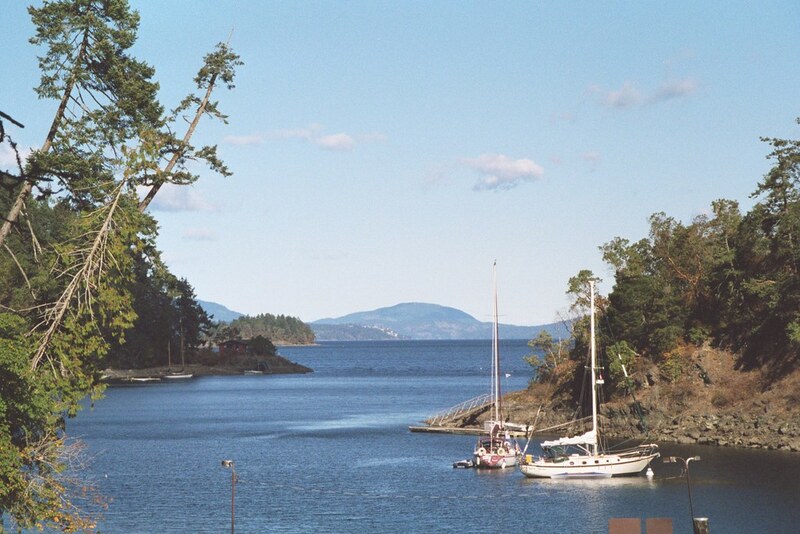 For the weekend, five of us (my parents, my brother, his wife, and myself) piled into a car that really wasn't meant to haul five people for more than a couple miles, and drove to Port Angeles where we caught a ferry bound for Victoria on Vancouver Island in British Columbia, Canada. The entire weekend was pretty nippy and drizzly, but it didn't prevent us from having a fun time. 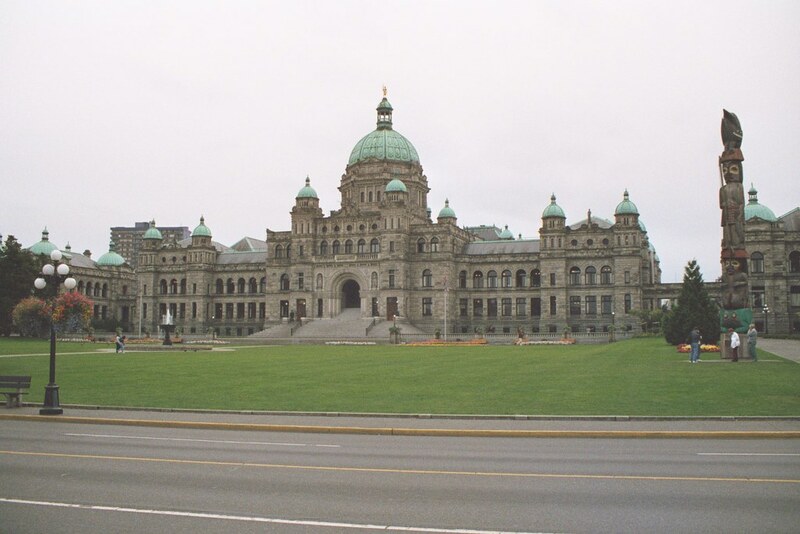 This picture is of the Parliament government building in Victoria. 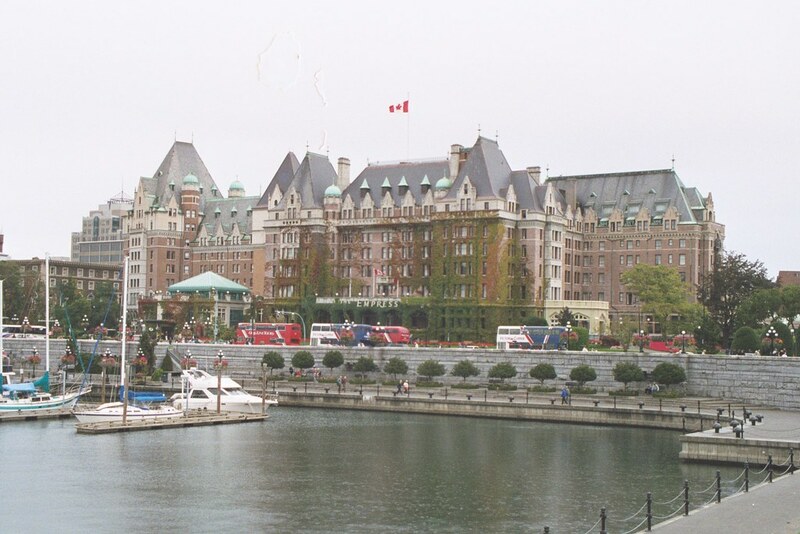 Directly caddy-cornered to the harbor where the ferry and any other boats dock is the Empress Hotel. 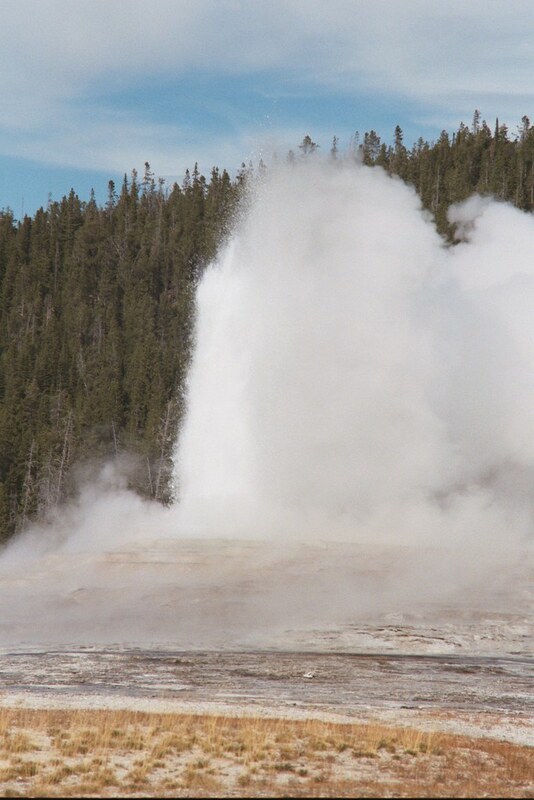 It's very swanky, very expensive, and very famous. I'd never heard of it before, but hey…lots of things are famous that I've never heard of before! 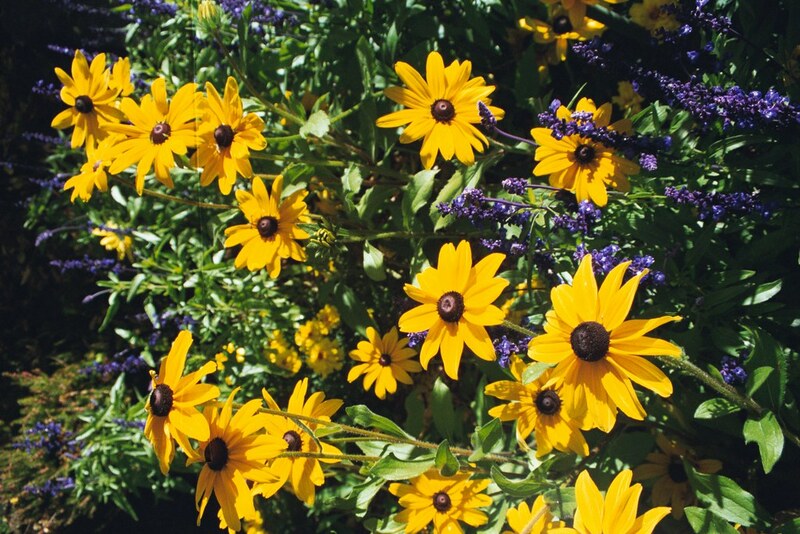 If you like flowers (and, unless you have allergies, who doesn't like flowers?) 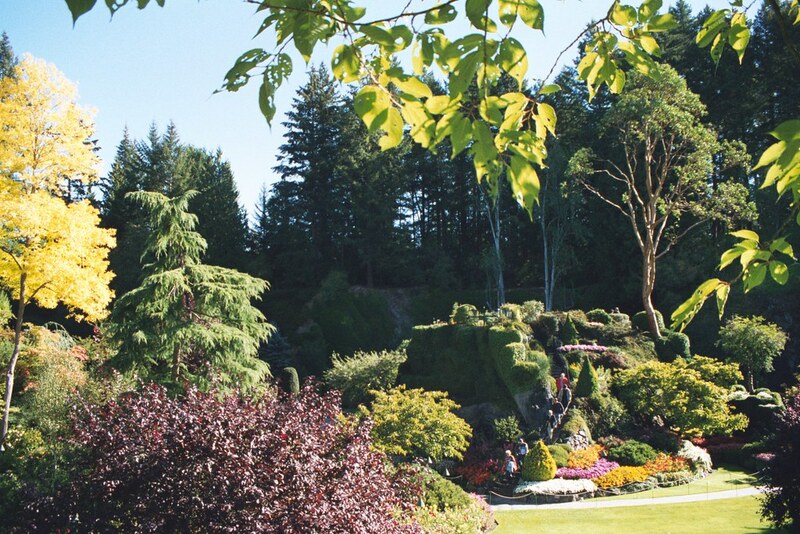 Butchart Gardens is one of those "must-see" attractions. 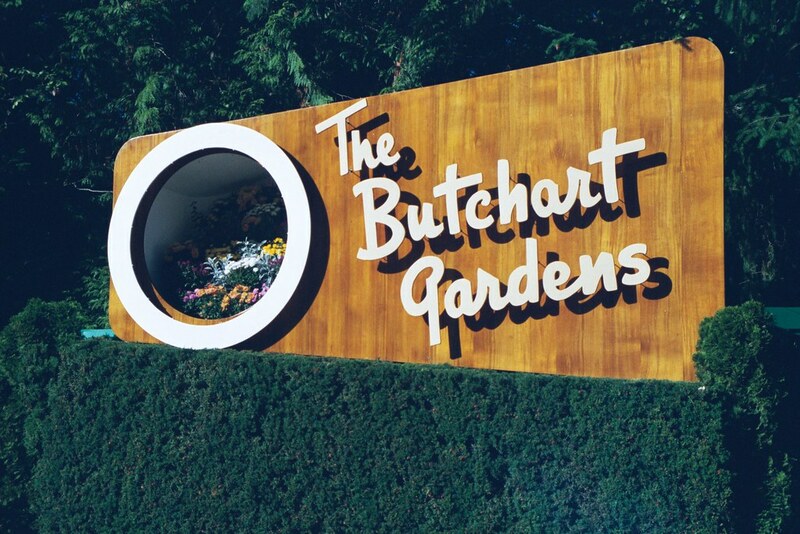 Butchart Gardens was a rock quarry of some sort, aeons ago. Details of it's history escape me at the moment, but essentially, the wife of one of the quarry's honchos turned it into the garden after mining this land had terminated. Not nearly the quantity of fall colors on this vacation, but what was lacked in quantity was arguably compensated for in quality. 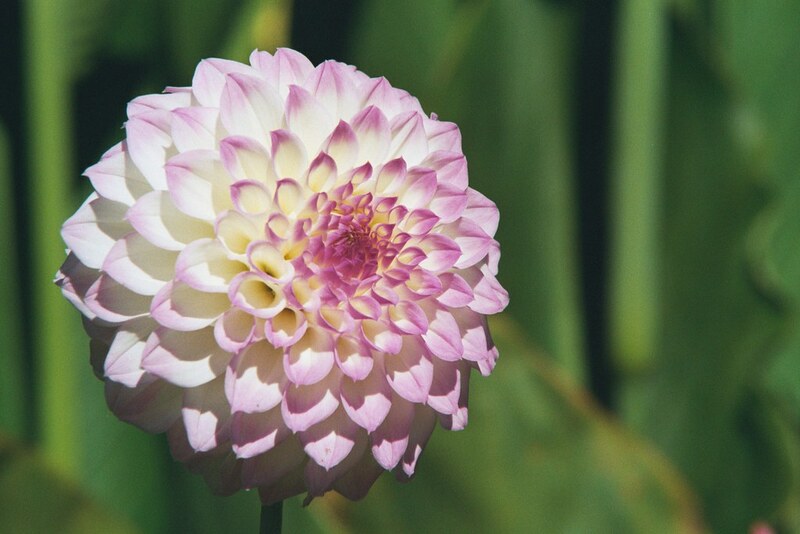 You'll have to ask a botanist if you want to know the names of the flowers I took pictures of. I haven't a clue. I just knew they were pretty, and I wanted a picture. 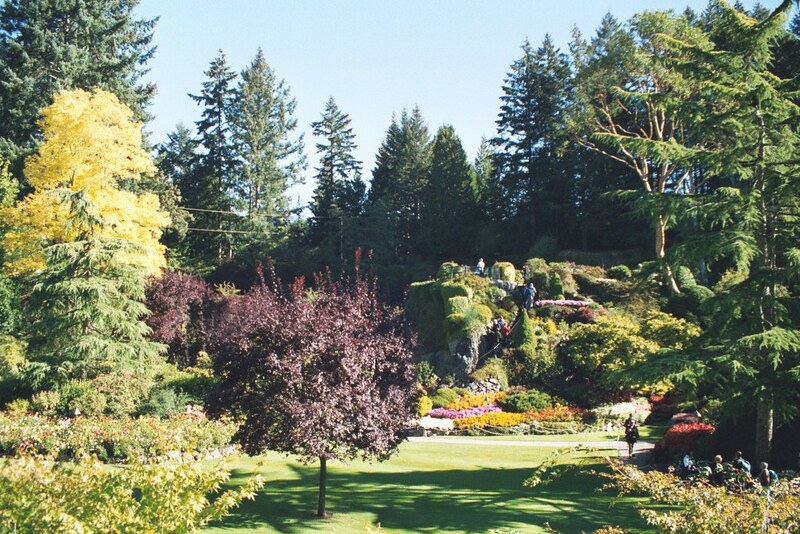 In the center of the picture is a built-up terrace (probably made from piles of rock left behind from the mining) from where you look out over this lower basin area of the gardens. 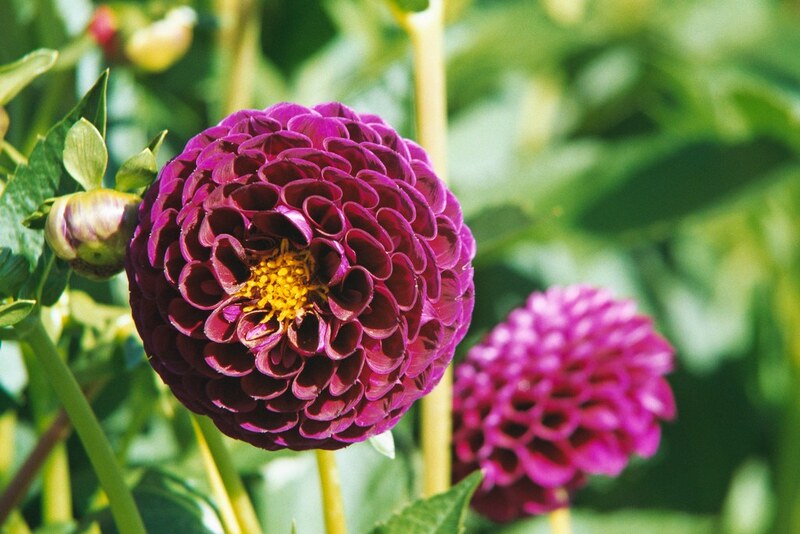 I almost could've bet (if I hadn't known better) that some of the flowers were really just those flat paper-mache fold-ups which open up in a honeycomb-like arrangement…they were that perfect. 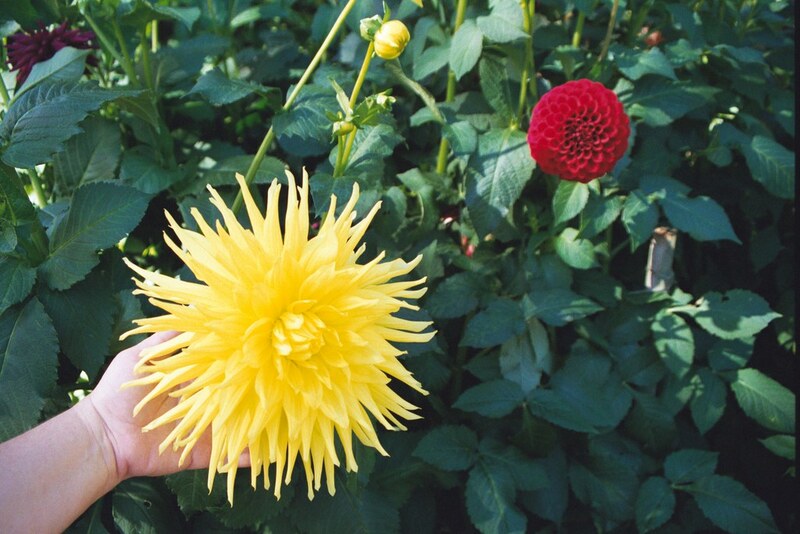 I told my mom to sort of hold this flower up as I took the picture so as to give some kind of idea how big it was. 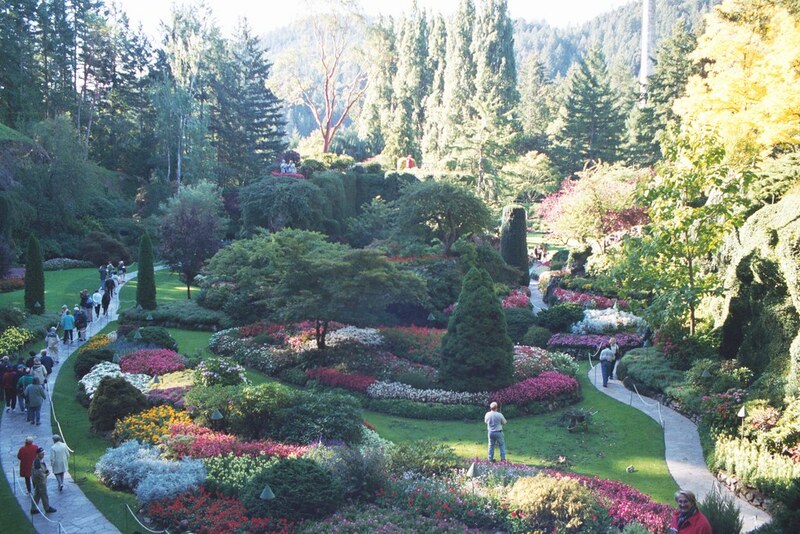 The opposite end of the gardens overlooks a beautiful bay. 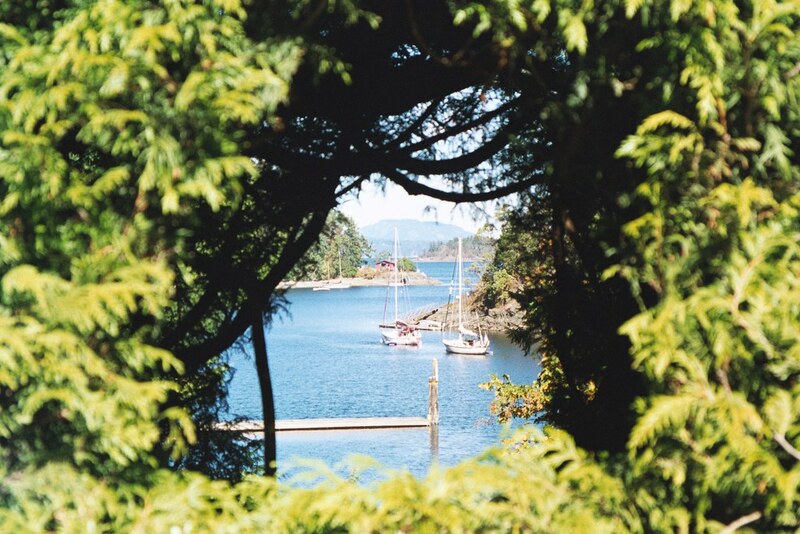 Another obligatory photograph, considering the landscapers purposely cut a hole in the hedge for no other reason than for taking a picture through it. 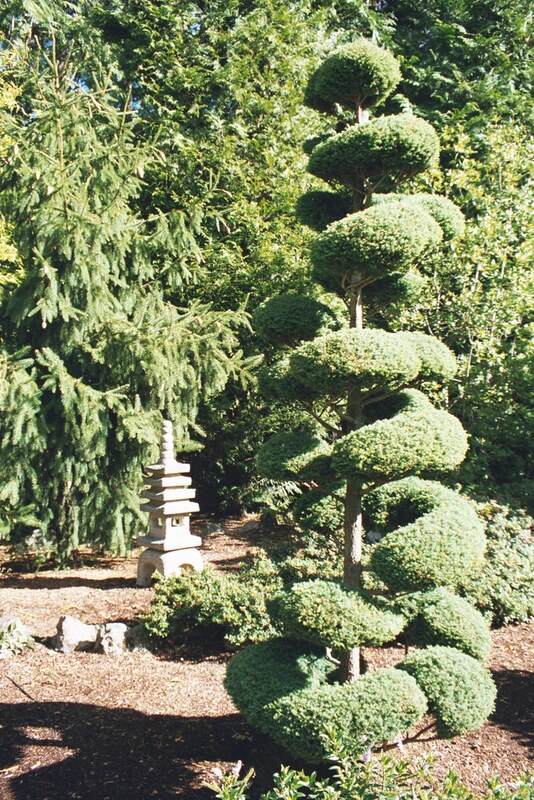 There's also a Japanese garden section. Later, we took the tour of the National Geographic museum in Victora. 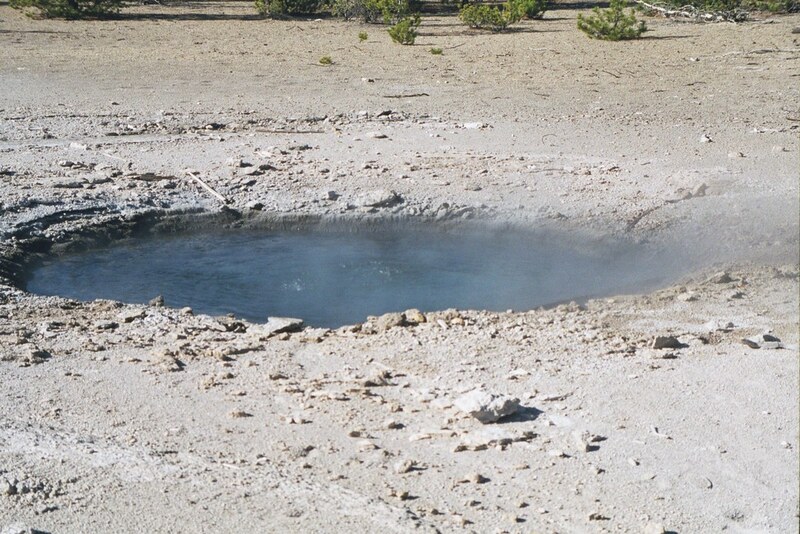 Had such a great time in there, I kinda forgot to keep the camera going. 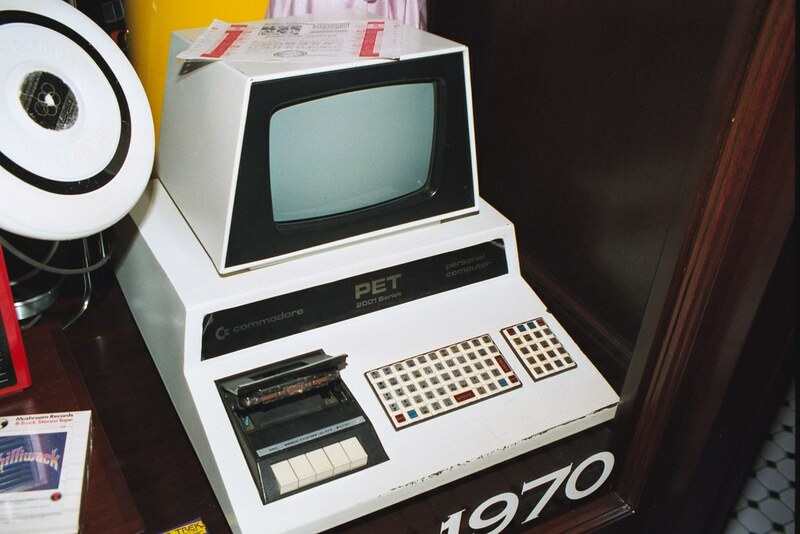 I did, however, snap this shot of an old Commodore PET computer. I'd never seen one this close before. It's only significant to me because at various points in my teen years, I owned a Commodore VIC-20, later a Commodore 64, then a Commodore 128 before I bought my first Macintosh. In a case near the Commodore PET was this old Blickensderfer typewriter. Honestly, I'd never heard the company name before, and especially have never seen a keyboard arrangment like this one. Note the cylindrical-like predecessor of the more modern spherical type ball element. I'm trying to find out the name of this keyboard arrangement (i.e. 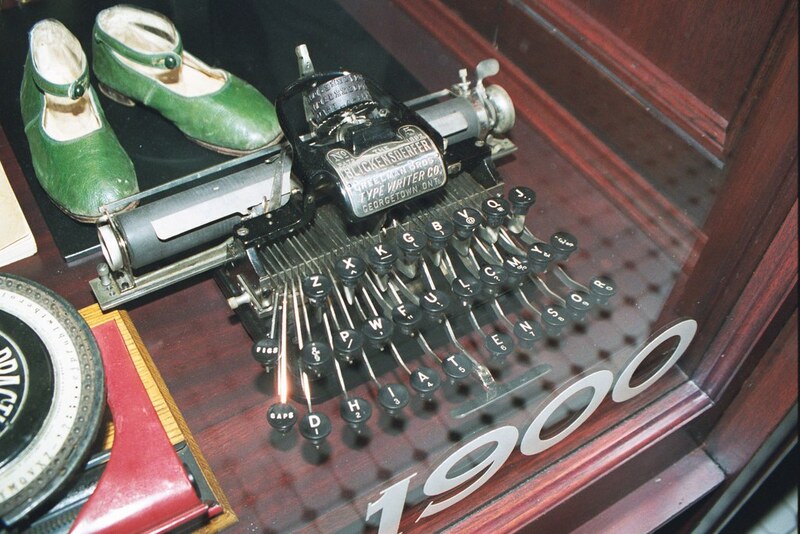 most people know the QWERTY layout, and some use the Dvorak layout). UPDATE: blessed be Wikipedia. Just like the QWERTY arrangement is named after a series of letters on the top row, this one is named DHIATENSOR for the letters on the bottom row! 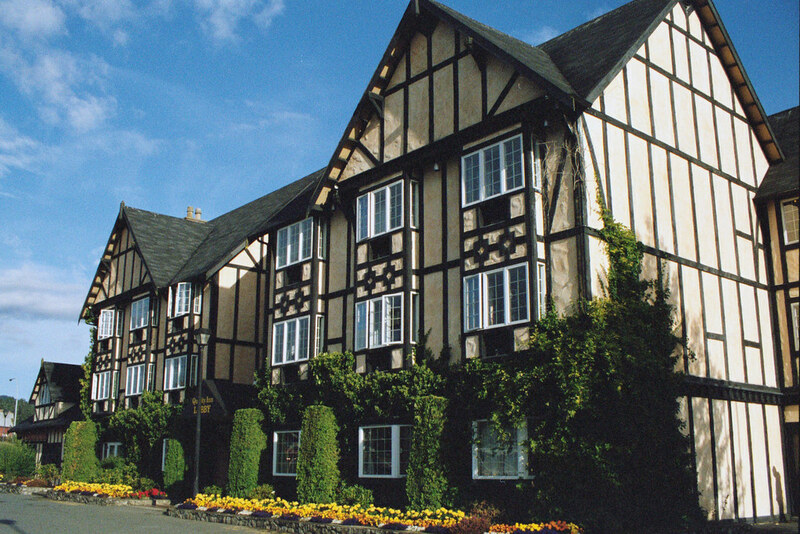 The Waddling Dog Inn served (quite well, I might add) as our accomodations during our weekend in Victoria, B.C., complete with a real, live, waddling basset hound who hung out in the foyer or, more frequently, in the back office area. There was even a photo album in the dining area guests could flip through, chronicaling the dog's travels. 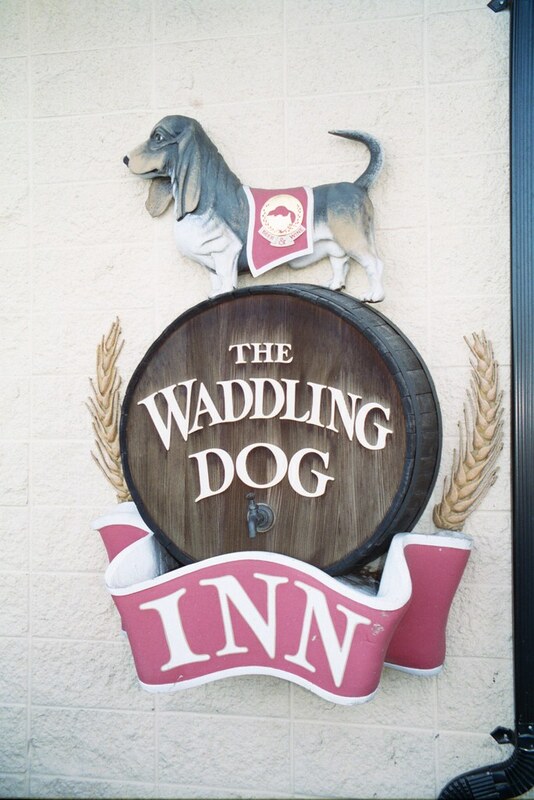 The Waddling Dog Inn only had 30 rooms, and was beautifully decorated…complete with antique desks and chairs in all the rooms. 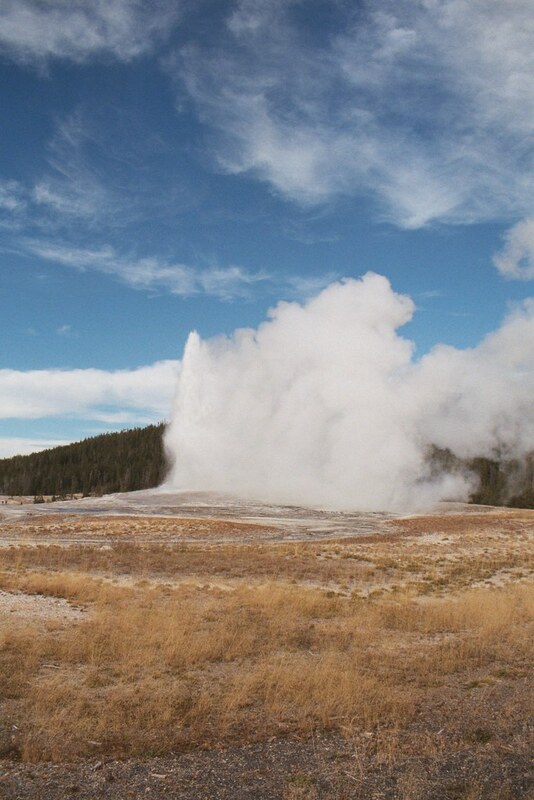 After our weekend in Victoria, my parents and I (Bryan and Heidi had to return to work) took off really early Monday morning so that we'd get to the north entrance to Yellowstone National Park by the end of the day. Didn't quite make it before dark, but it wasn't awfully late by the time we reached the hotel. 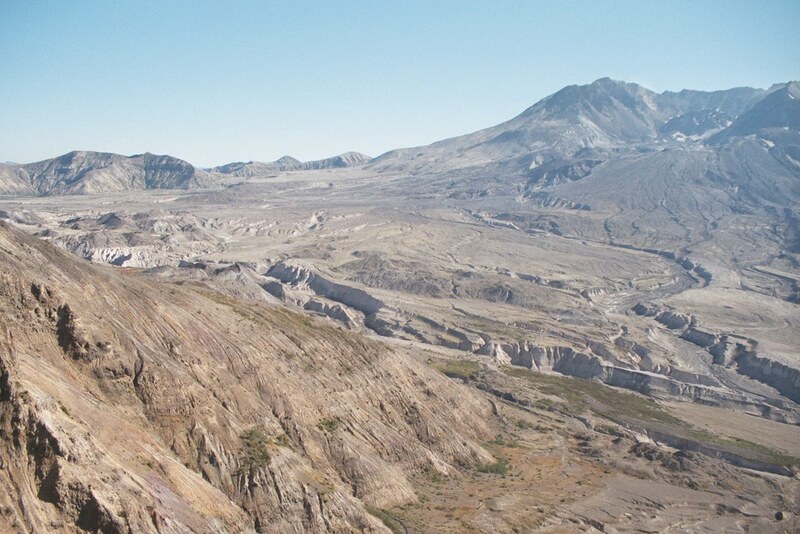 A bit more than halfway through Montana (near the city of Anaconda), this is what the terrain was like. 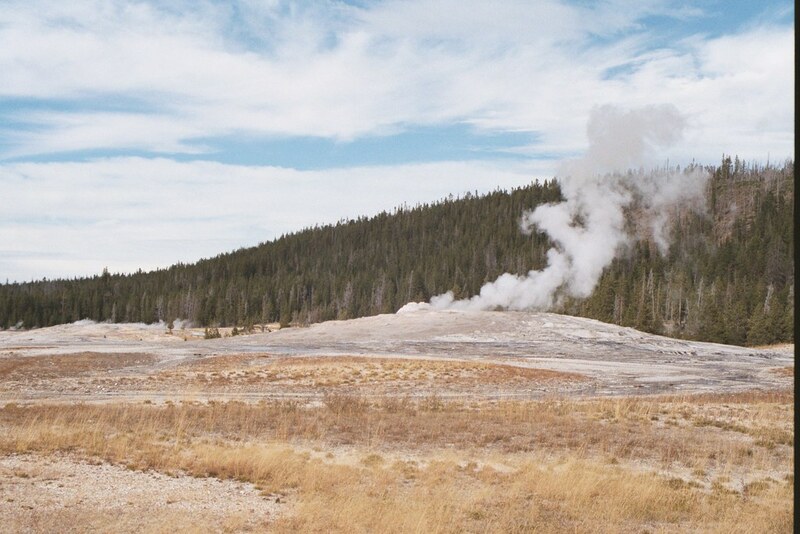 A totally new sight for us. 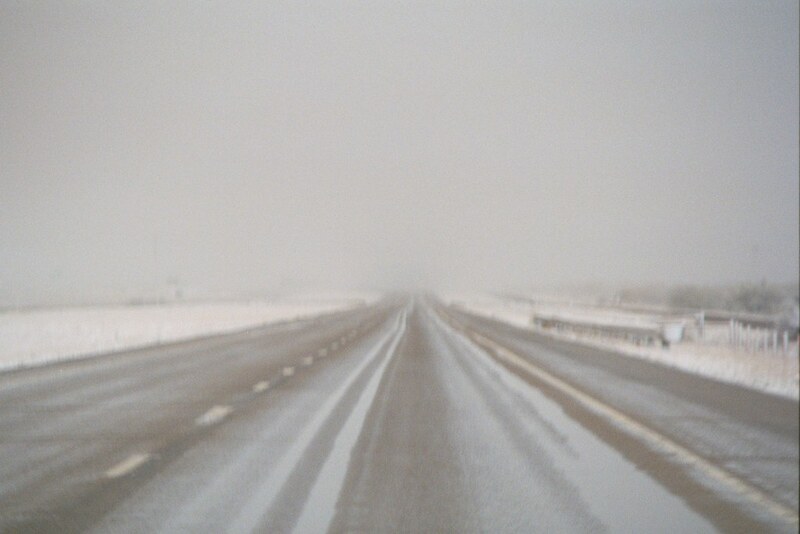 And yes, that is a significant snowstorm up ahead that we were bracing ourselves to have to drive through. 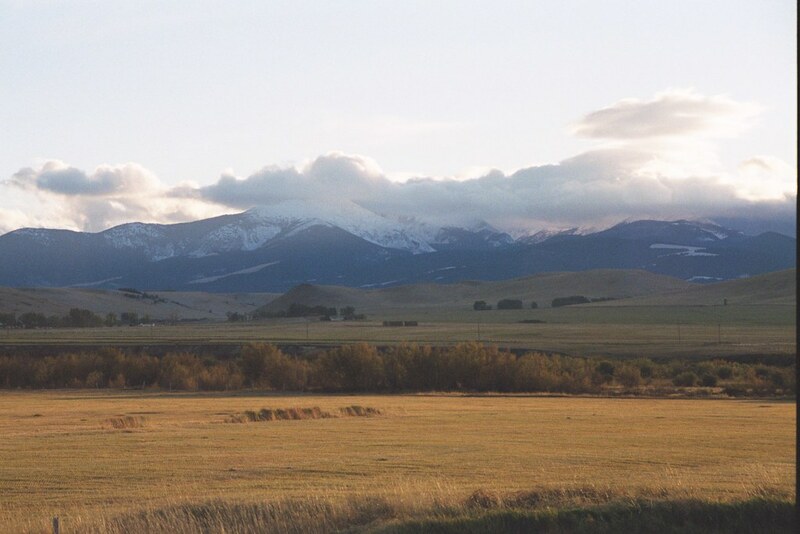 More of this new terrain we've never seen, and more of the snowstorm we were about to drive through. Okay, it wasn't a blizzard or anything, but it was pretty intense for us Florida crackers who hardly ever see snow. 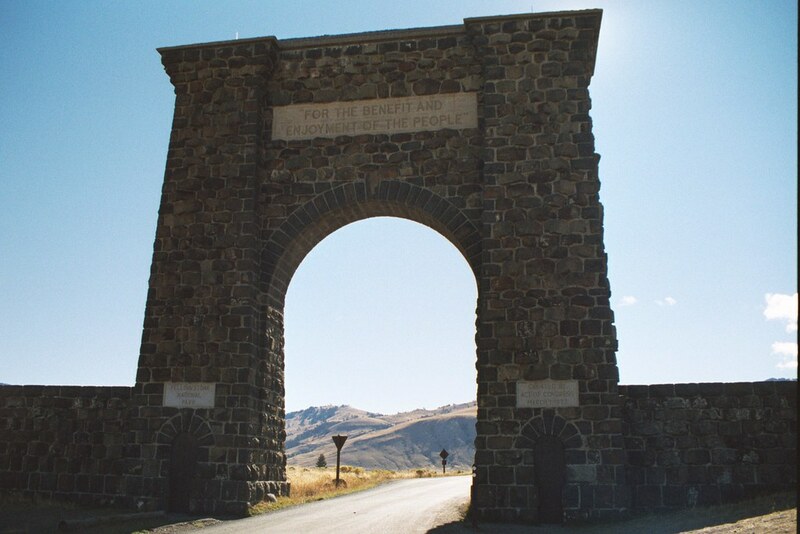 The original, first entrance to Yellowstone National Park on the north side of the park. 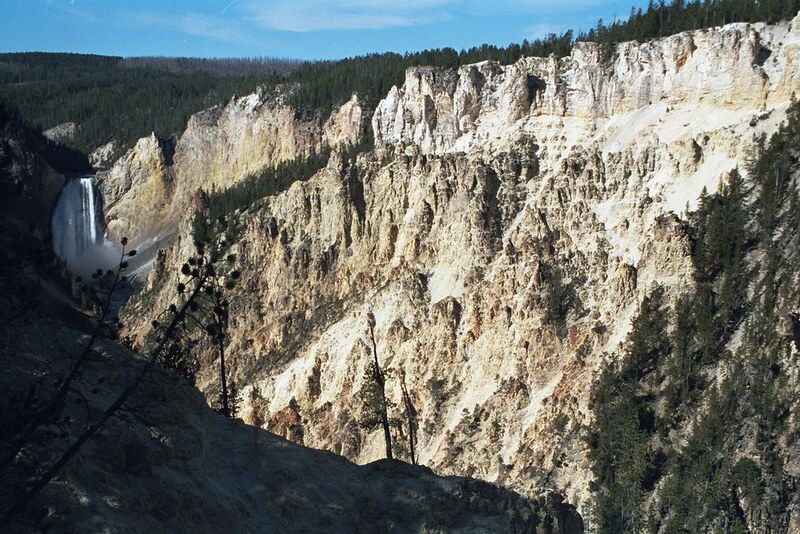 Here are some links to Yellowstone's web sites, www.yellowstone.net/ and the government's National Park Service site for Yellowstone. 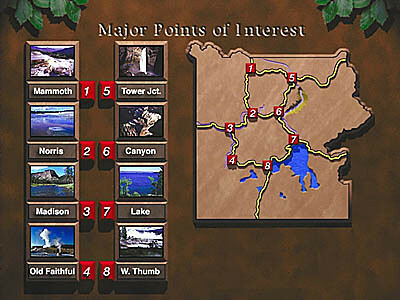 Additionally, I bought a CD-ROM at the park with more than 100 great photos of Yellowstone and the Grand Teton National Forest. Some of them are historical photos. 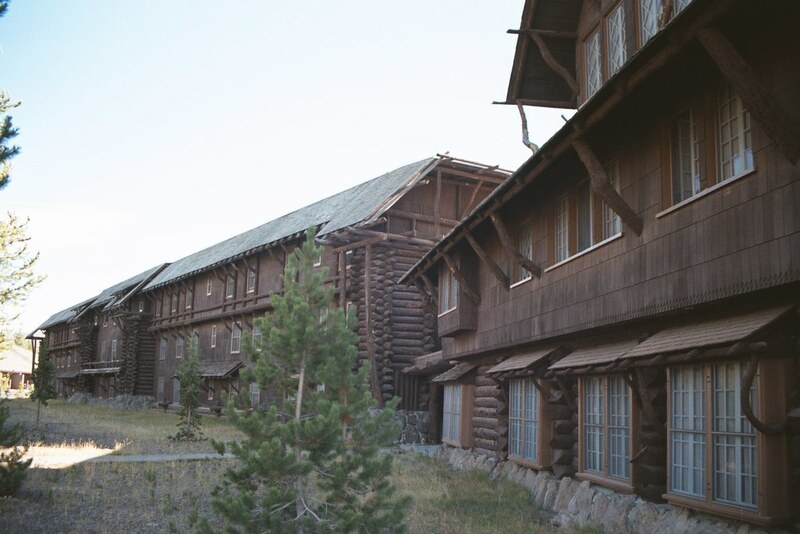 The ones of the Old Faithful Inn and of some of the first visitors to the park through this entrance 100 years ago are really fascinating to look at. 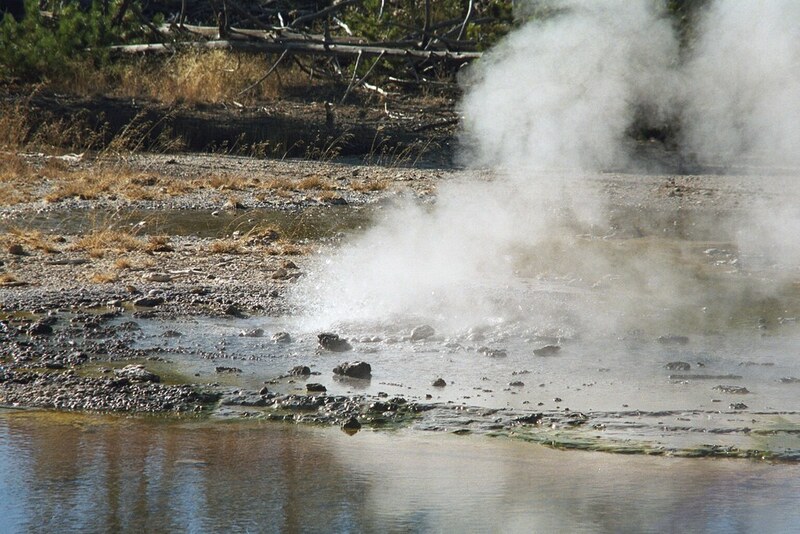 There are also several Quicktime movies about the park. Some of them, plus others that aren't on the CD, are at this web site for your viewing pleasure. 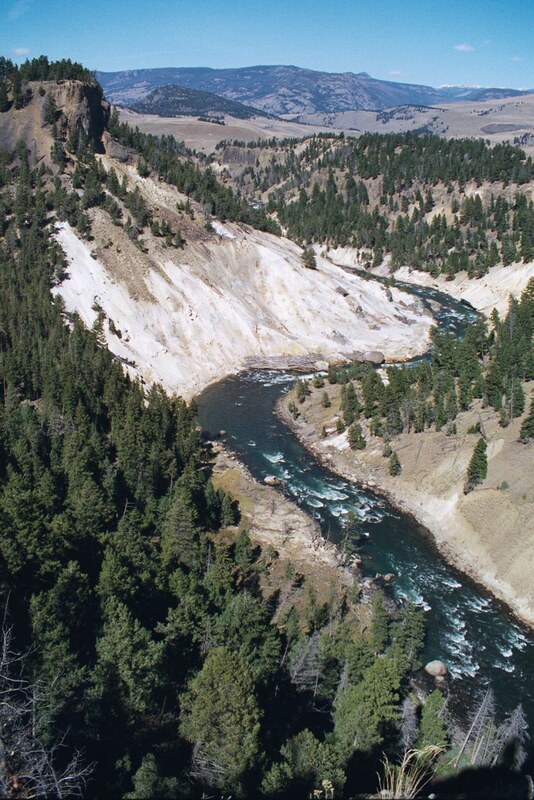 This overview of Yellowstone came from the aforementioned CD. A look backwards after we entered the park. 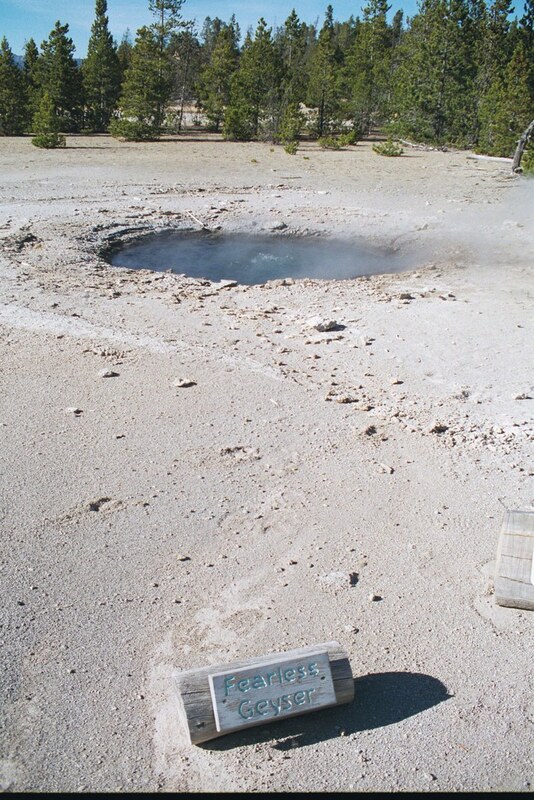 The first hot spring site we saw. 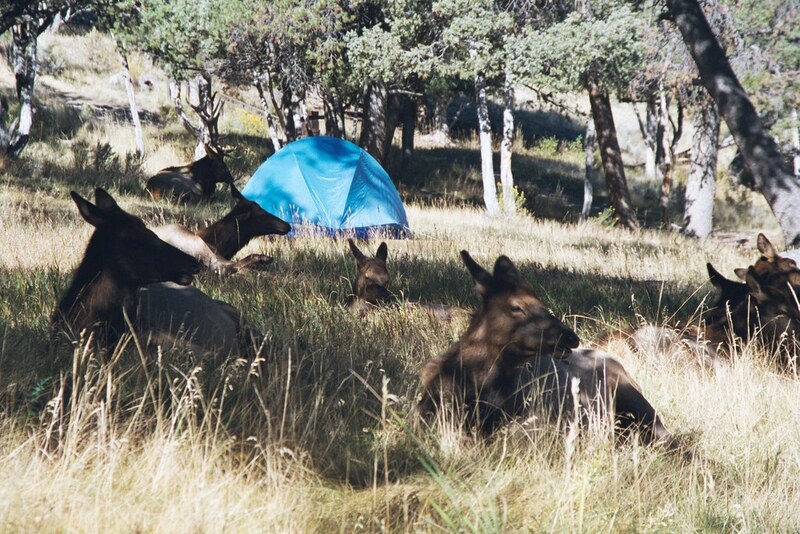 We didn't camp in the park, however not far past the north entrance was this campground we decided to drive through because there were lots of elk laying around. 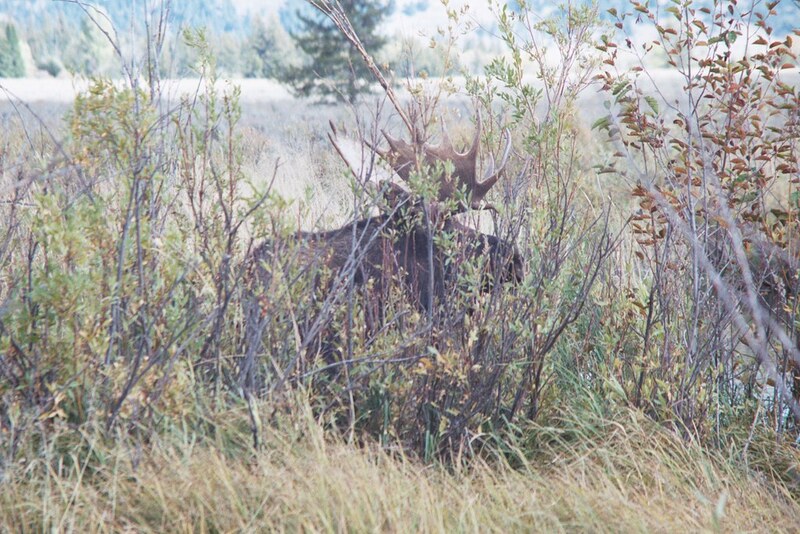 Nice rack of antlers on this fella. 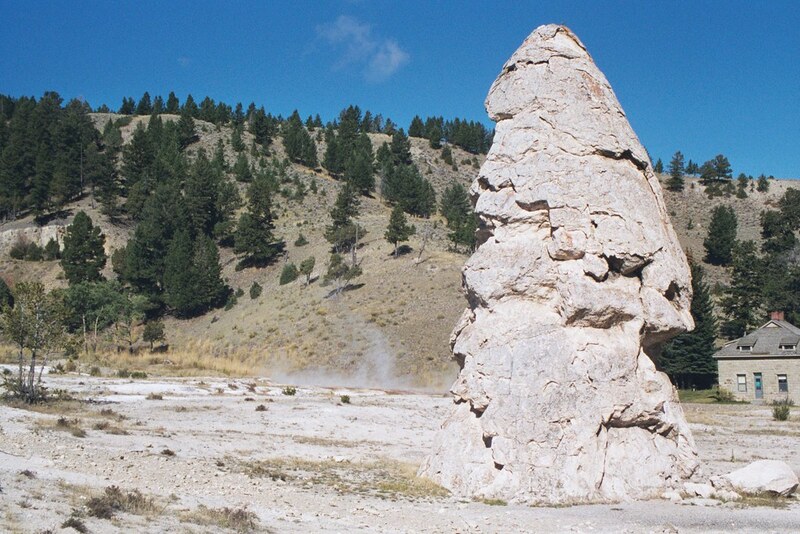 Liberty Cap at Mammoth Hot Springs. 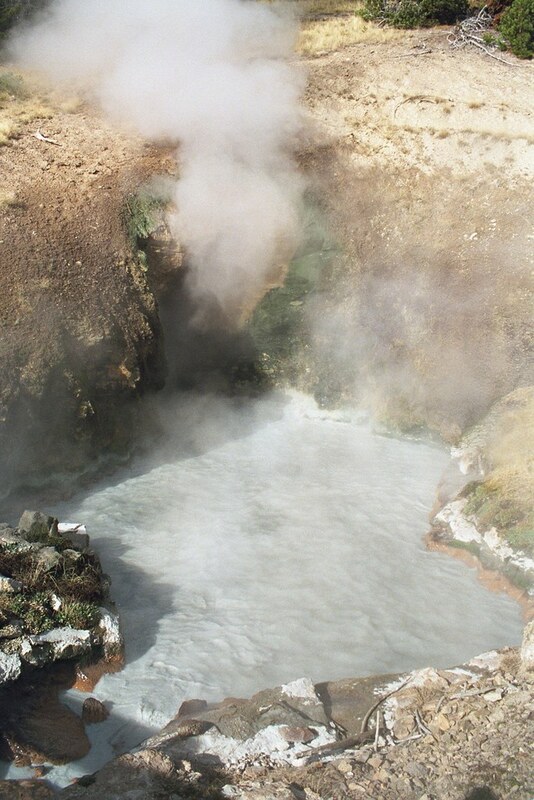 Runoff from one of the hot springs at Mammoth. 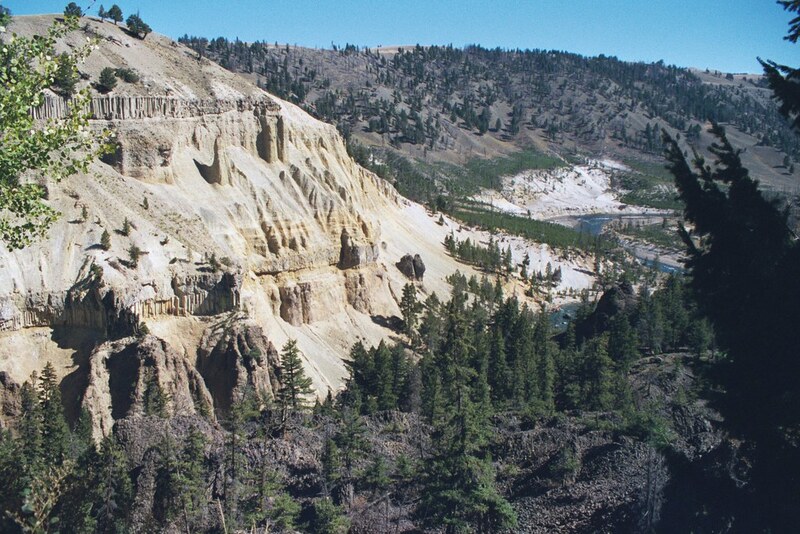 The colored terracing is caused by all variety of deposits carried by the water…stuff like sulfur and calcium as well as all sorts of bacterial and fungal growth. 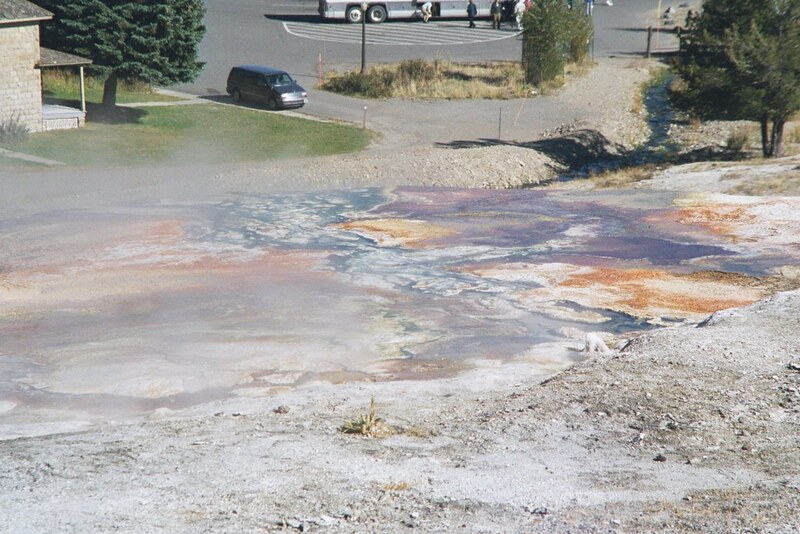 Looking back down to the parking area, a large, multi-colored sulfurous hot spring. 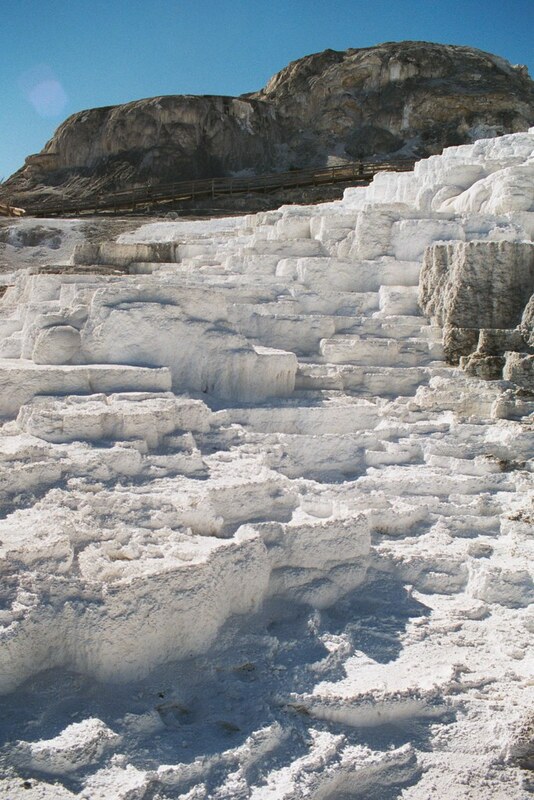 Another runoff location, only this one has dried up, leaving behind calcium deposits that resemble snow if you don't take a closer look. 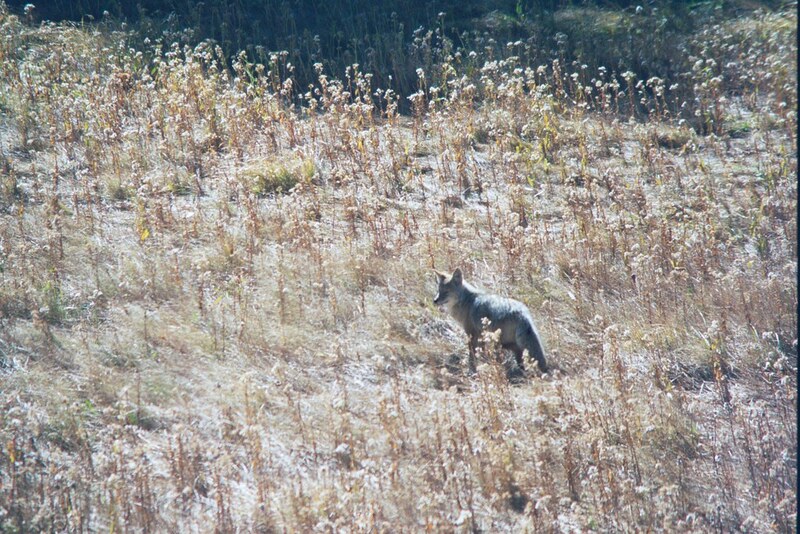 The first coyote we saw. 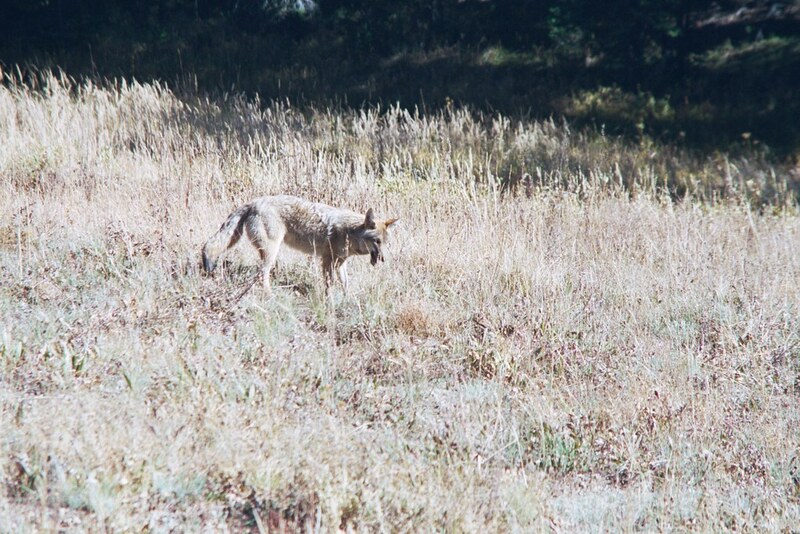 No, we never saw any wolf, but I wasn't concerned. 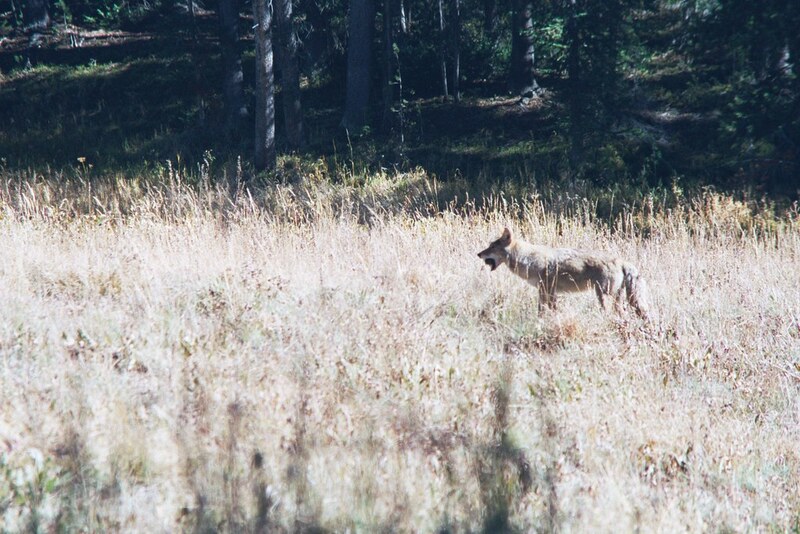 Back during the summer of '91 I snapped a great facial shot of a wolf near the road in Minnesota during my trip around all the great lakes. I just wish I knew where those pictures were. 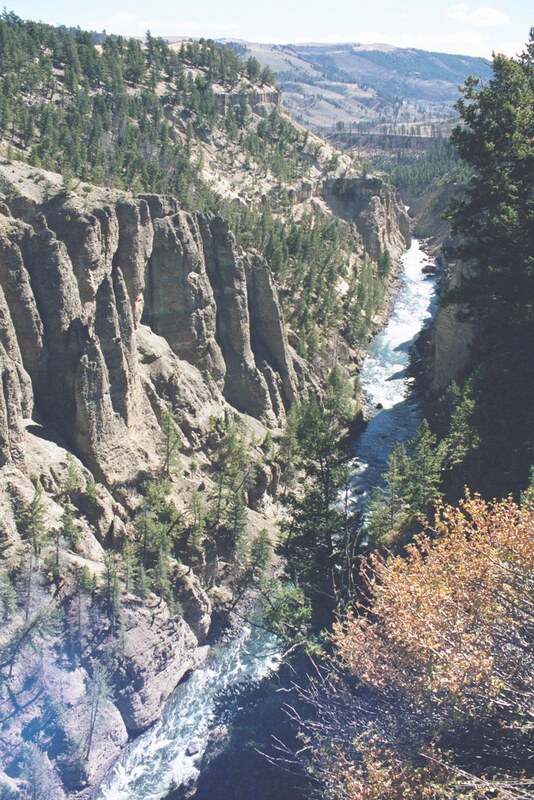 A beautiful view overlooking the Yellowstone River. 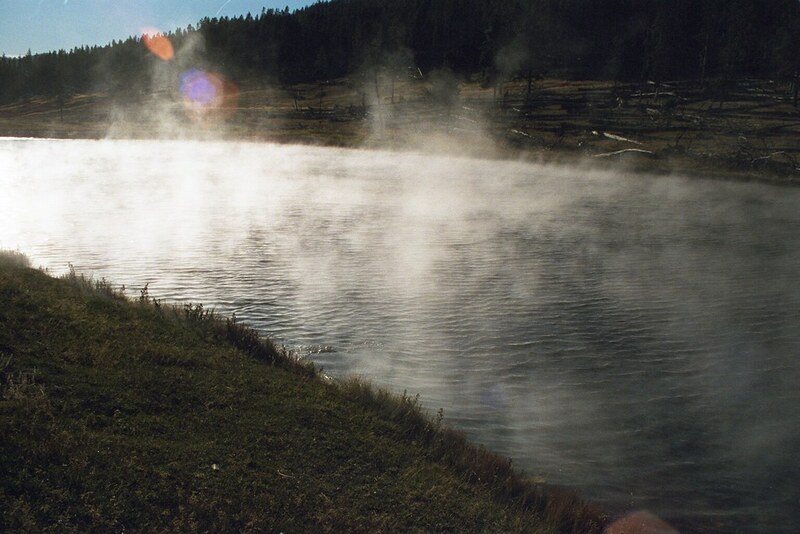 There are hot springs beside the river at the bend near the top of the photo, but one could barely see it without binoculars. 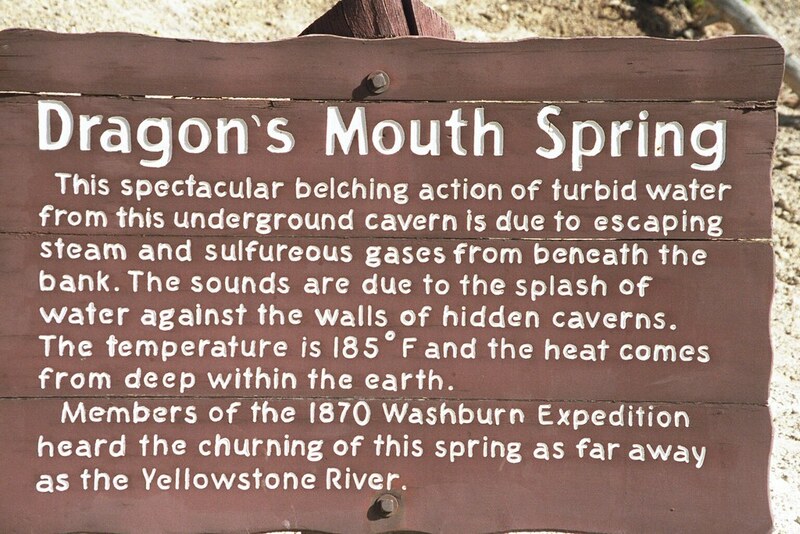 Plenty of information about this phenomenon on the sign in this picture. 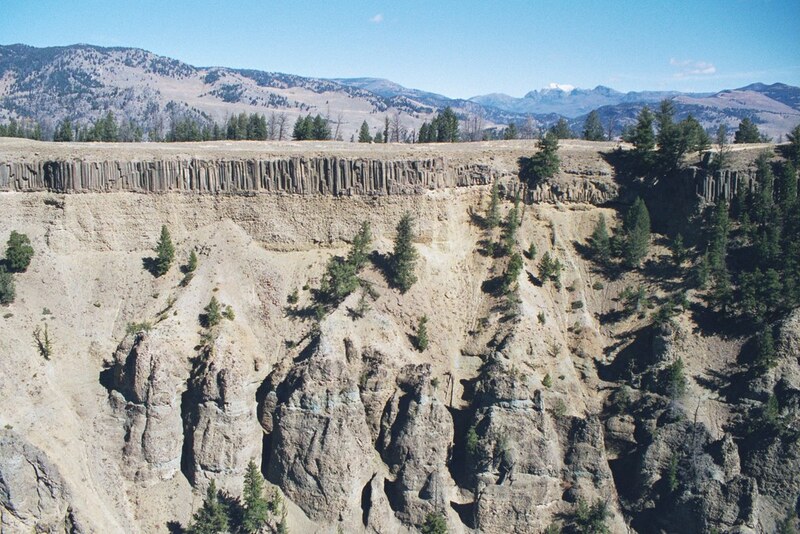 The pattern in the rock stretched for hundreds of yards in both directions. 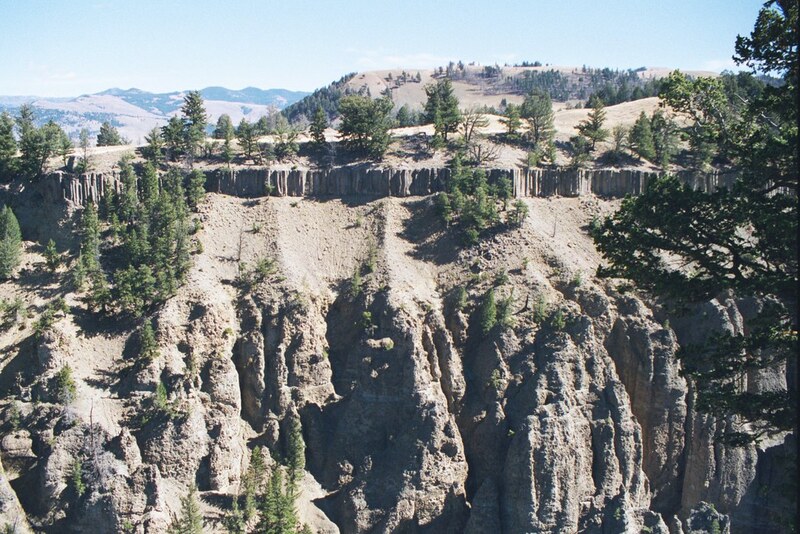 More great scenery overlooking the Yellowstone River. 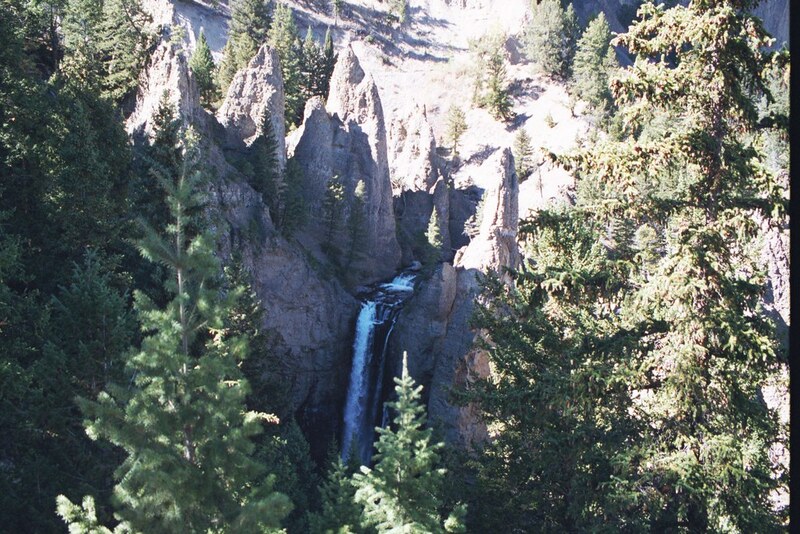 Tower Falls, so-named because of the tower-like rock formations above the falls. 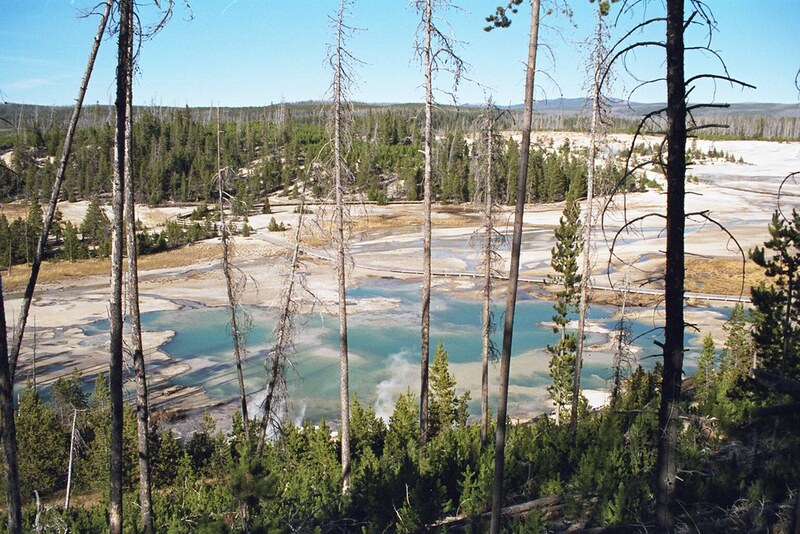 One of the areas of Yellowstone with thick trees not affected by the fire some years back. 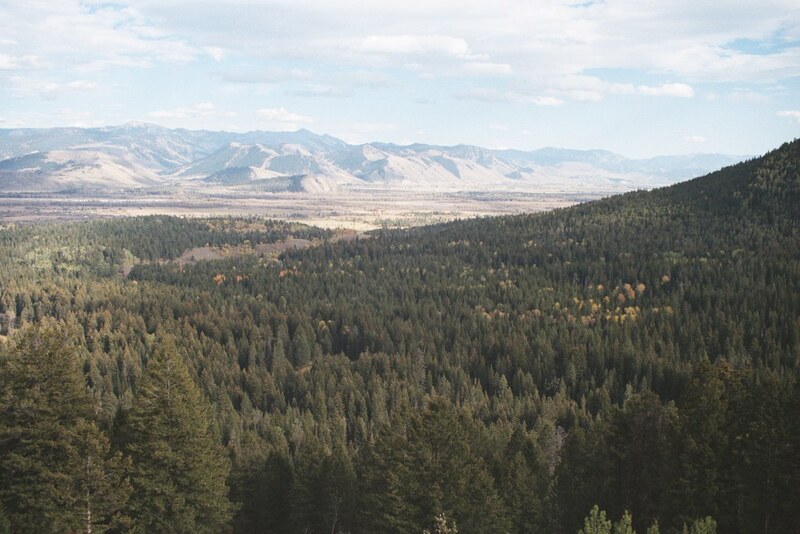 The Grand Teton National Forest is way off in the background. 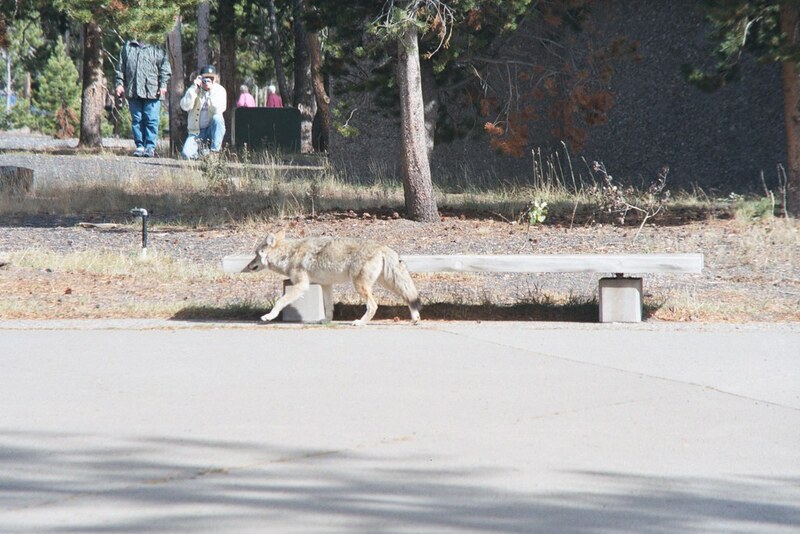 The second of three coyotes we found in Yellowstone. 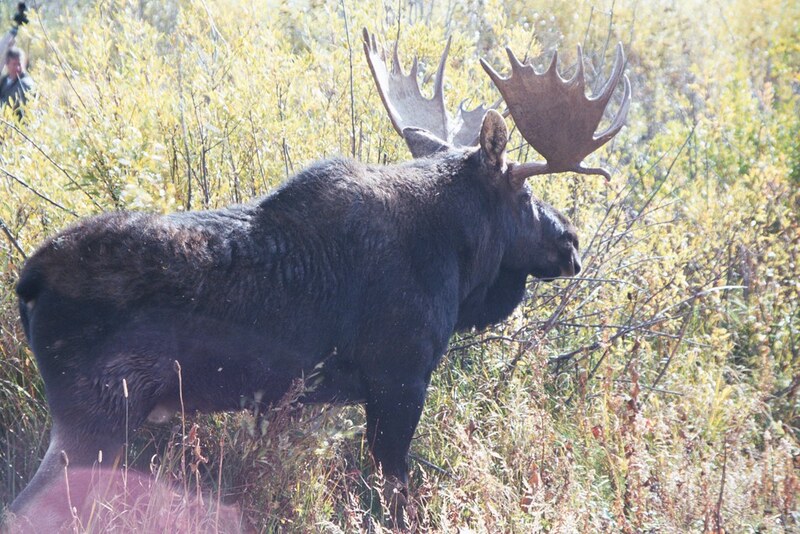 This guy was about to score some breakfast. 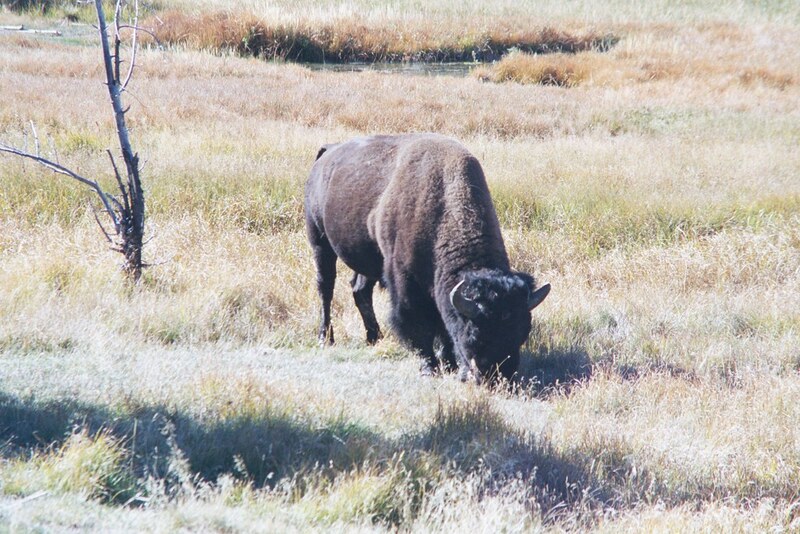 Bison were the most common animal we saw throughout Yellowstone. 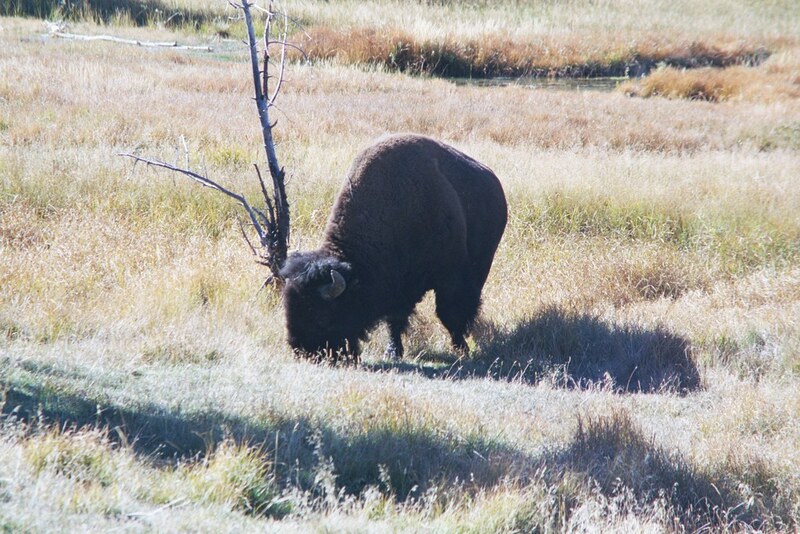 Did I mention that bison were the most common animal we saw throughout Yellowstone? 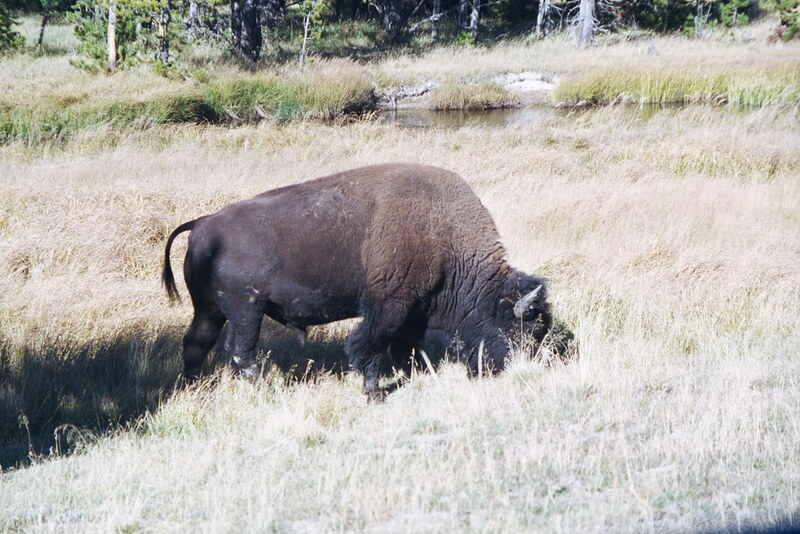 Are you sure I mentioned that bison were the most common animal we saw throughout Yellowstone? 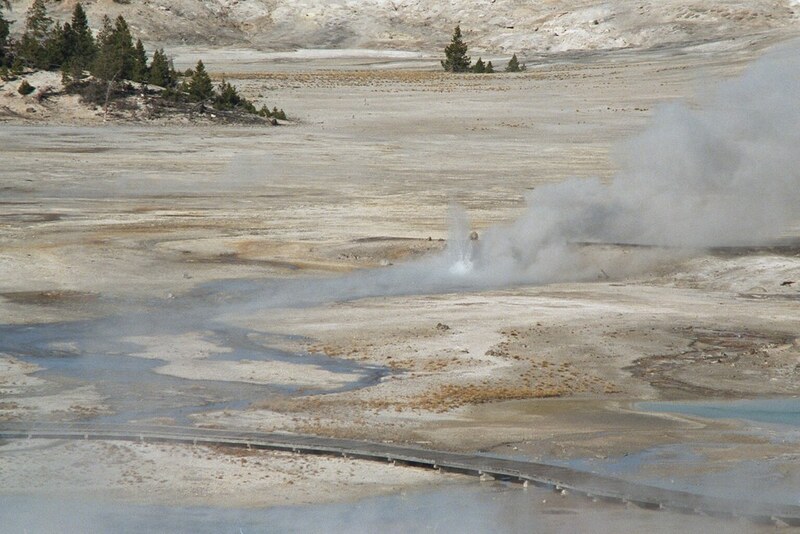 The first geyser we stopped at during our hike through the Norris Geyser Basin. 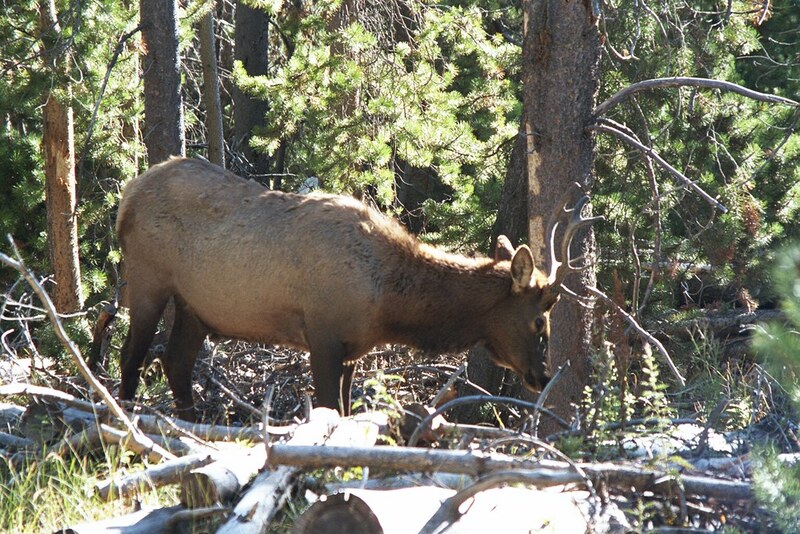 We had to pause for a few minutes while this elk casually made his way across the path. Just off the opposite side of the path after he'd crossed, he decided it was time for lunch. 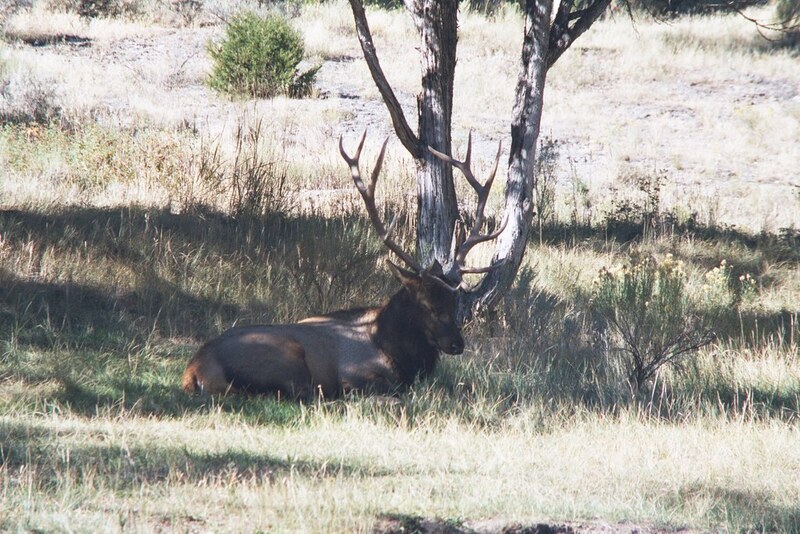 Park visitors, including us, made our way past him very carefully and quietly so as not to startle him—or get him ticked off at us! 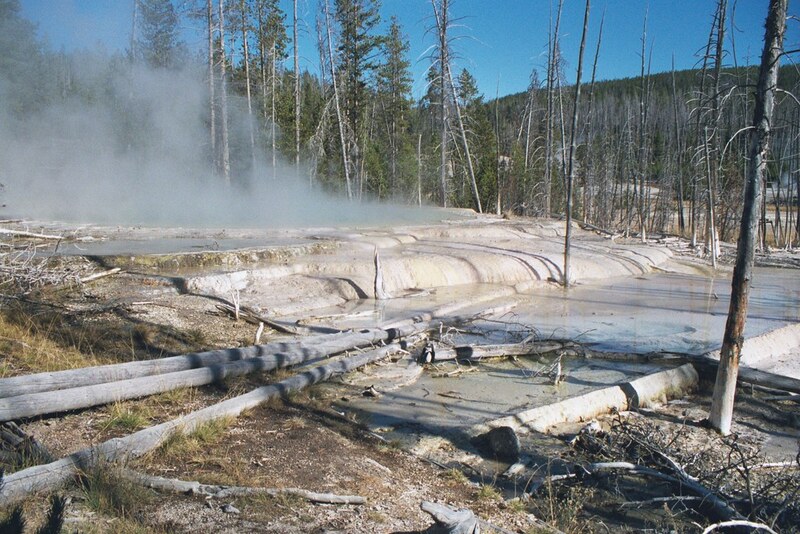 A shot of the beautiful, main region of the Norris Geyser Basin. 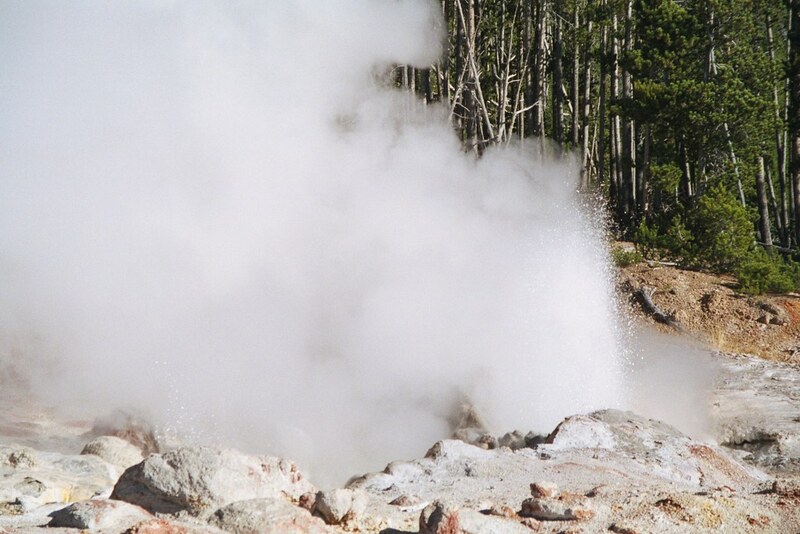 A telephoto shot of a geyser in the Norris Basin which was erupting quite intensely. As you can see, the boardwalk comes rather close to it, so I quickly attempted to make my way down there for a closer photo. 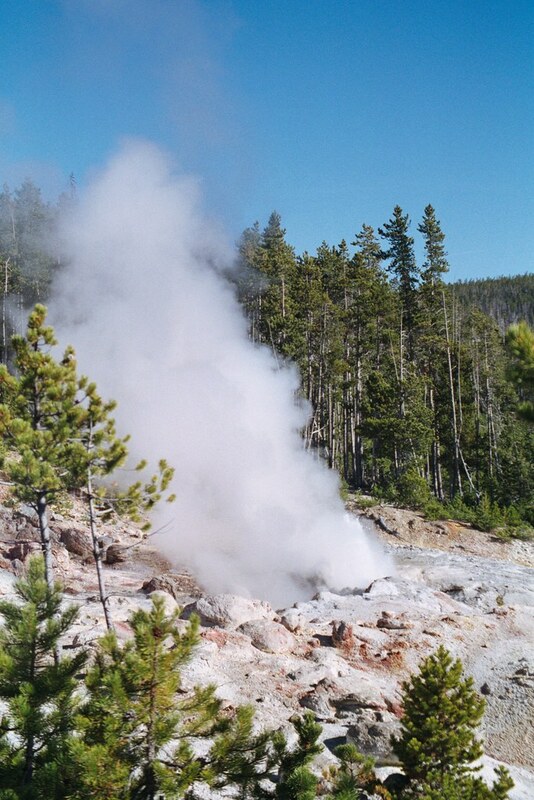 Unfortunately, by the time I got down there, the eruption was over. 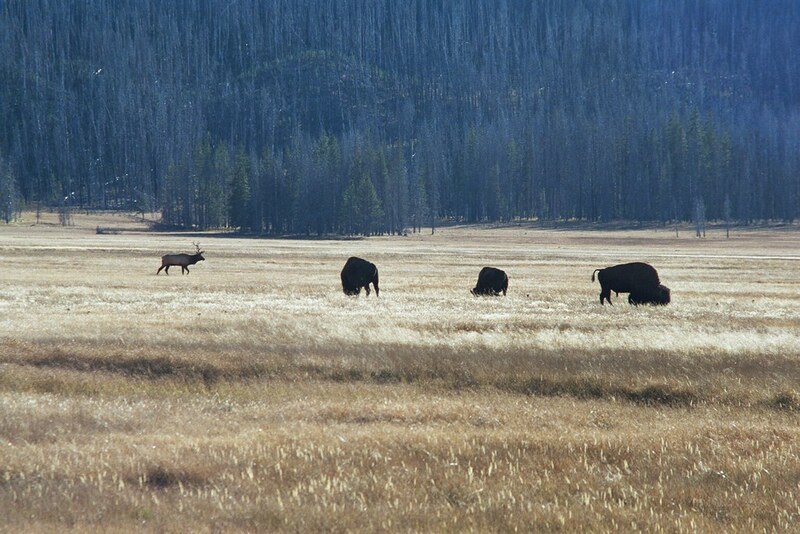 …where the deer and the antelope…er, uh…where the elk and the buffalo play! 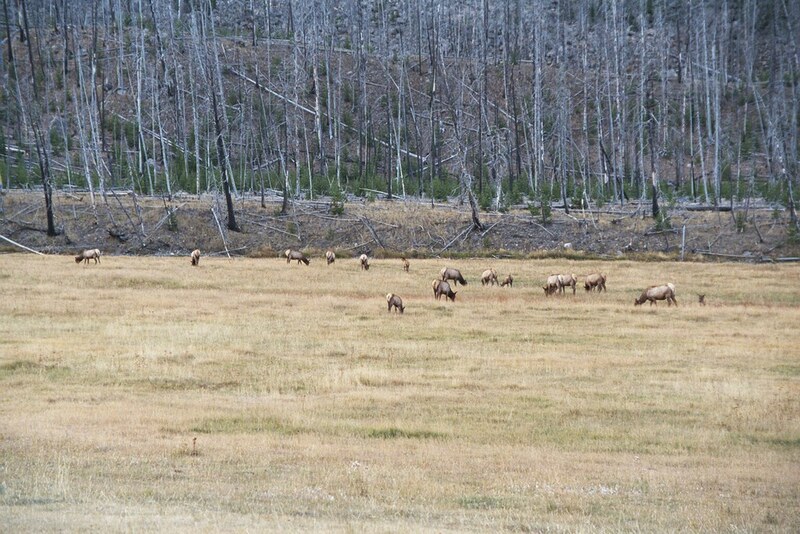 A shot of the largest herd of elk we found. 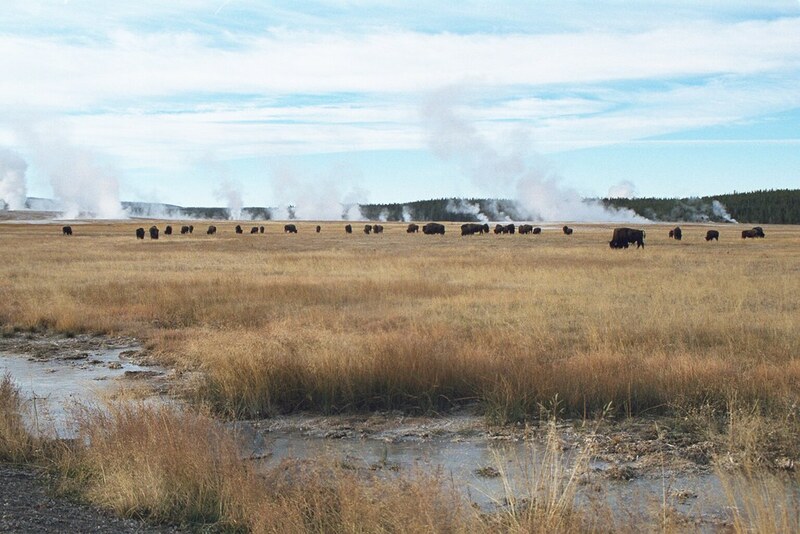 One of my favorite shots of the trip, a large herd of bison with geyser steam in the background. 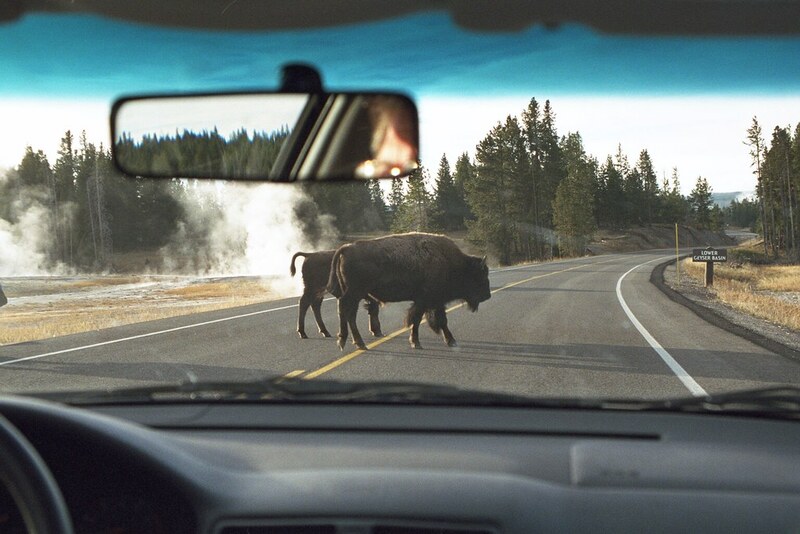 When you visit Yellowstone, never forget that animals always have the right-of-way. 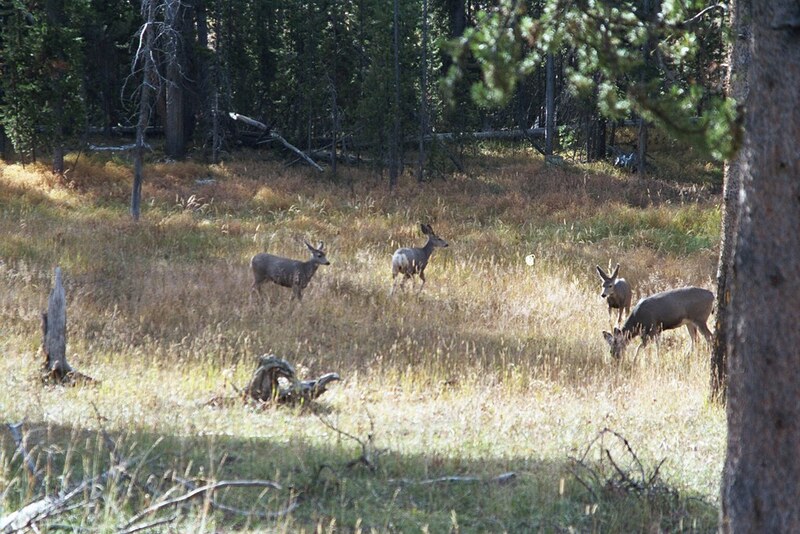 A shot of the only deer we found during our trip. 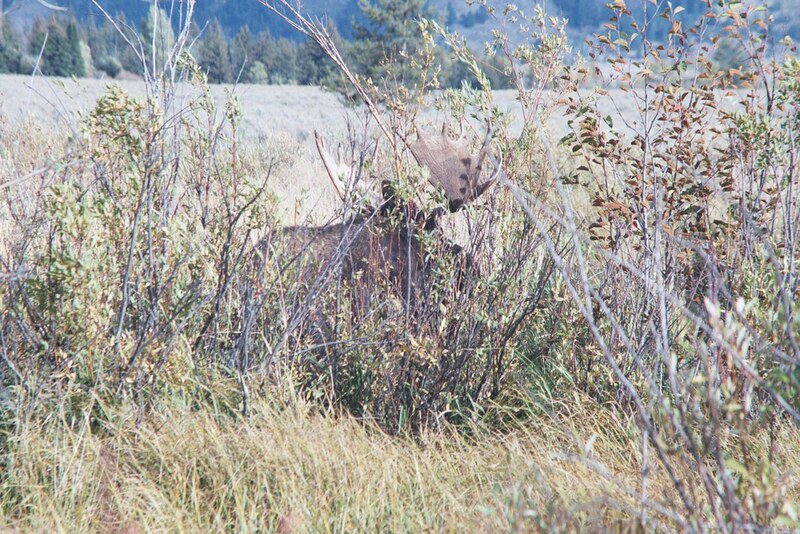 Another shot of the only deer we found during our trip. 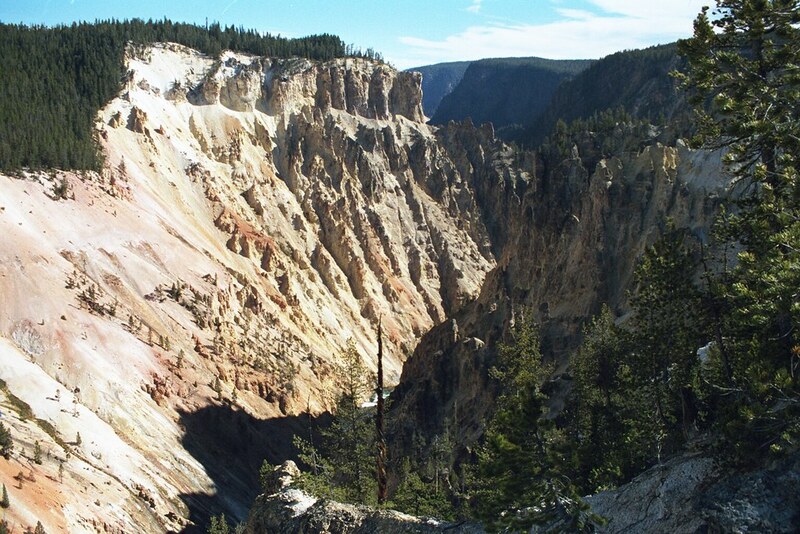 I never really took the time to consider where Yellowstone got its name until we reached this area of the park. No further explanation is necessary! 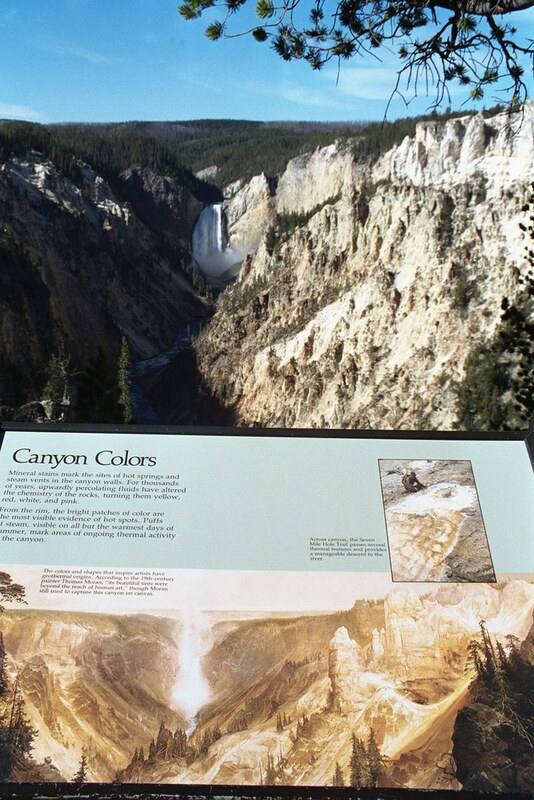 The prior shots of the canyon were all looking upriver towards the lower falls. 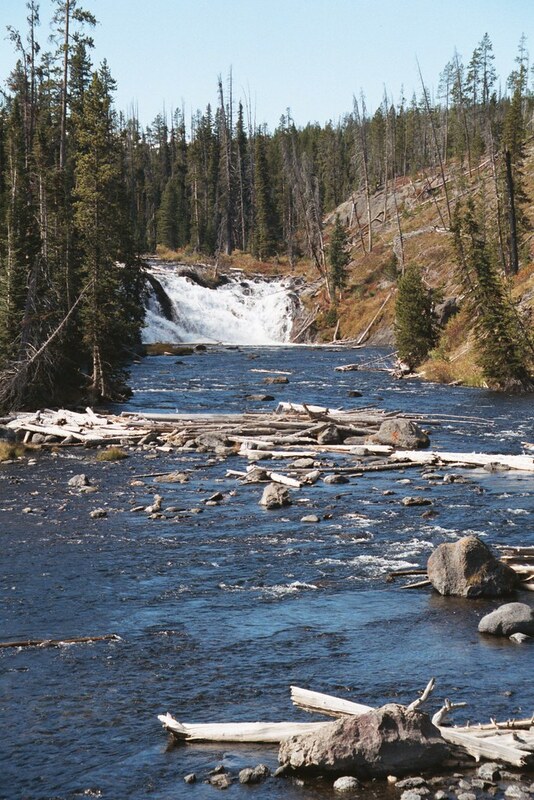 This shot looks downriver. 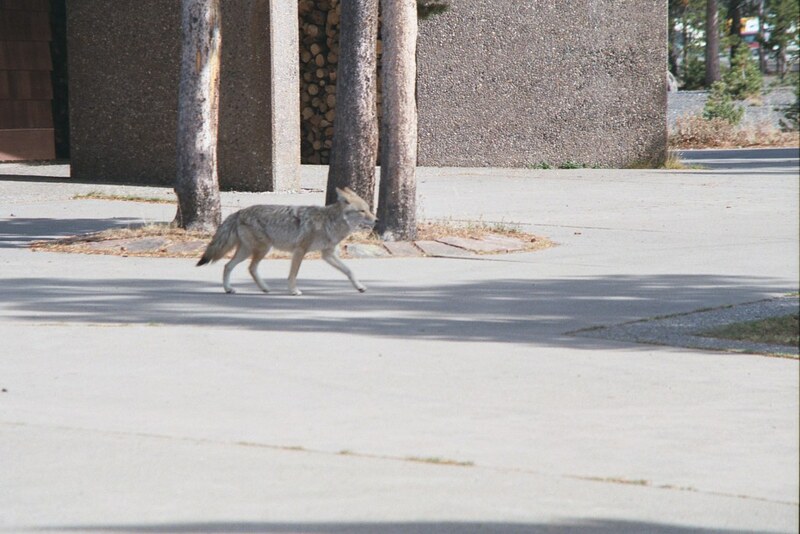 The third coyote we found…this one was running through the Old Faithful visitor's center. 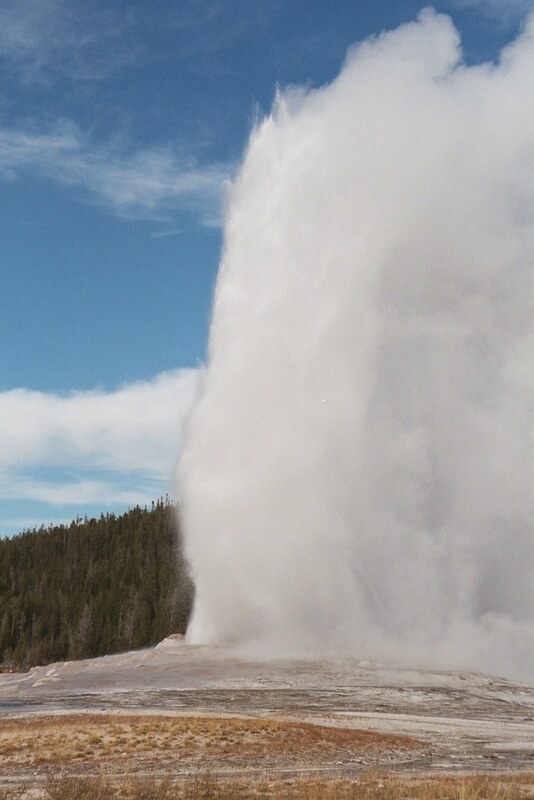 We finally made it to Old Faithful Geyser. 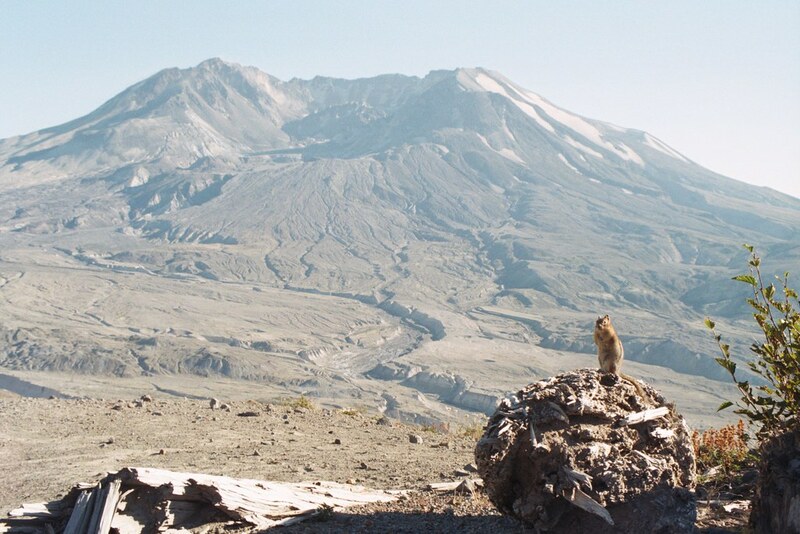 There was obvious anticipation as we waited for the next eruption. 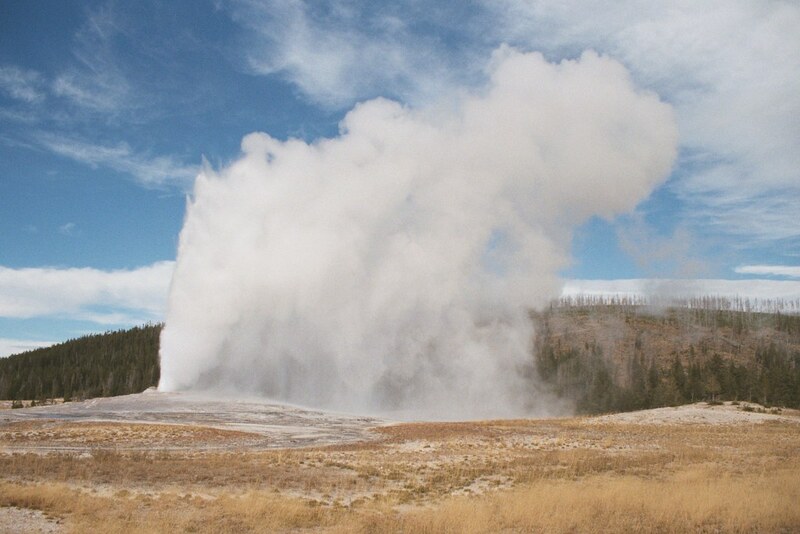 Whenever the wind blew the steam sideways, and caused re-condensed water to rain back down to the ground, is when Old Faithful looked so massive. 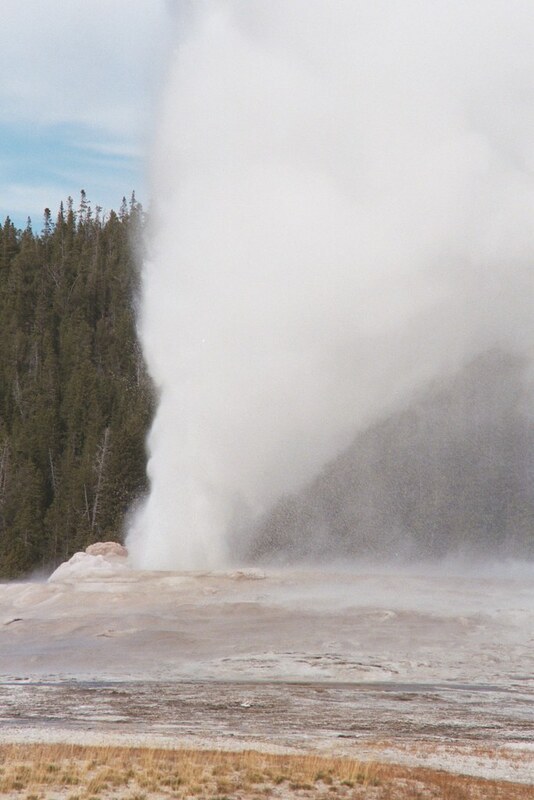 A closeup of the geyser mouth where the water gushed out with tremendous force. 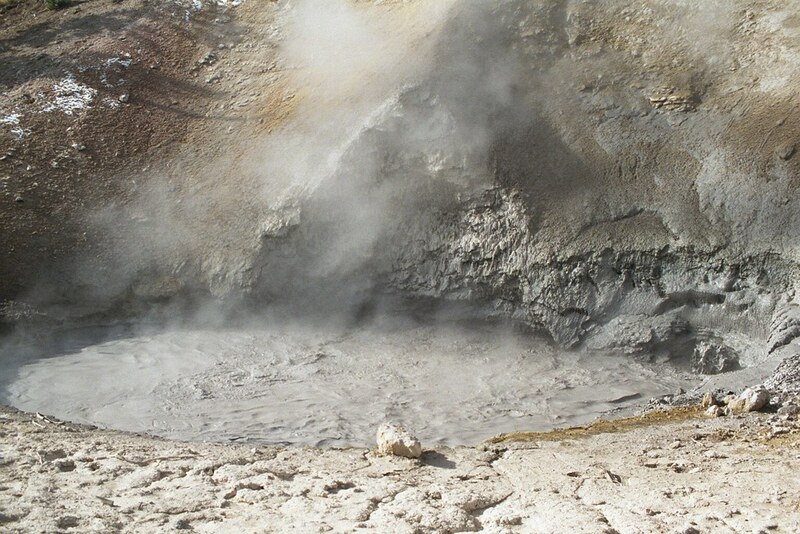 Another closeup of the mouth as the eruption winds down. 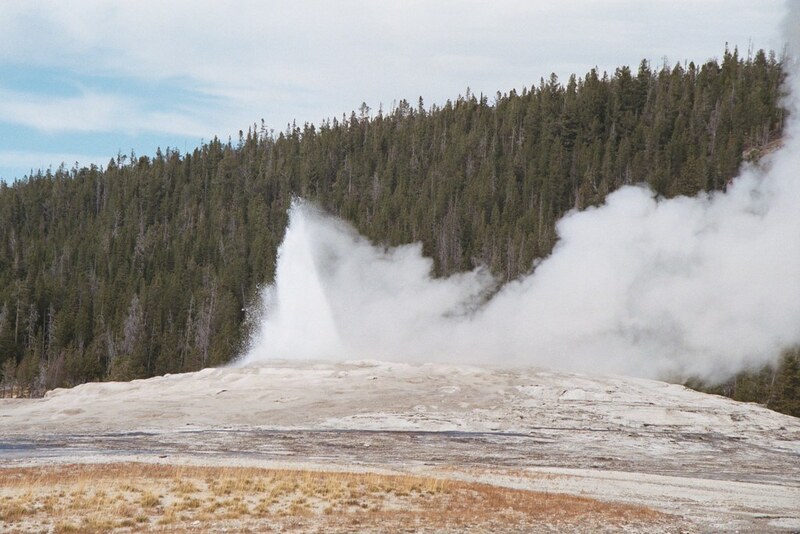 One last shot of the final stage of an Old Faithful eruption. 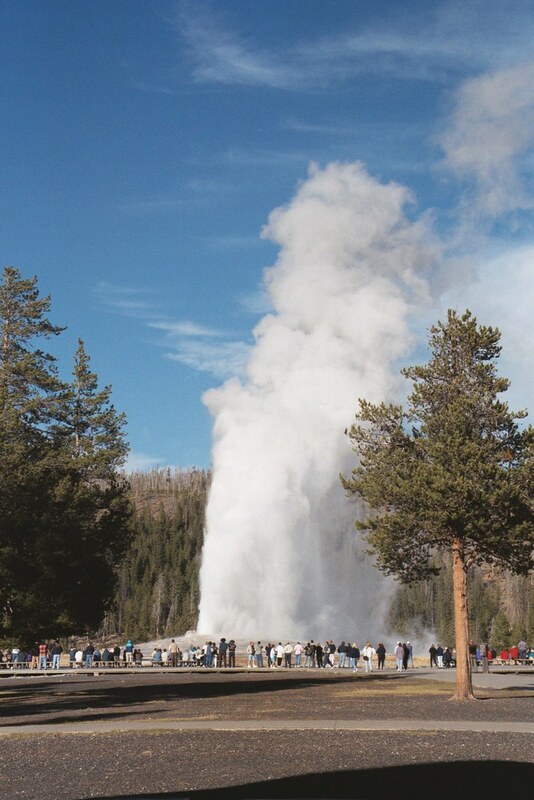 You can watch for eruptions right now, using the Old Faithful webcam. 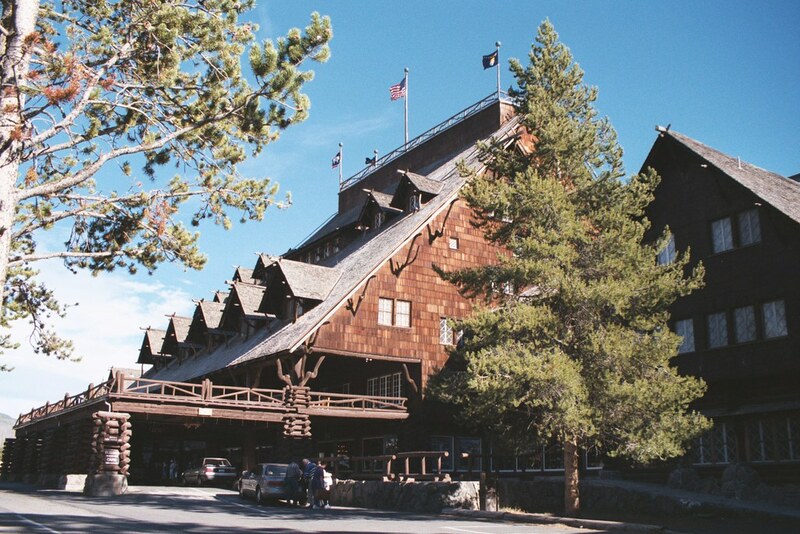 A few steps from the geyser is Old Faithful Inn. Amazing architecture in true, rustic style. 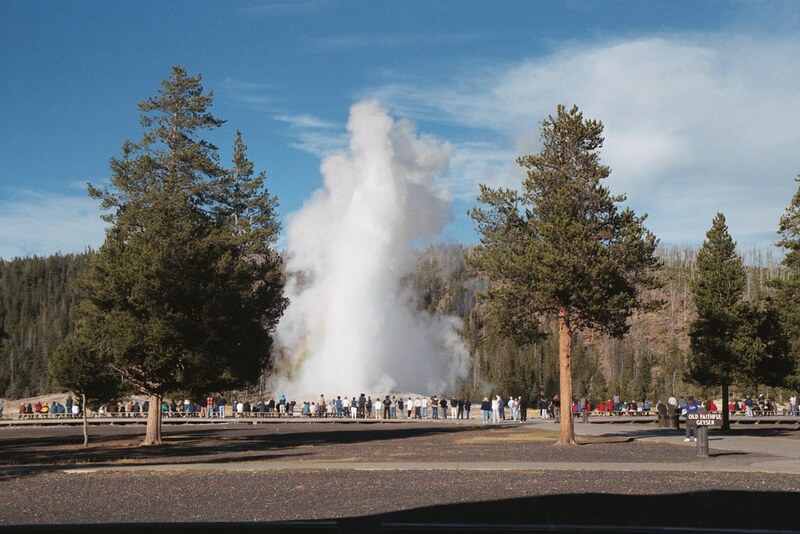 The Yellowstone CD-ROM I bought also has some great photos of this hotel taken at the turn of the century. 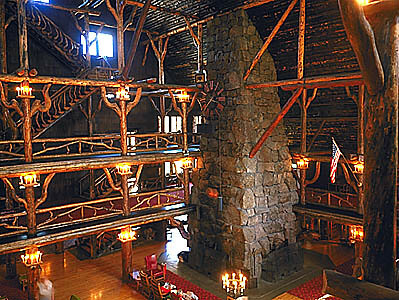 This is the view from inside the Old Faithful Inn foyer, looking up at the Crow's Nest. 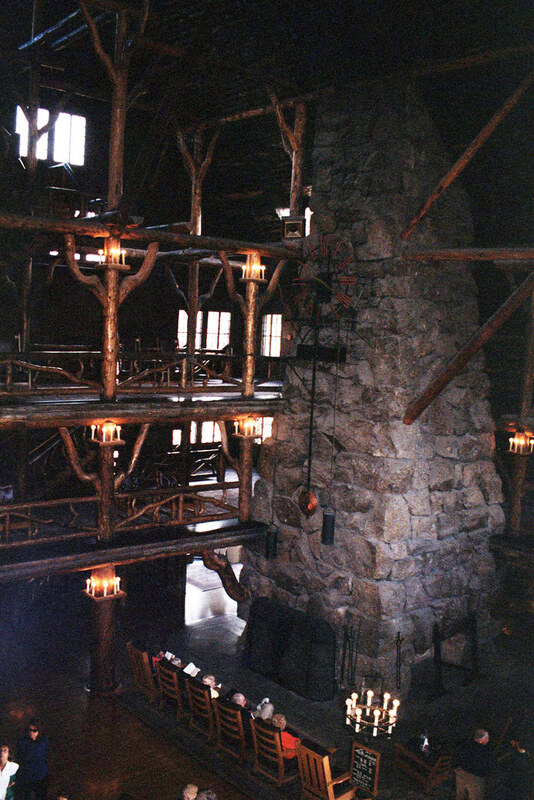 Looking down to the the Old Faithful Inn foyer, with its huge stone fireplace. 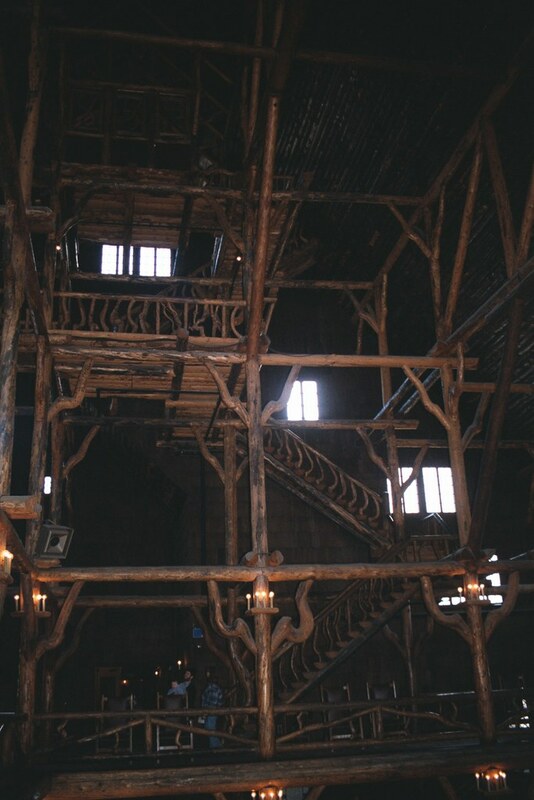 The inside of the Old Faithful Inn is pretty dark and my pictures only turned out so-so. Consequently, I'm borrowing this shot off the CD-ROM so you can see the interior better. 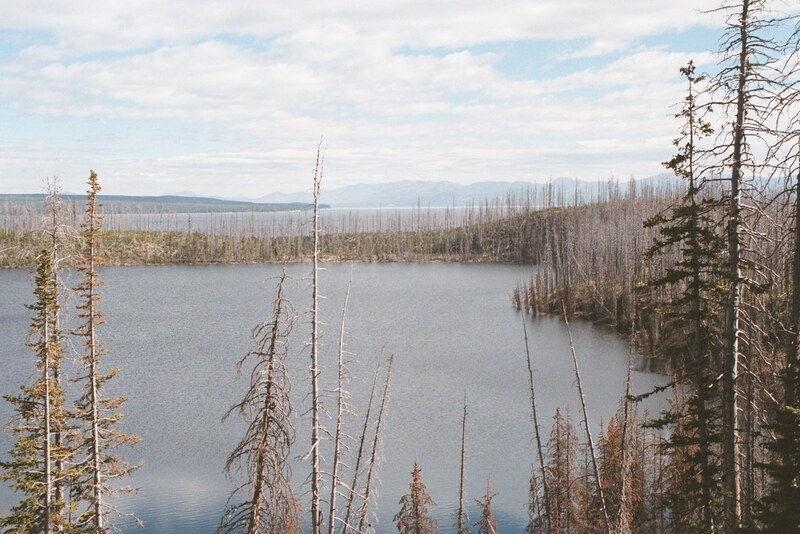 Yellowstone Lake. 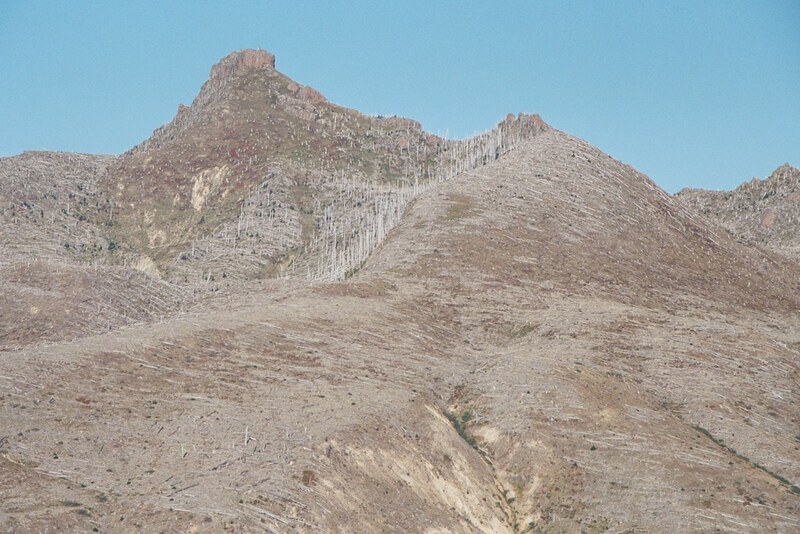 The fires some years back certainly affected the beauty of the region, however the burnt areas are making a comeback. 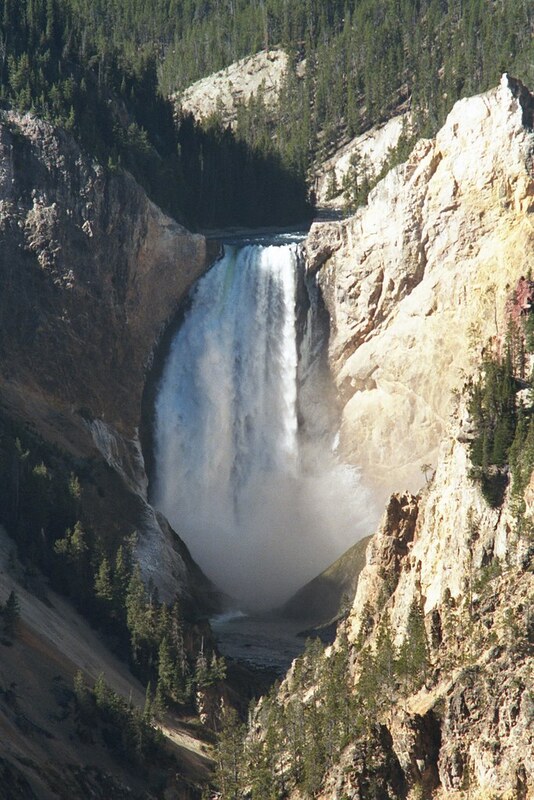 A postcard-esque shot of Lewis Falls in south Yellowstone. Indeed, I've seen a postcard sporting just about this same shot. 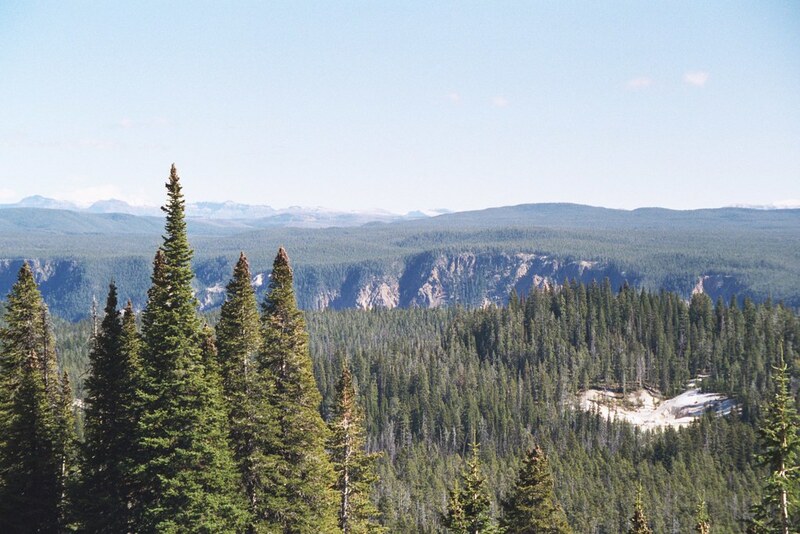 This type of scenery dominated most of the trip south as we made our way out of Yellowstone and into the Grand Teton National Forest. 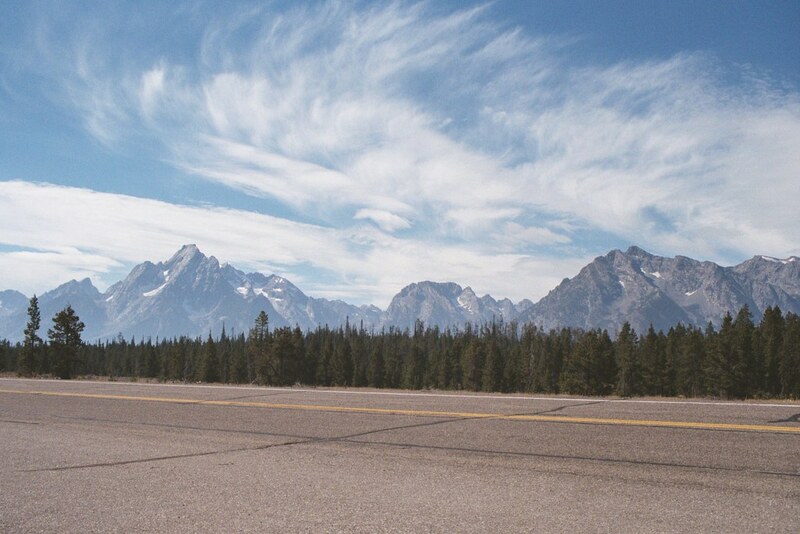 Of the several shots I took of the Grand Teton mountain range, this one is my favorite. 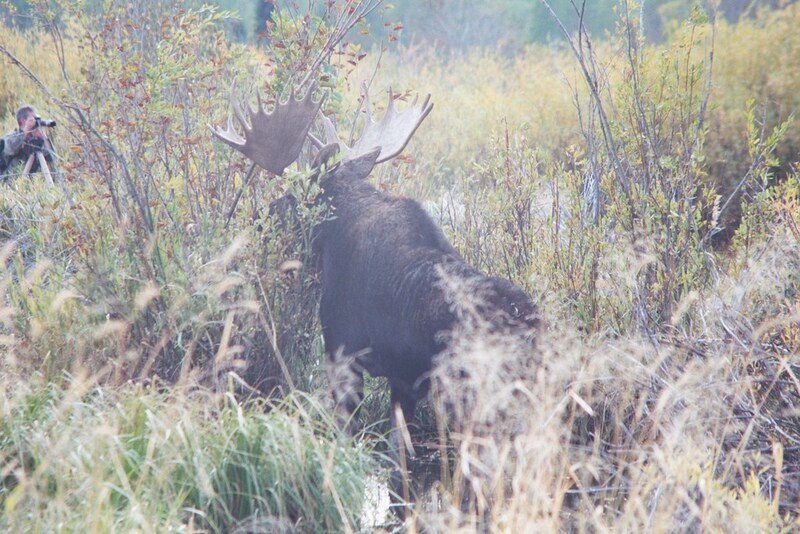 Visit the Grand Teton National Forest's web site some time. 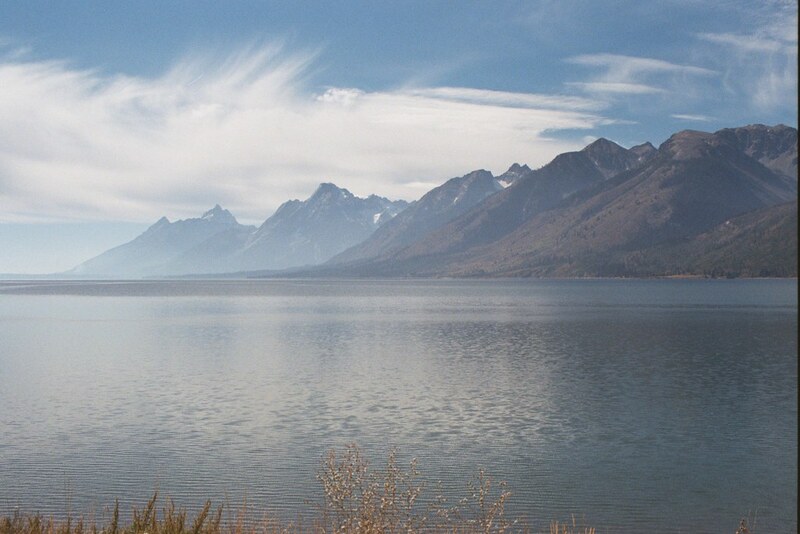 Jenny Lake, at the foot of the 13,770-foot Grand Teton Mountain. 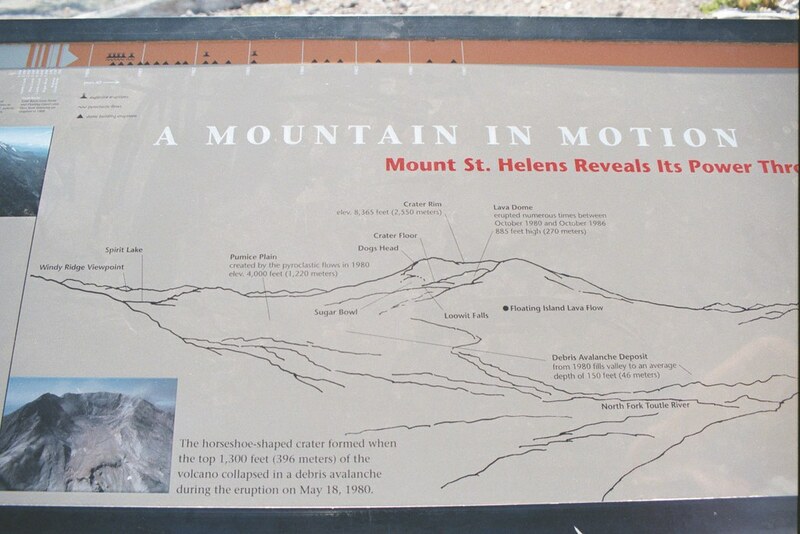 I'll admit I might be a little mistaken about the particular mountain. 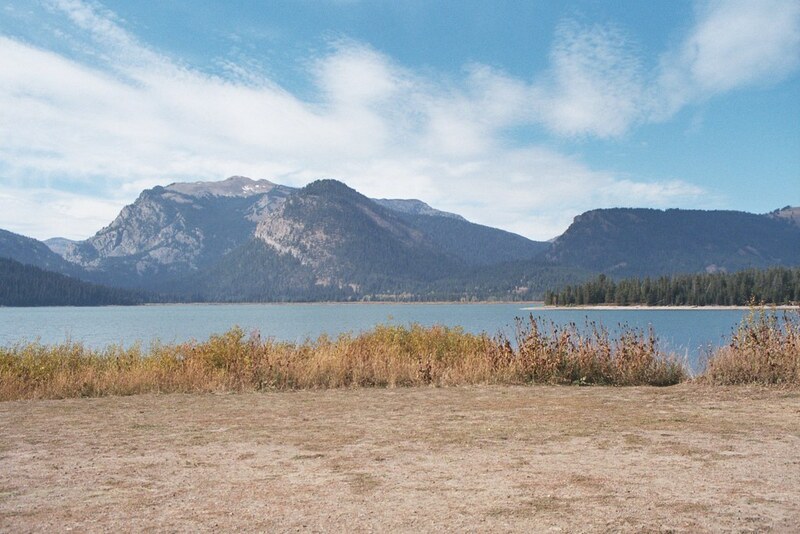 Grand Teton is sort of on the southwest side of the lake, and I think this picture was taken looking a little more due west or a tad bit northwest. 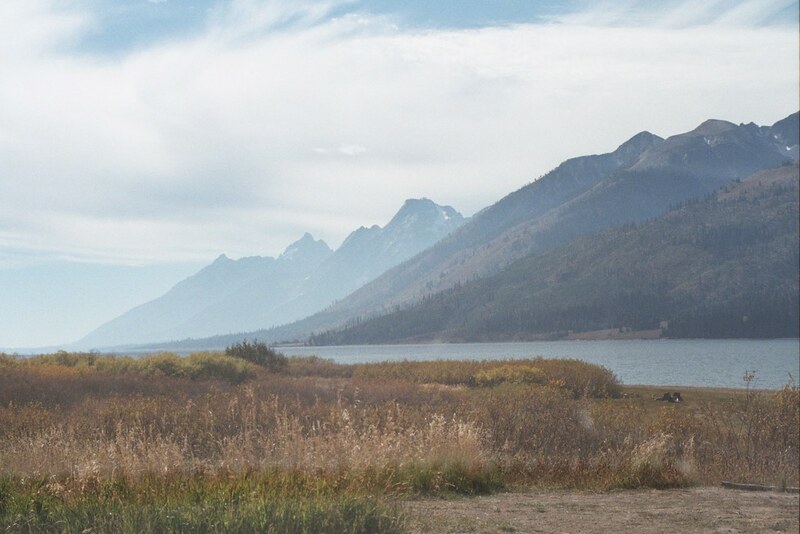 It's possible Grand Teton is just off the left side of the frame. 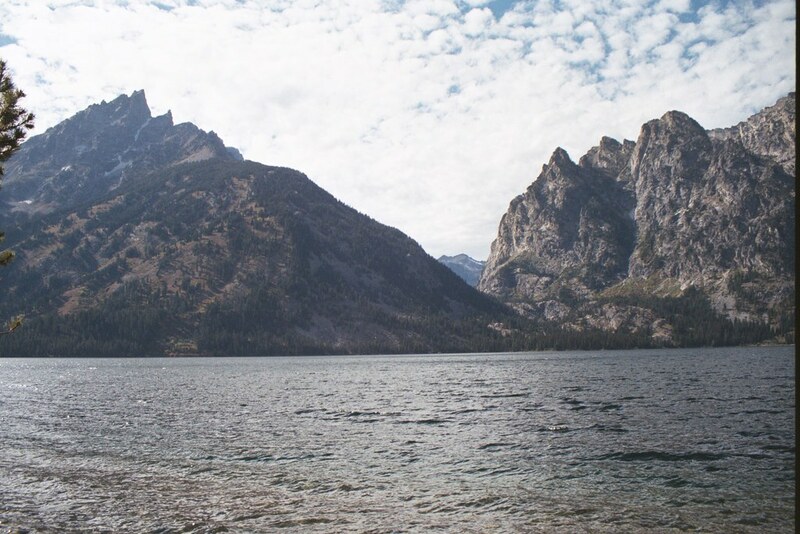 Close enough, though, it is Jenny Lake. FINALLY!!! 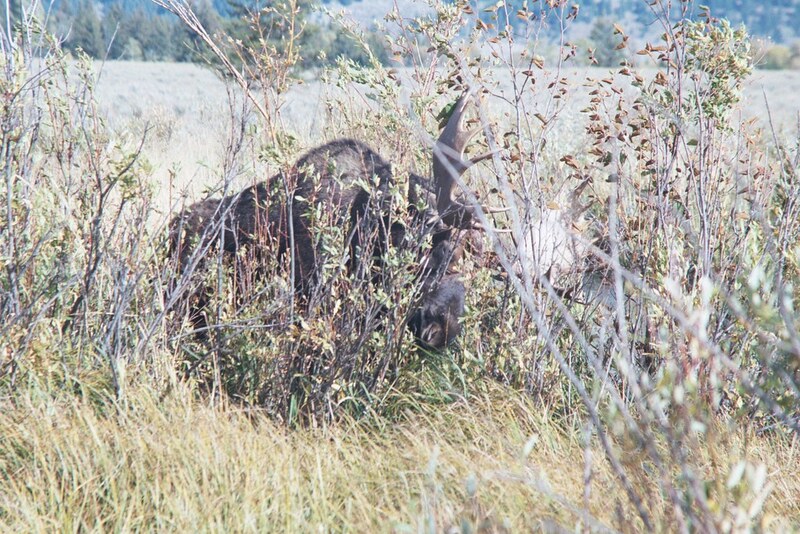 We'd wanted to see a moose for years…especially during this trip through Yellowstone. 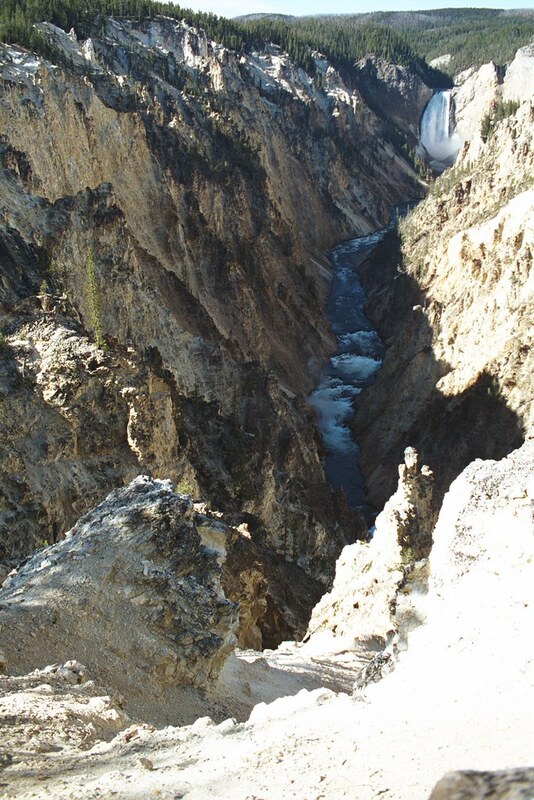 At this point, we had nearly given up hope, however as we were preparing to leave the Grand Teton National Forest, we decided to stop for a look around in a visitor center. 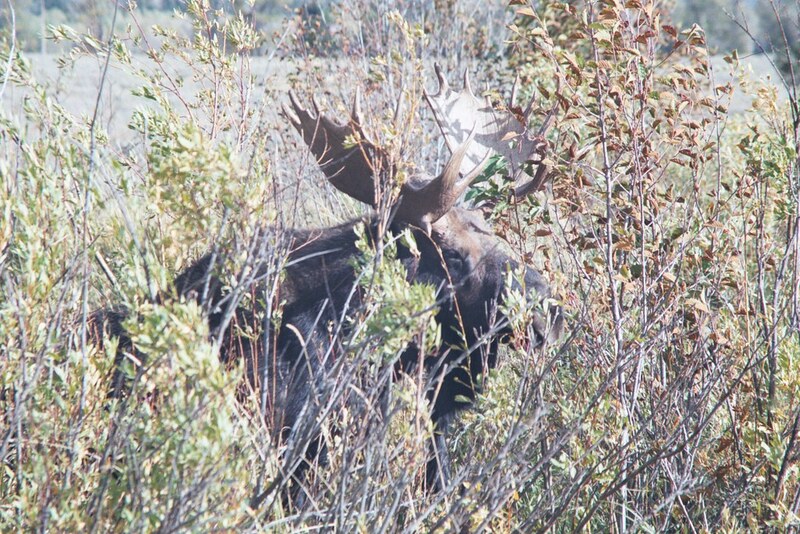 While there, I half-heartedly commented to a ranger about the possiblity of seeing a moose that afternoon. 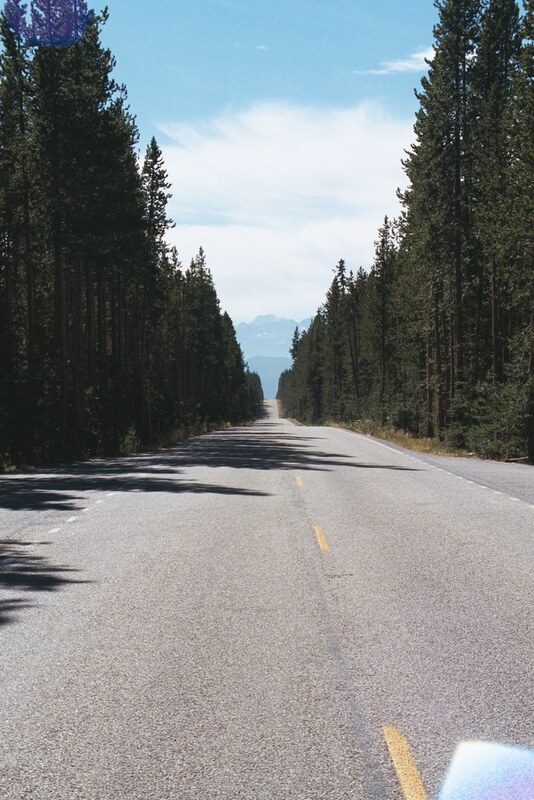 She said, "oh, there's one right now you can see down this back road." 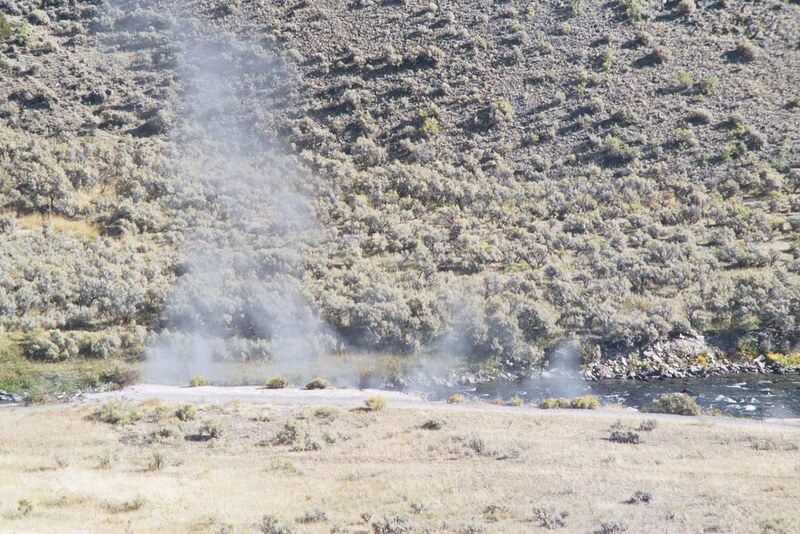 The station had just dispatched a ranger to be on hand to make sure people didn't disturb it, and also to clear traffic off the very small road. Needless to say, we high-tailed it out of the building and scooted down this back road (which we were actually going to try anyway, even before we went into the visitor center). 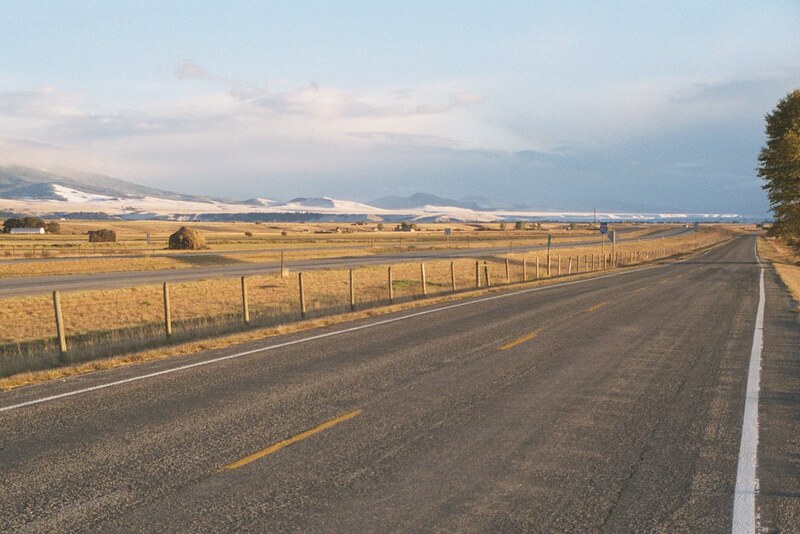 Sure enough, a little ways down the road, cars were parked all over the place. 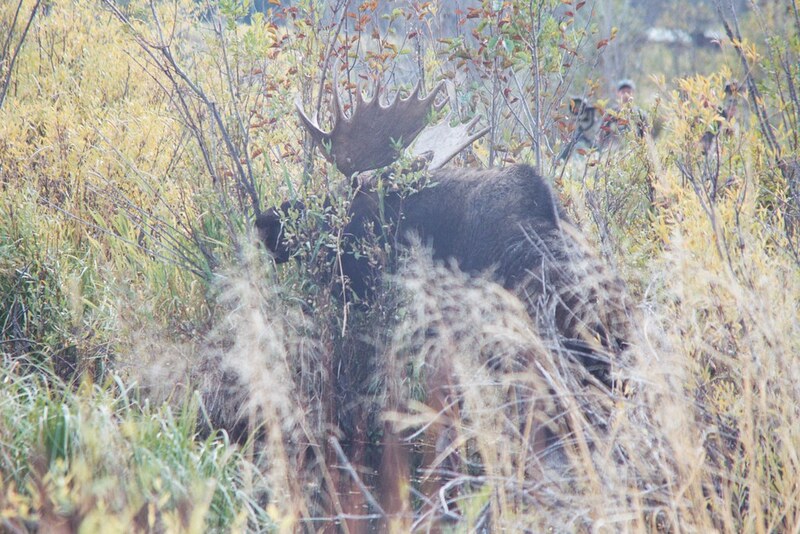 We got out, walked ahead a few hundred feet, and were greeted by this nice-sized bull. 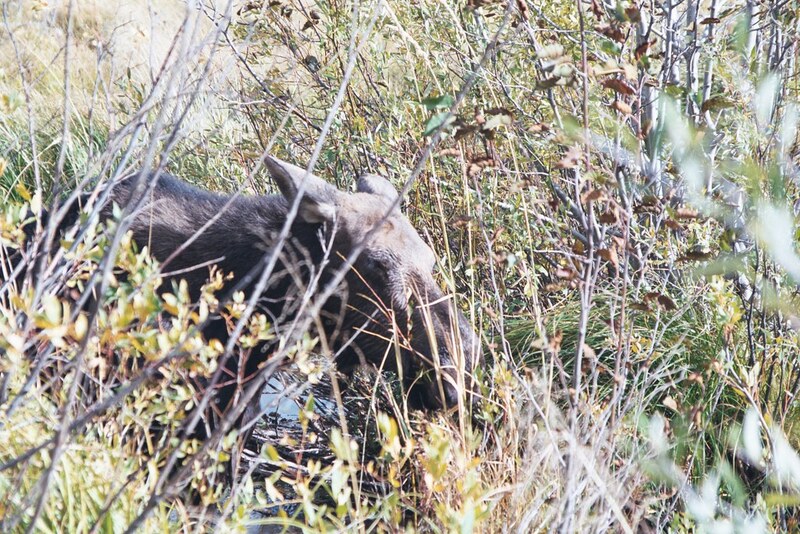 I was so caught up in taking pictures of the bull, I nearly missed the fact that only a few feet from where I was taking the pictures, a female moose was nestled down in the marsh! 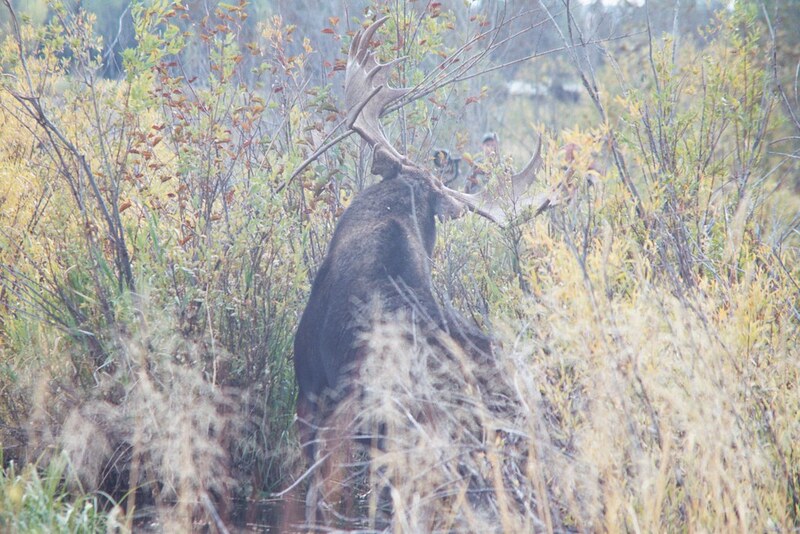 The bull finally came up out of the marsh to show off how big he was. 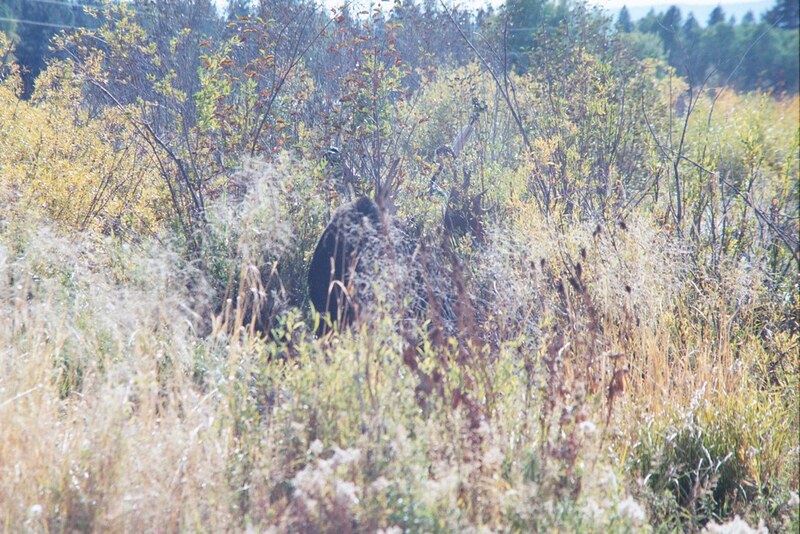 When he started trotting through the marsh, it was downright comical watching all the professional nature photographers. 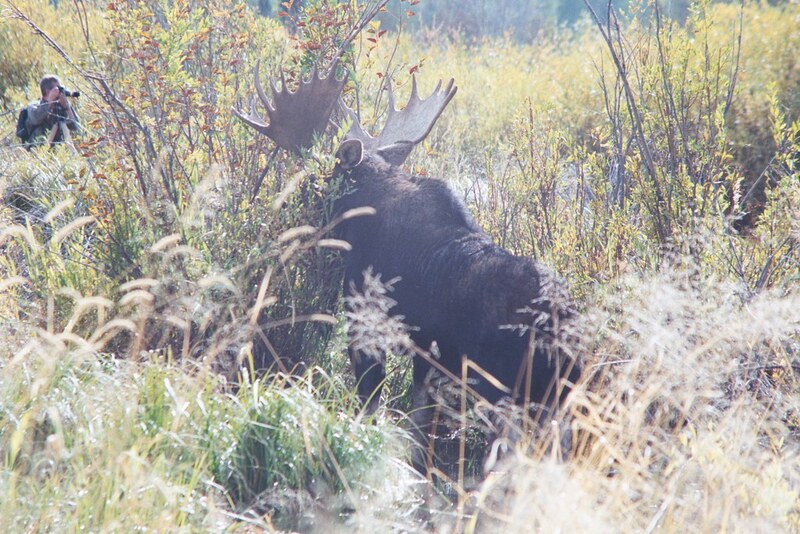 They were all down in the marsh with high-legged rubber boots, taking their pictures of the moose until he started moving. 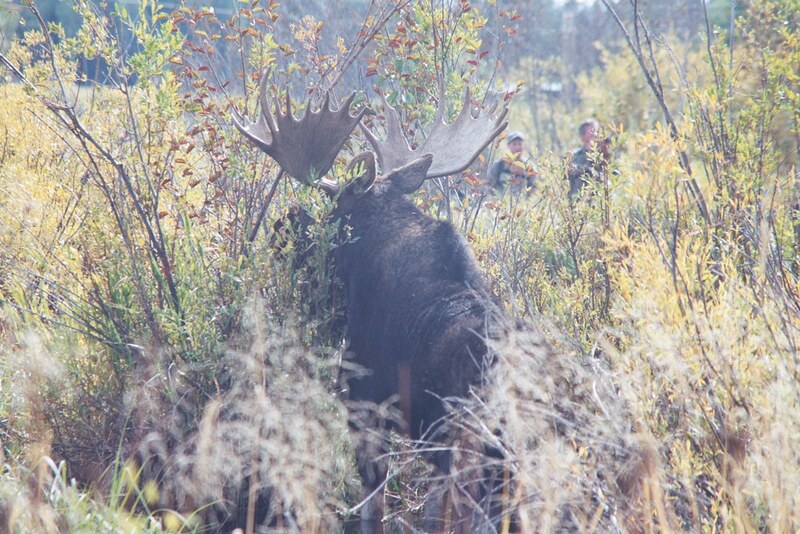 At that point, photographers in the path of the bull scrambled, heavy cameras and tripods in-hand, to get out of its way. 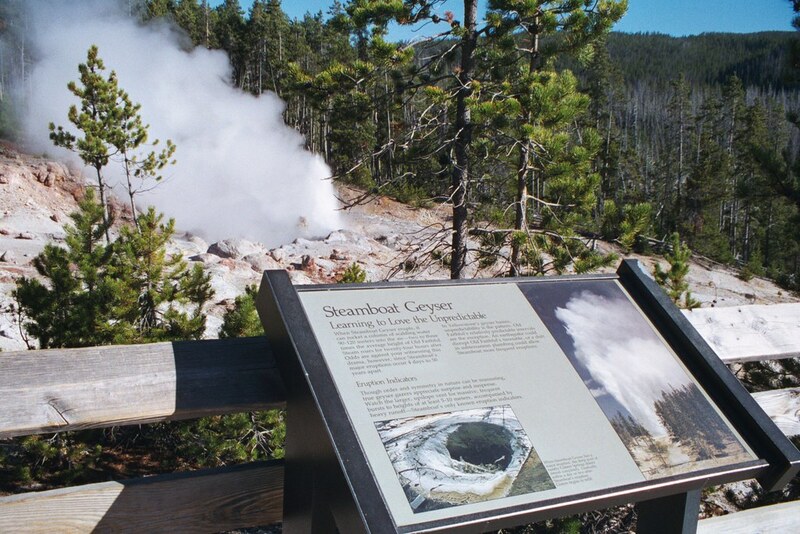 Smart idea, considering that my mother had read a few days before that some guy had been out in the Yellowstone wilderness and ended up getting gored in the head and killed by a moose. 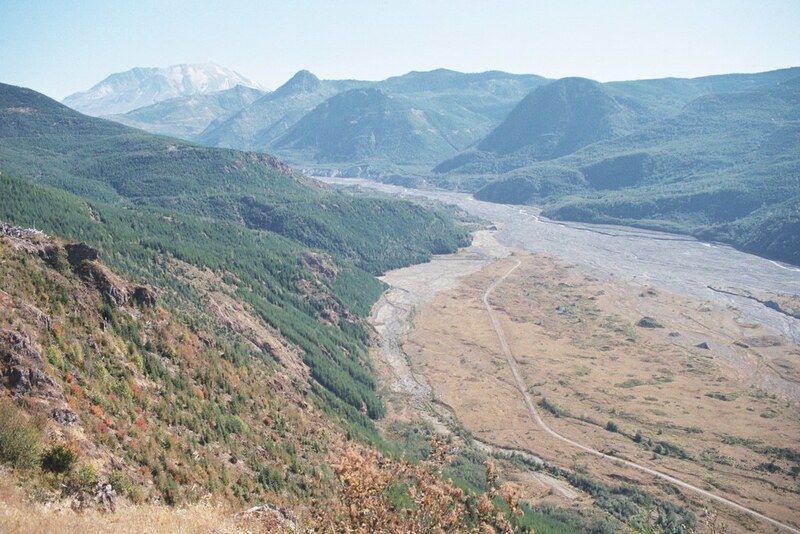 I'm truly unsure what and where this photo is showing, which probably explains why I didn't include it in an early version of this Northwest US photo album. 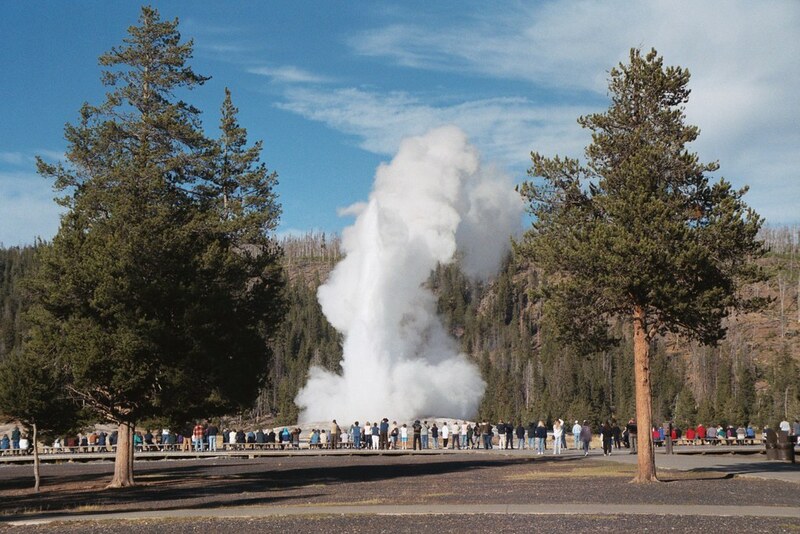 After two-and-a-half days in Yellowstone and the Grand Tetons, we spent the latter hours of Thursday, and all of Friday driving back to my brother's house near Seattle. 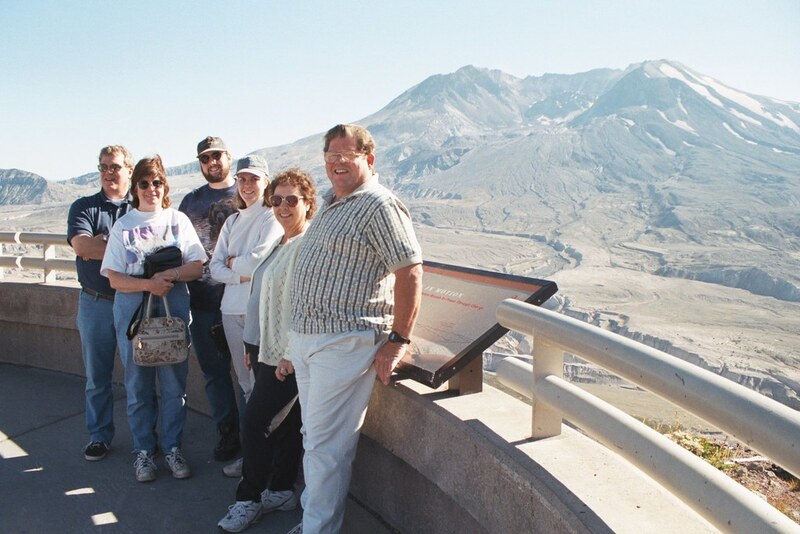 Saturday afternoon, the five of us, in addition to my brother's in-laws, took a trip to Mount St. Helens. I was quite excited about this trip. 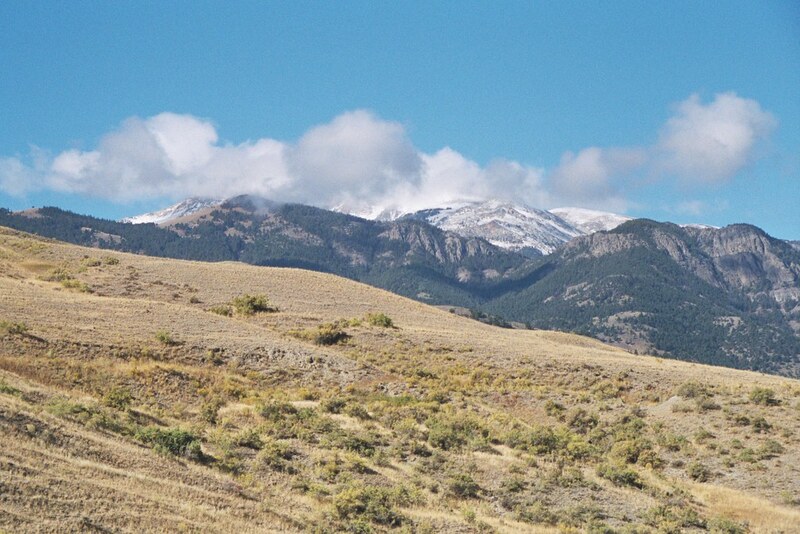 This photo was our first glimpse of the mountain, though it was still 15-20 miles away. 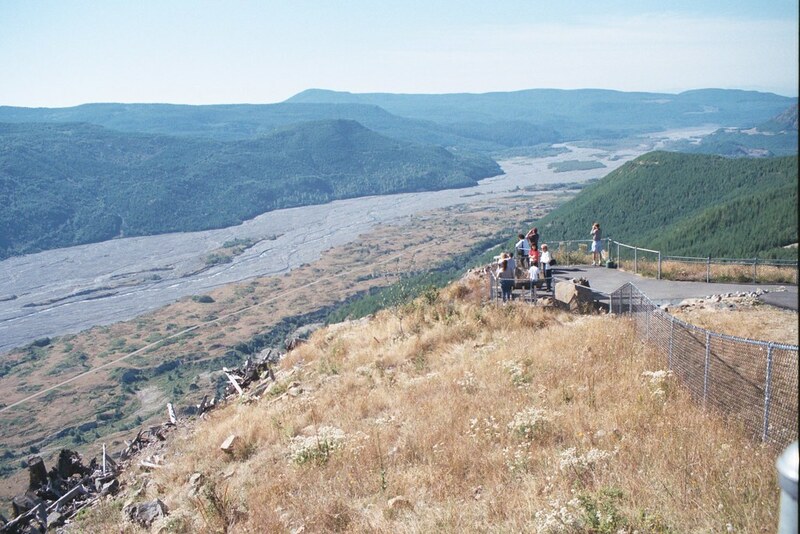 Widening out from the prior shot, you see the enormous path created by the mud flow that resulted from the eruption. 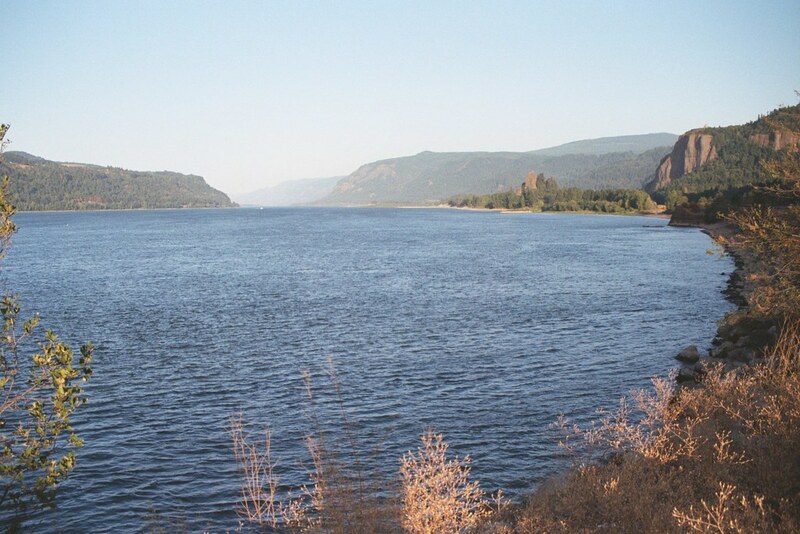 …and turning to look the other direction, the mud flow continued for miles, reaching Snake River, passing through Portland, Oregon, and eventually winding up in the Pacific. 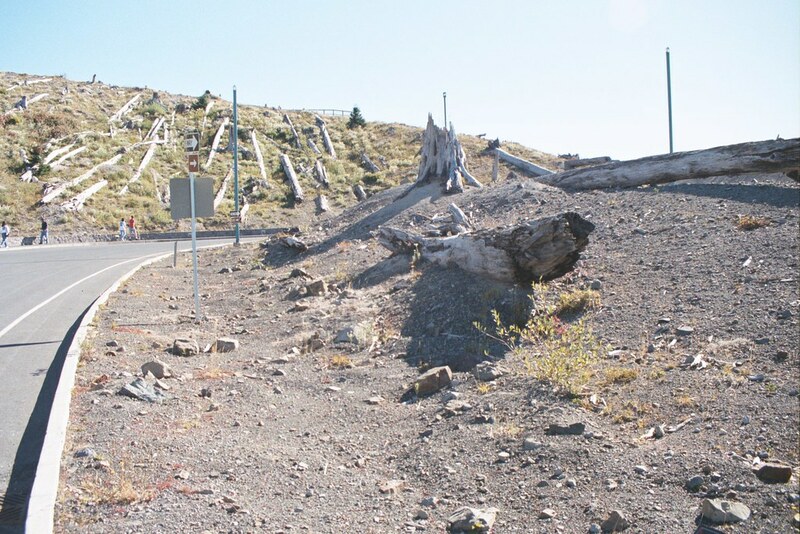 In the parking lot of the main viewing area, one sees how the blast literally snapped trees and laid them down like matchsticks. And then, it was in front of us, but still about five miles distant. 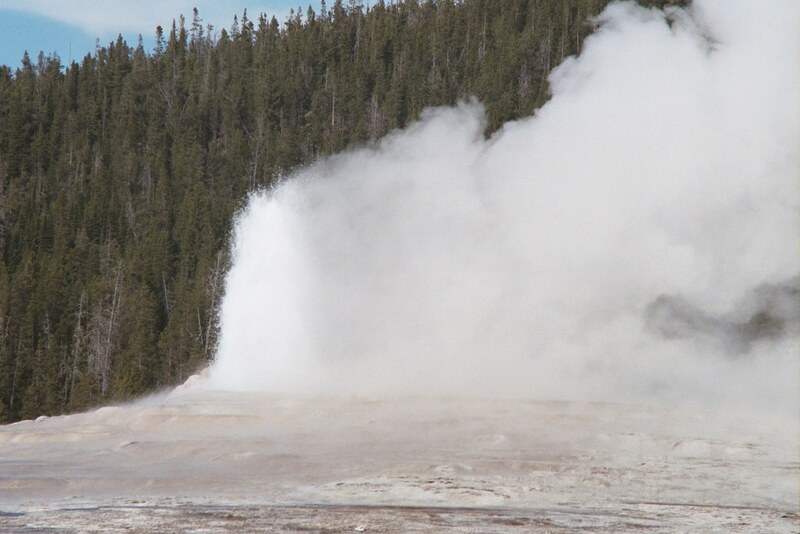 A formerly magnificent mountain peak, now sporting a top that had blown to smithereens, looking as if an immense, celestial steam shovel had taken a big scoop off the top. 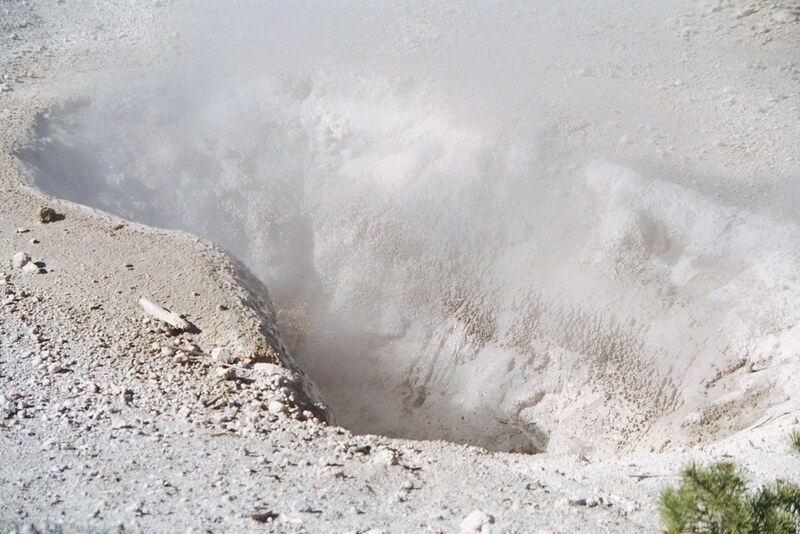 Zooming in on the crater, revealing the enormous lava dome that emerged after the eruption and continues to grow. 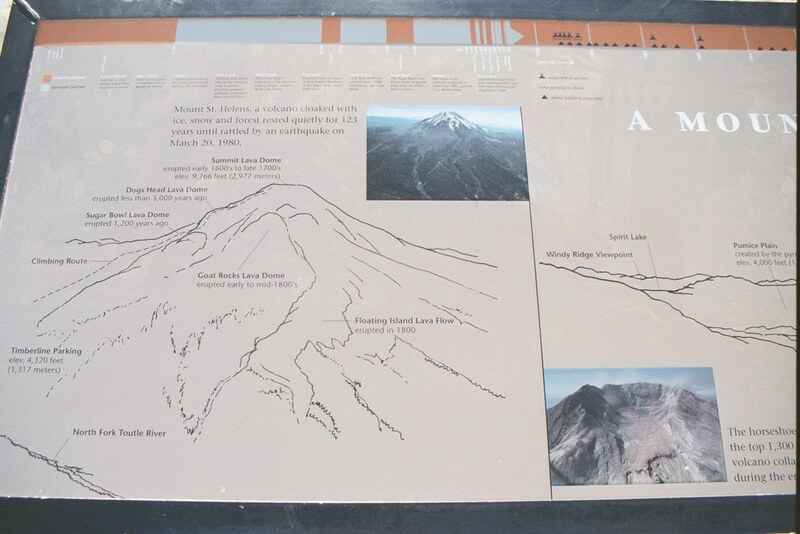 The left half of a board at the observation area which described the before and after of Mount St. Helens. 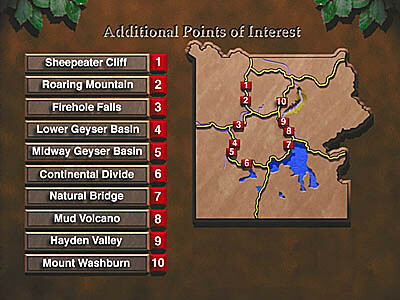 The left side points out the locations of various prior volcanic activity, much of it in the 1800s. 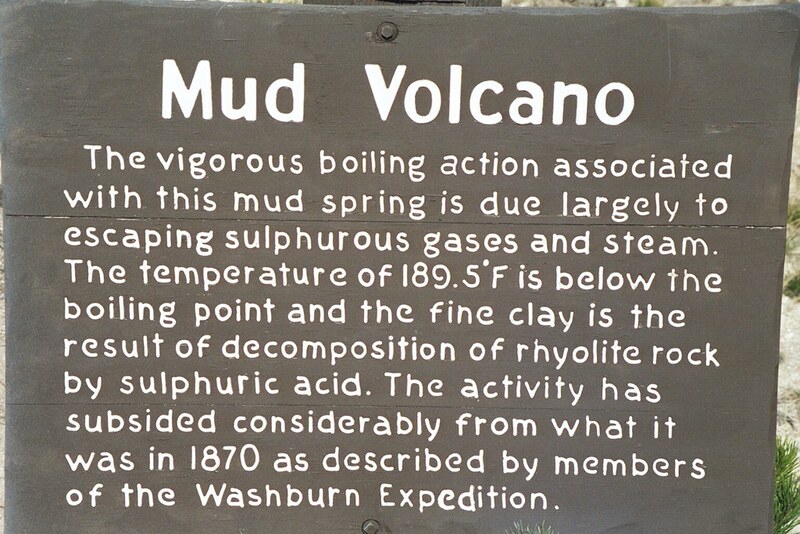 The right side of the sign describes various regions and the terrain the resulted after the eruption. 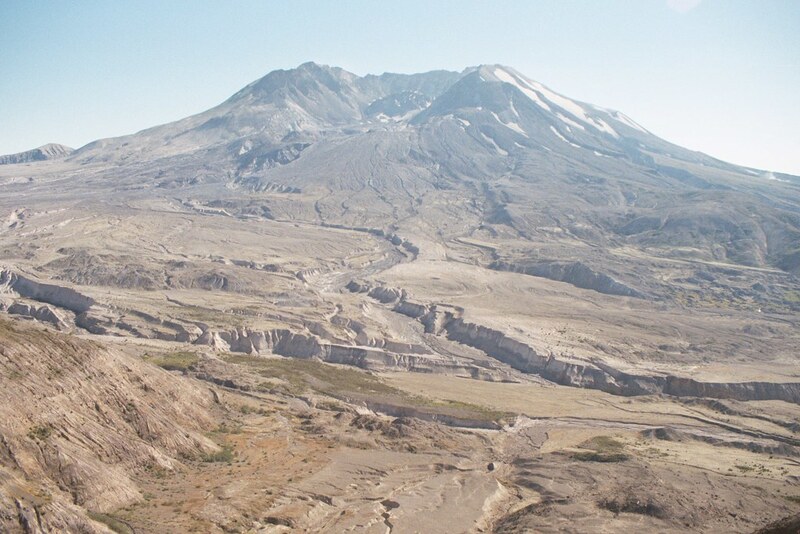 Formerly an extremely popular camping, fishing, and recreation area, the land at the foot of Mount St. Helens was immediately buried unimaginably deep in mud and pyroclastic flow. Obligatory "we didn't know you were going to take this picture with me in it" photo. 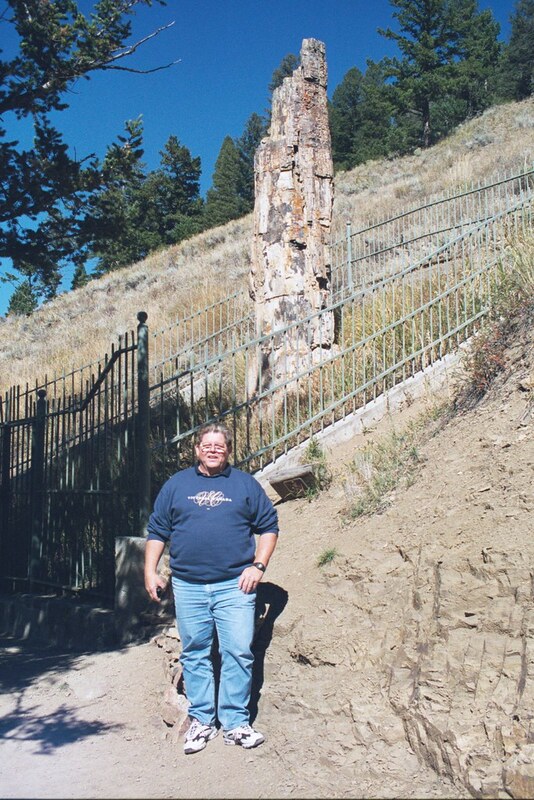 Standing here that day would not have been fun. 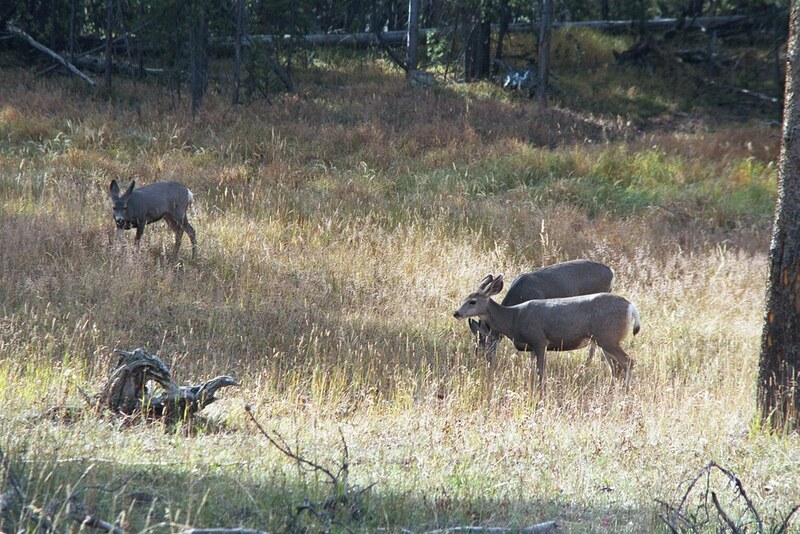 The wildlife had started to return. 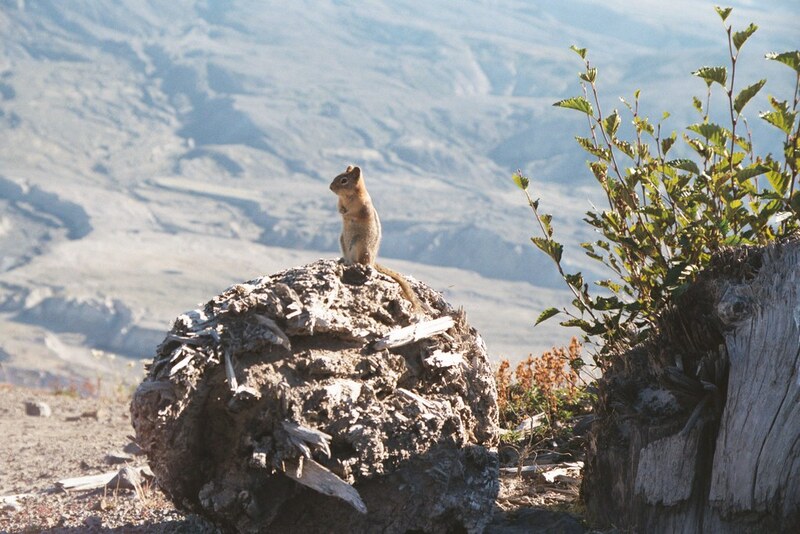 The little chipmunk seemed to be having a dandy time perched on top of a lava boulder, posing for several visitors. 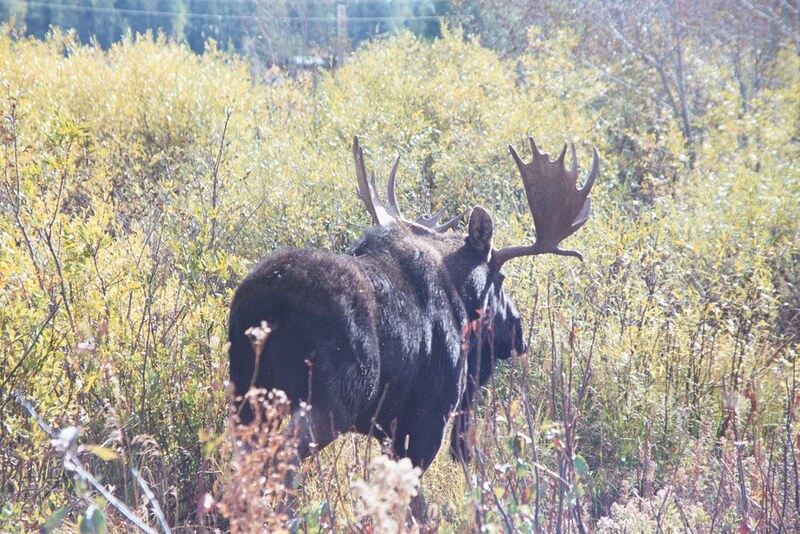 I managed to squeeze off a second shot, closer up, before he got spooked and hopped off the boulder. 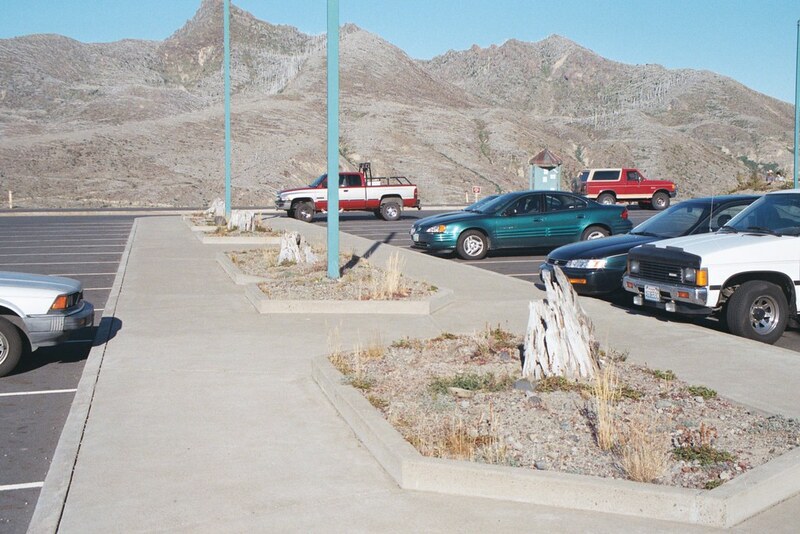 Parking lots frequently have planters between the rows of parking, containing trees, bushes, flowers, and/or light posts. 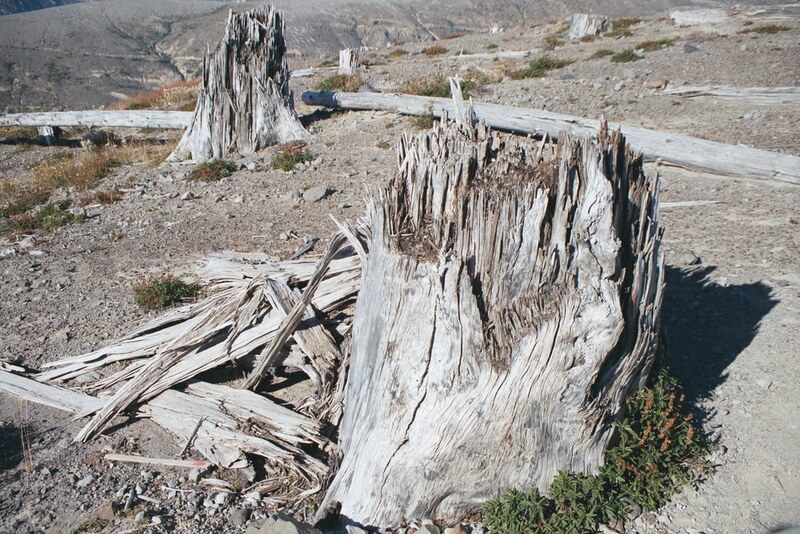 If any living material in such lots is dead, it gives a negative impression to the customers who are parking there. 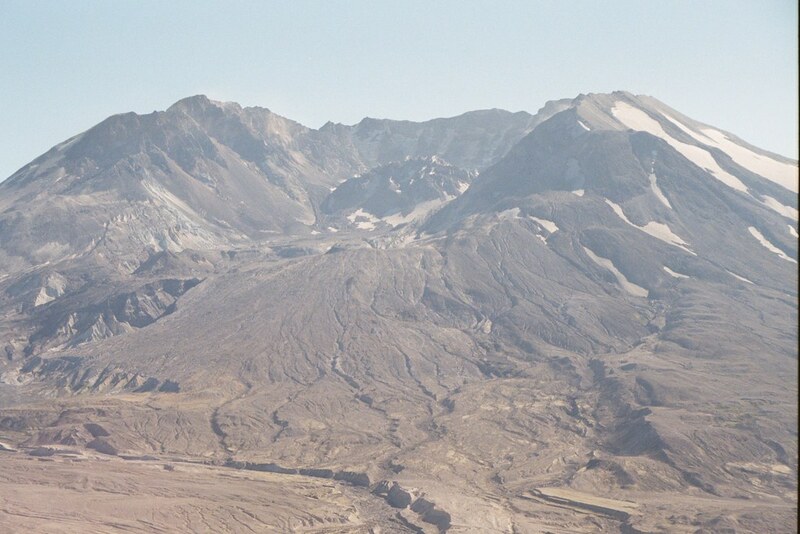 Mount St. Helens is the only place where that isn't true. I thought it was a creative touch putting the remains of trees in the planter spaces in the parking lot.